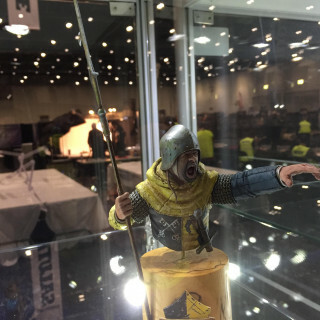 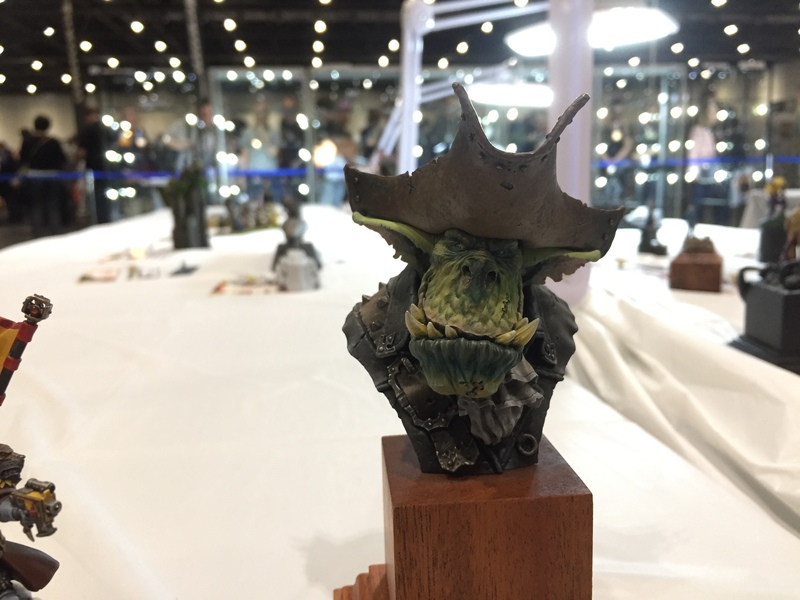 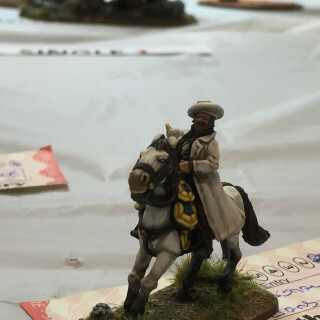 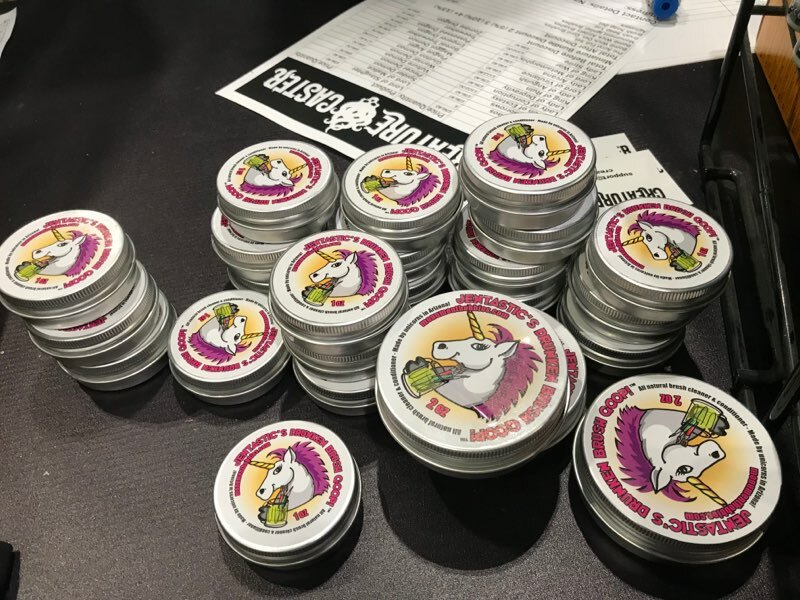 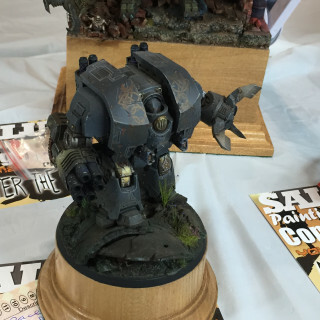 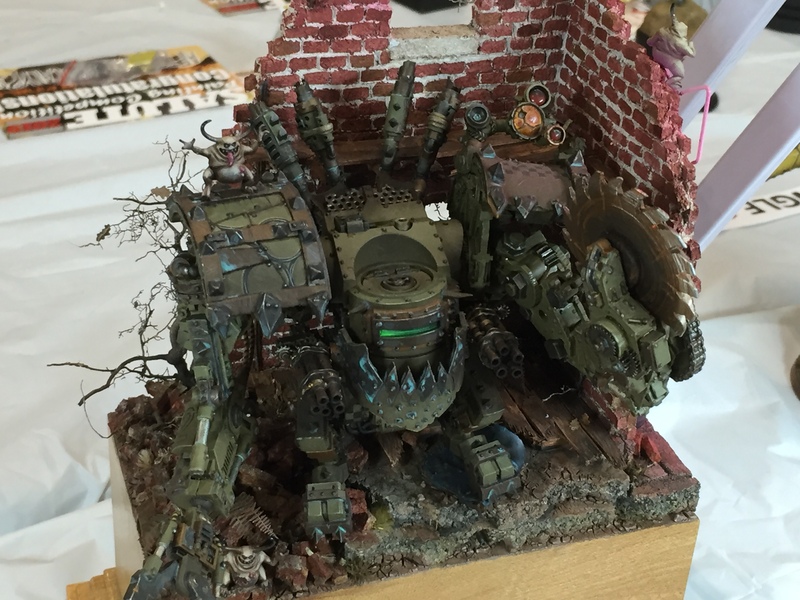 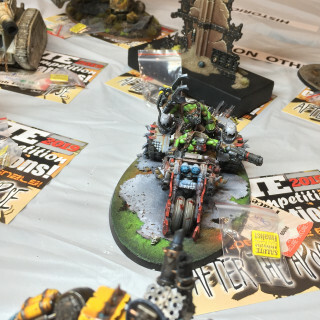 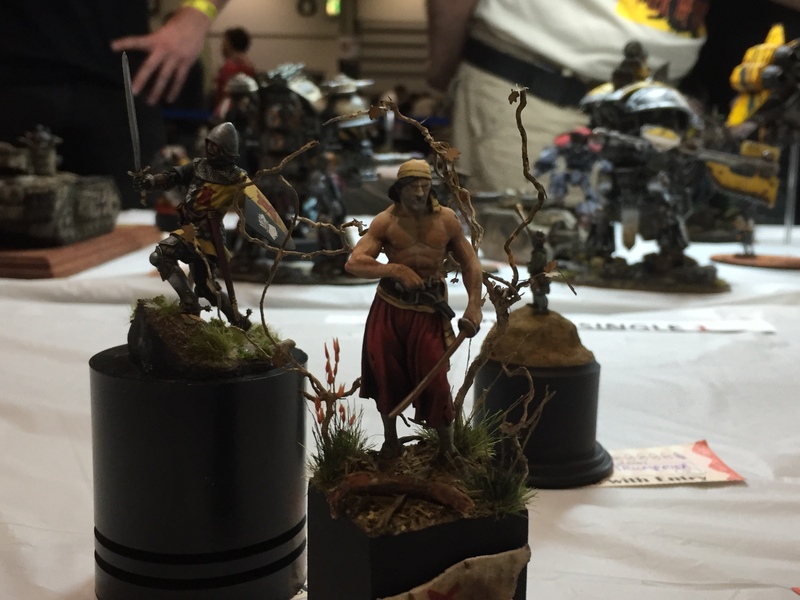 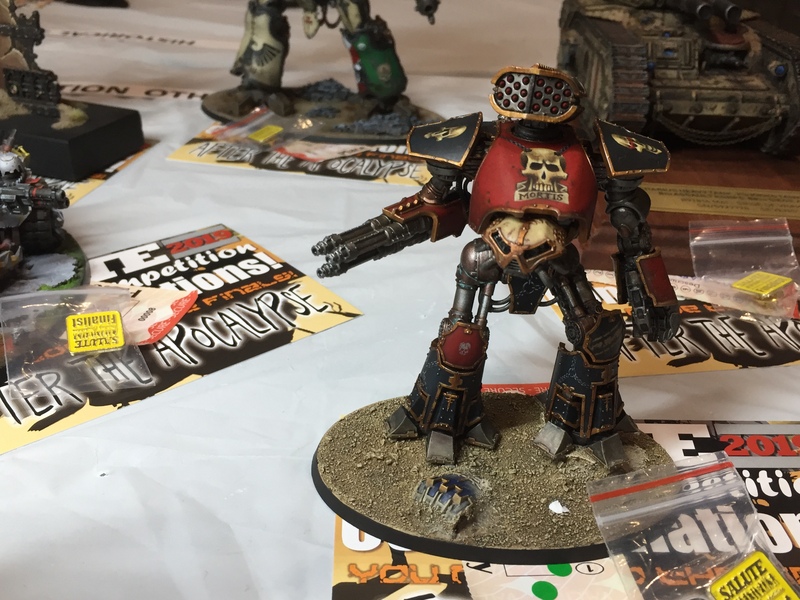 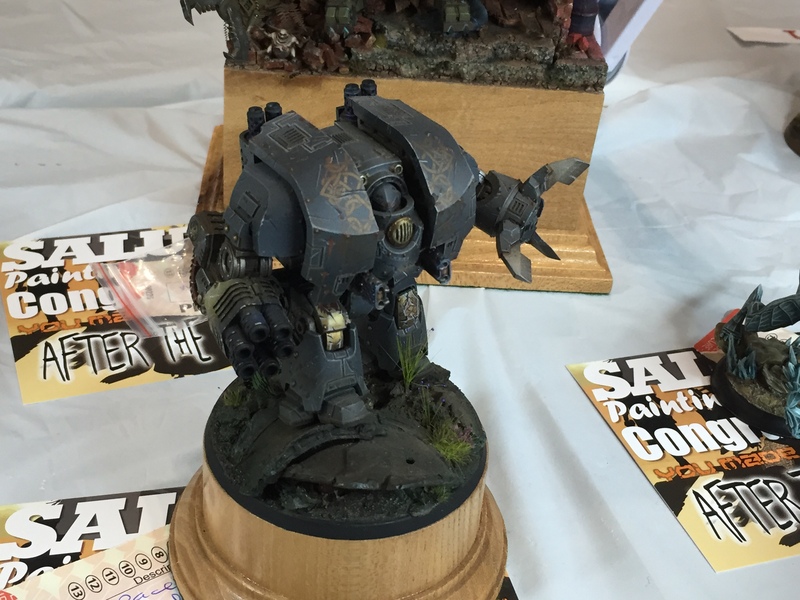 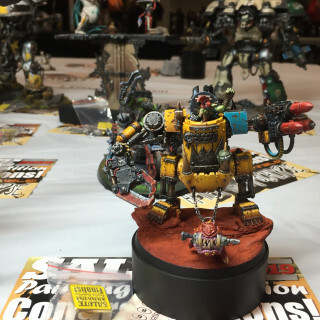 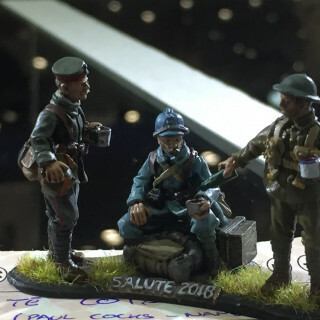 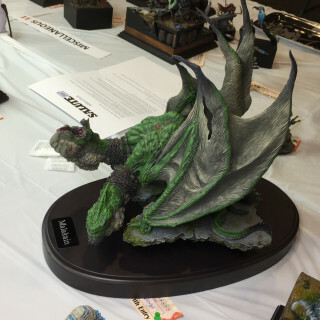 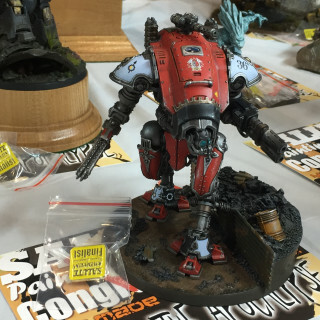 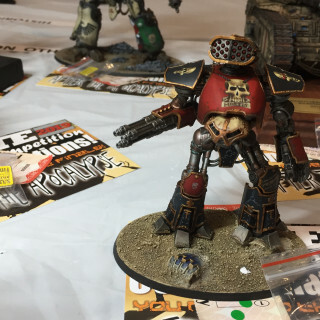 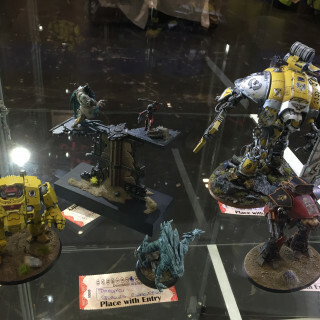 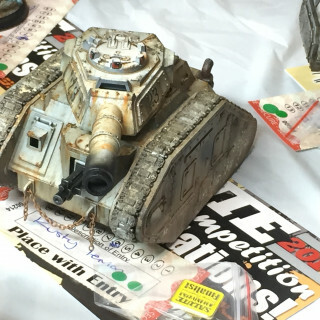 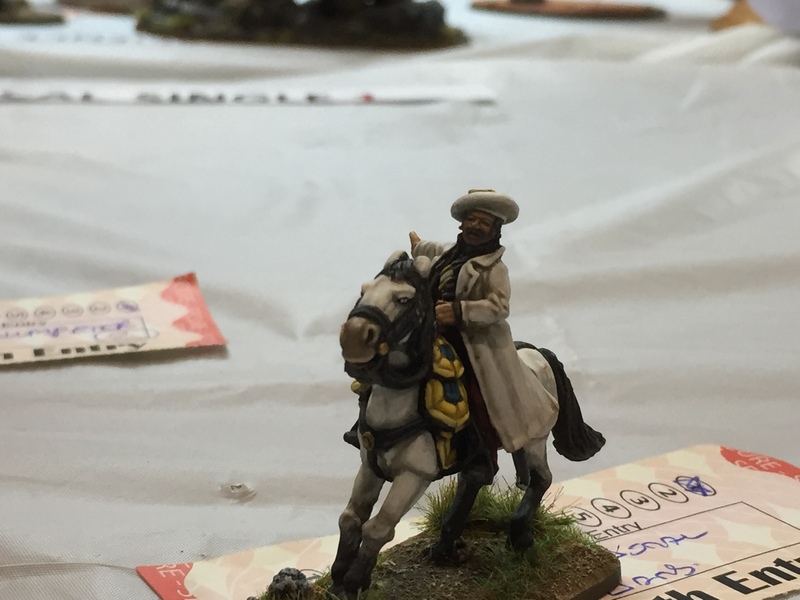 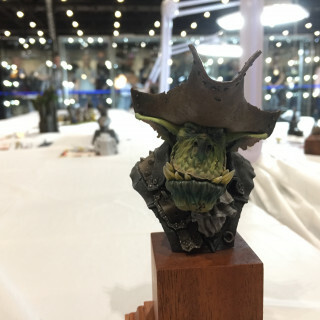 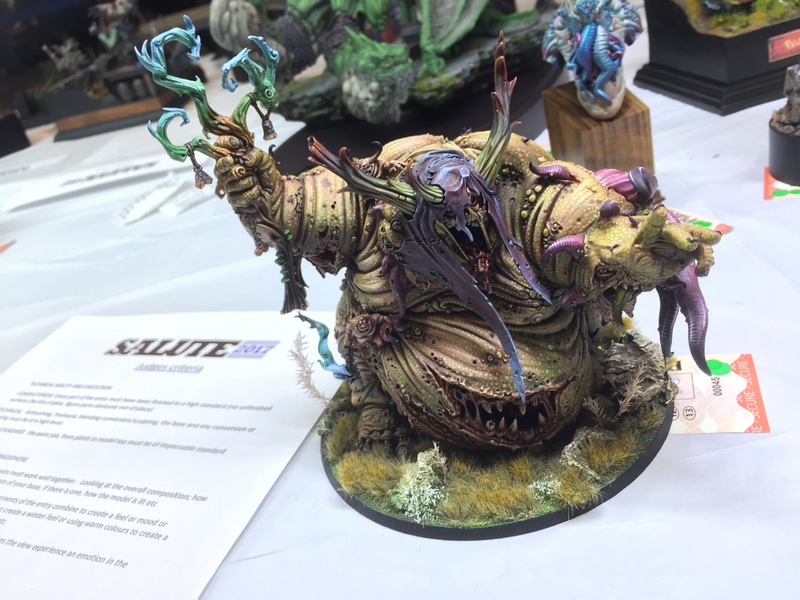 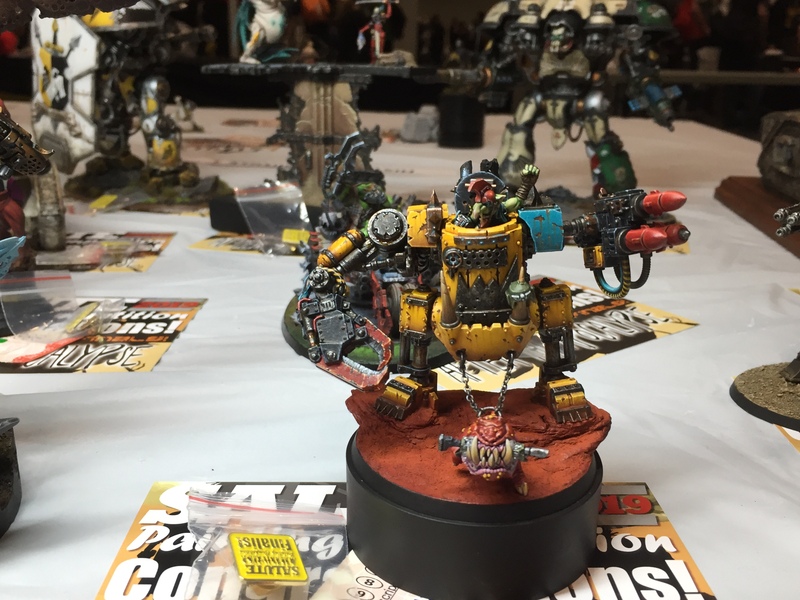 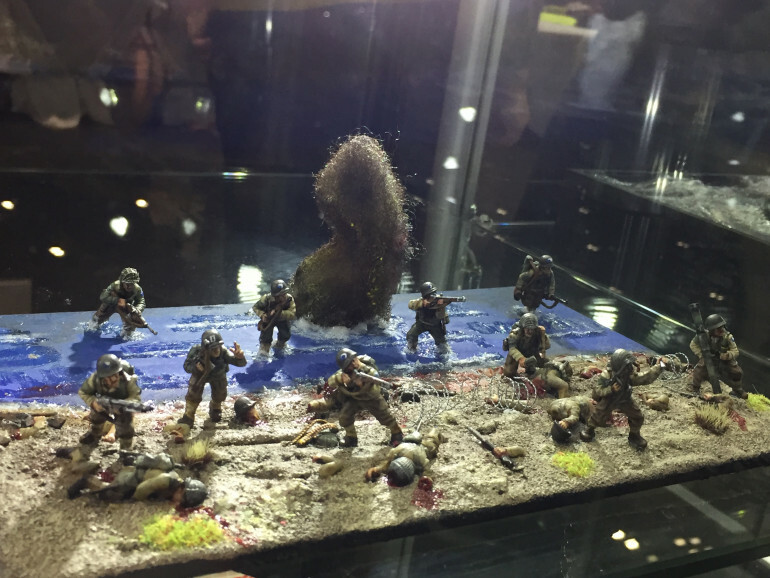 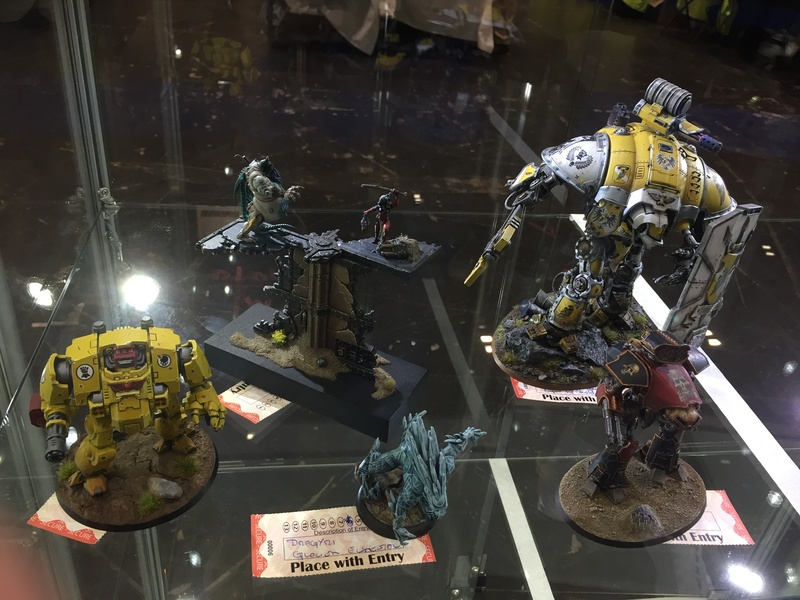 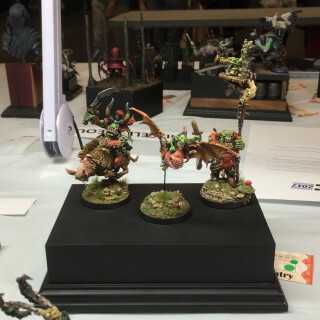 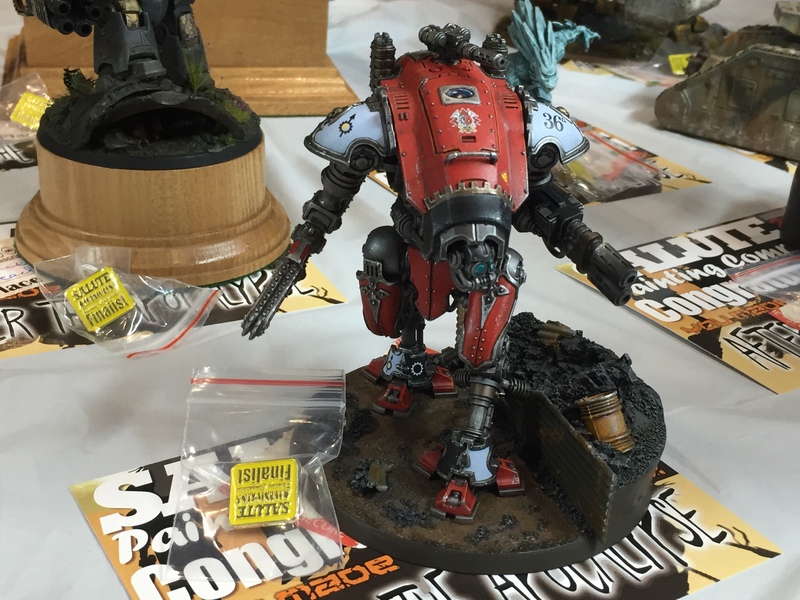 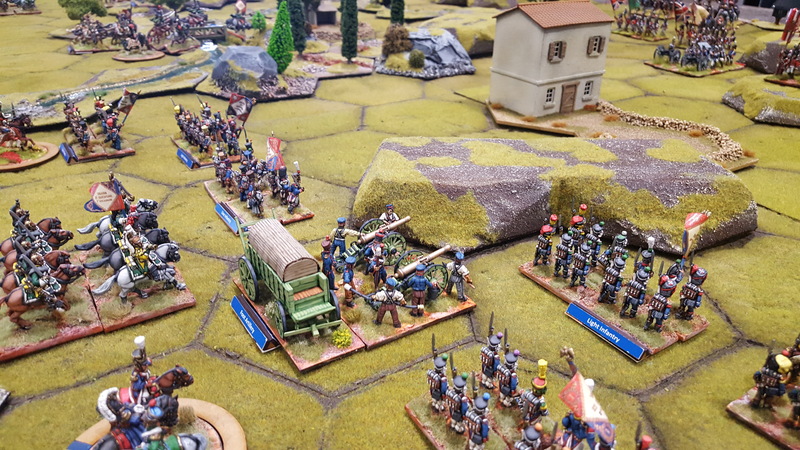 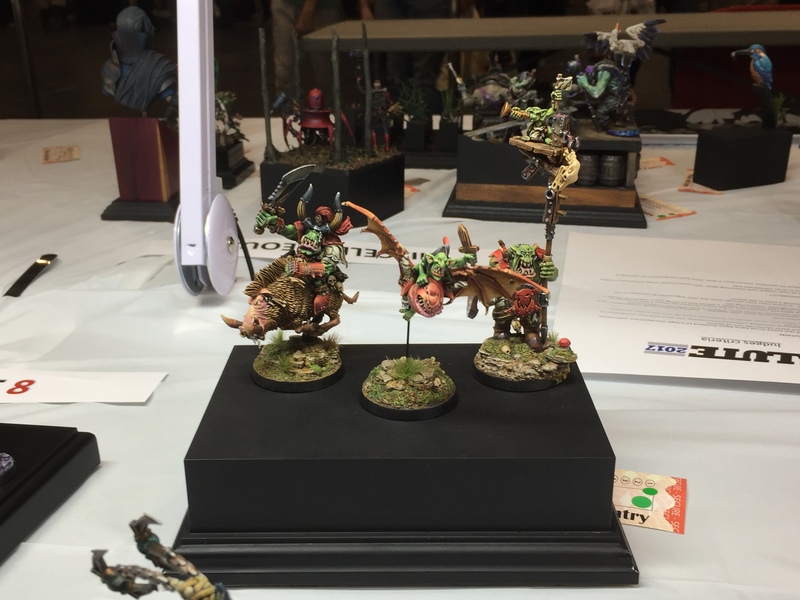 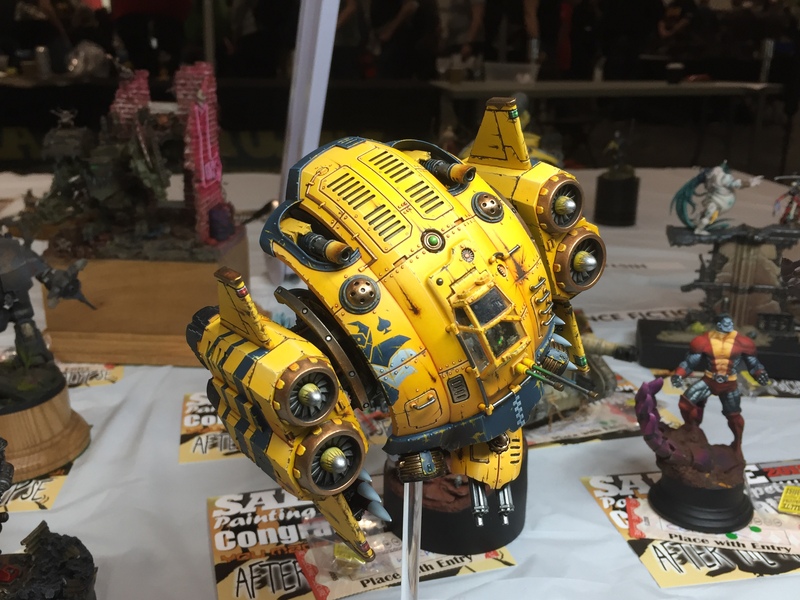 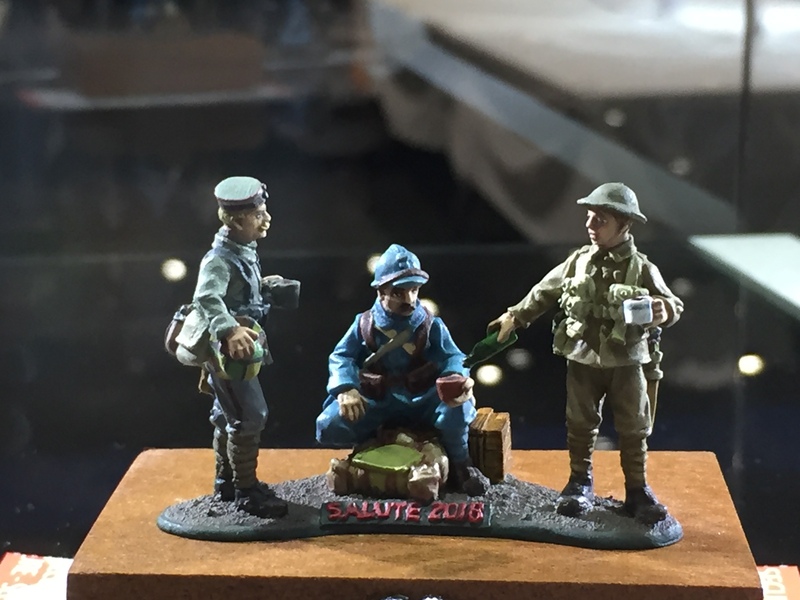 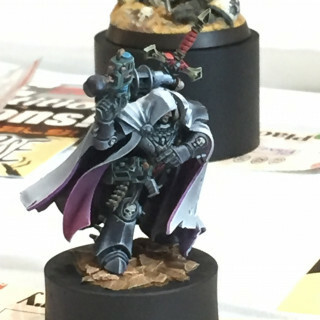 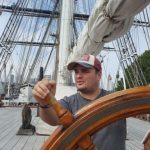 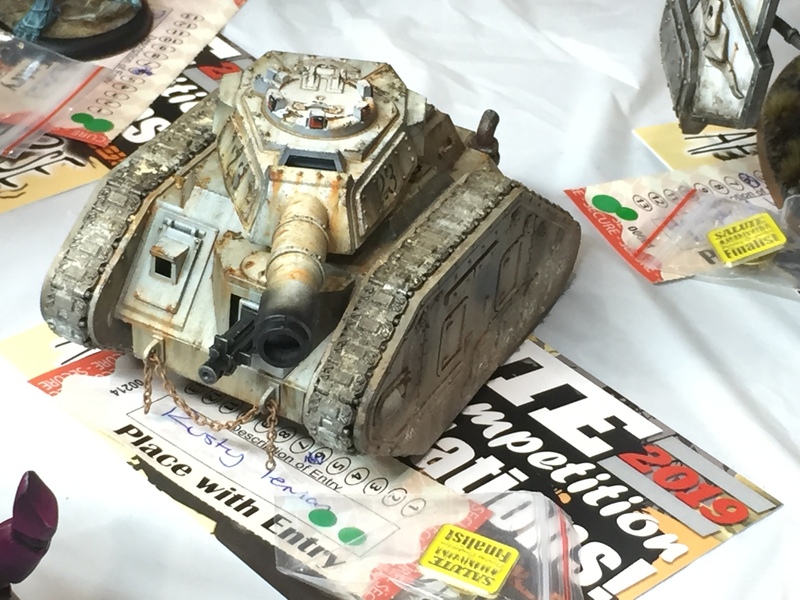 » Salute 2019 Live Blog! 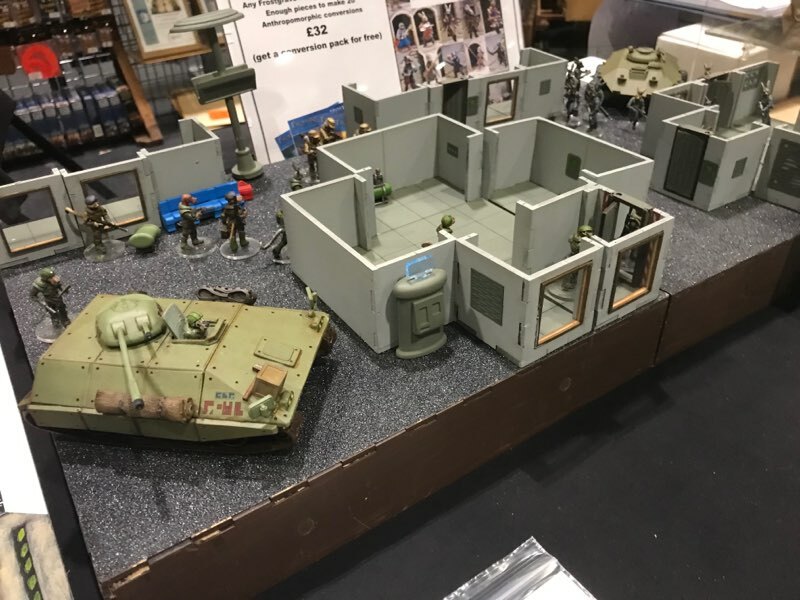 Make sure to get involved as we want to know who you'd love us to talk to here today and what miniature ranges you want us to explore too. 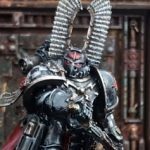 Prize List - Follow Links To Specific Prizes! 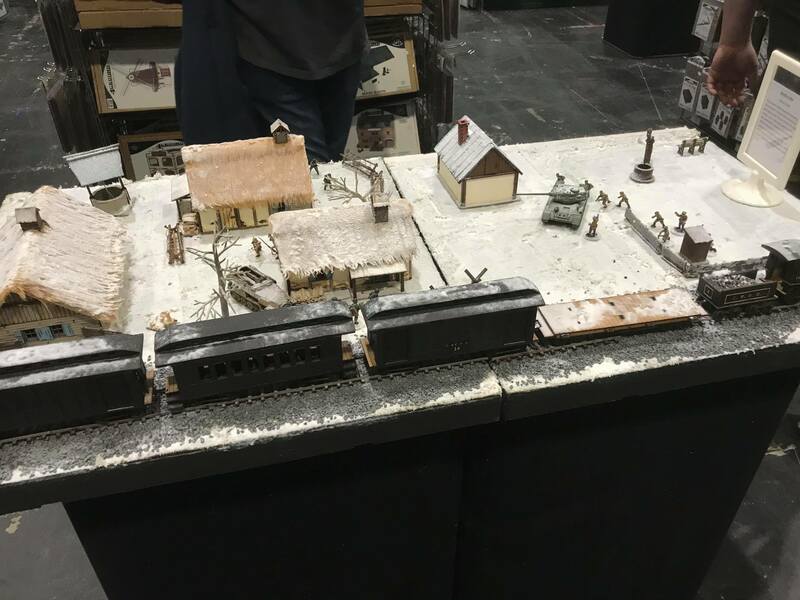 If you'd like to know more about the event itself you can find more information on the links below. 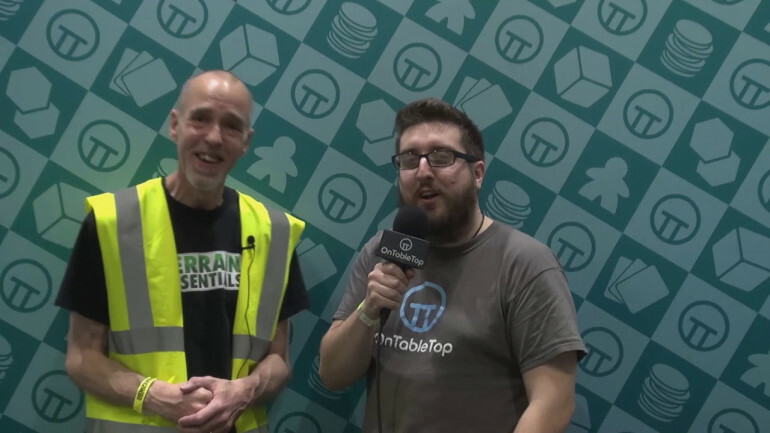 As always we'll have loads of prizes to give away to lucky winners too so there's plenty of reason to get involved and comment on the various videos we do throughout the day. 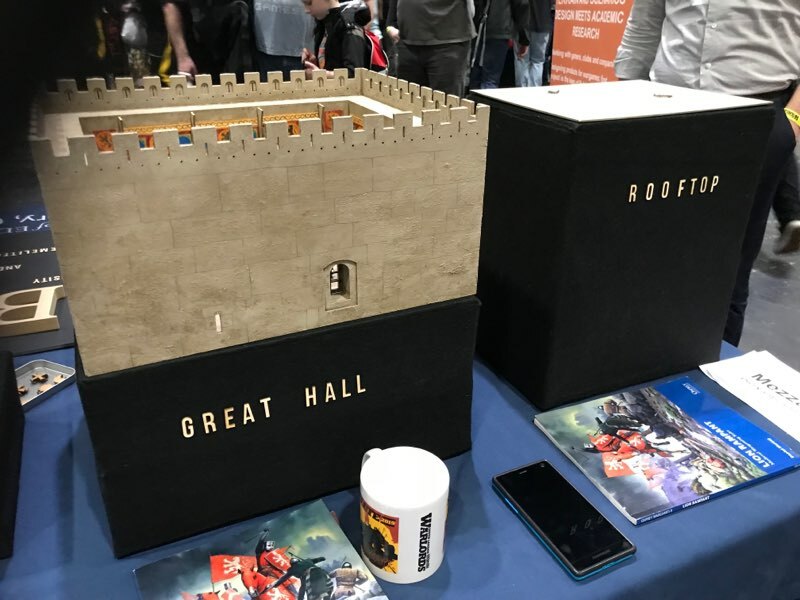 We’re going to be getting stuck into all sorts of awesomeness from the show here in London and that means prizes, talking to the vendors and finding out about all sorts of cool games that are being played too. 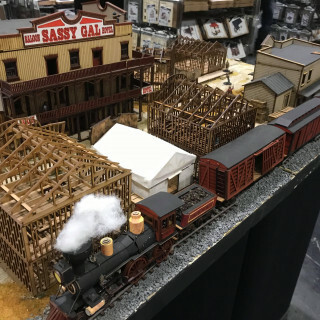 Make sure to follow us throughout the day as we’re going to be checking out everything that’s going on here at the show in as much detail as possible! 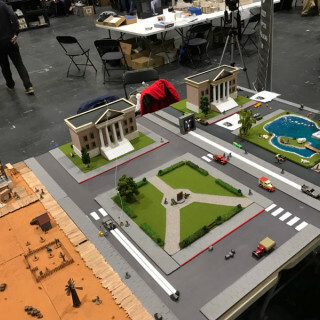 There are some fantastic tables taking shape here at Salute with some featuring over 1000 models! 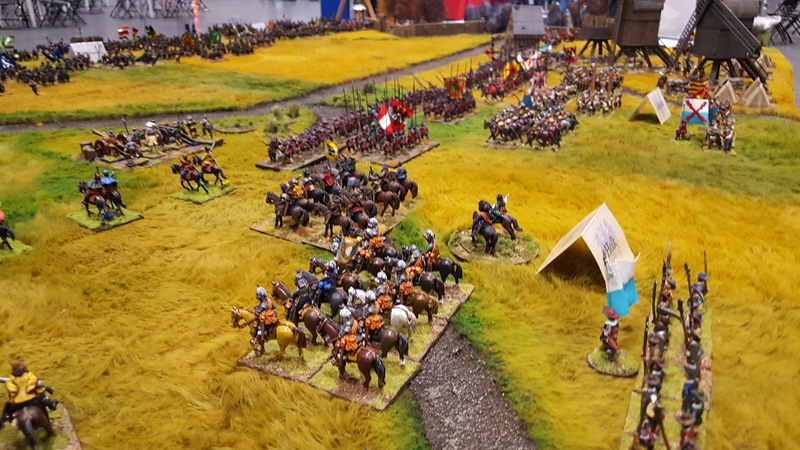 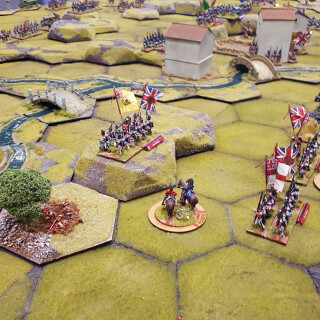 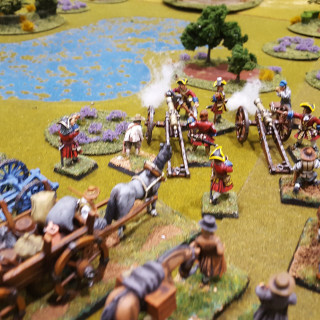 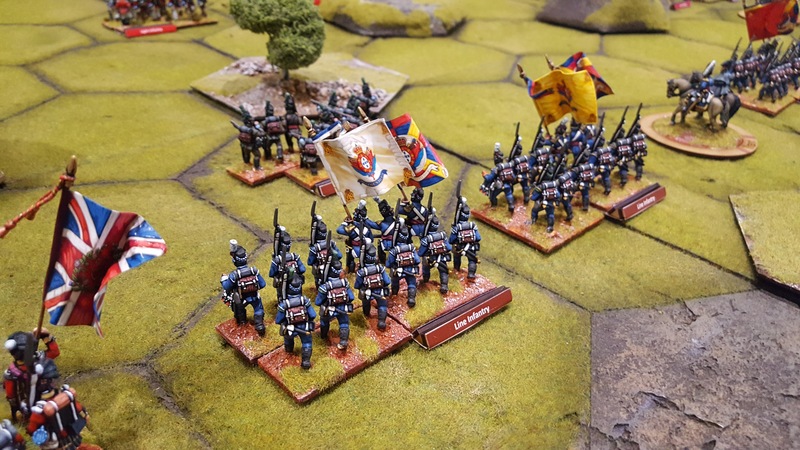 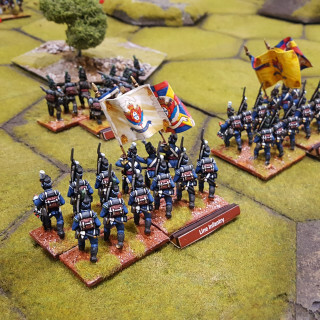 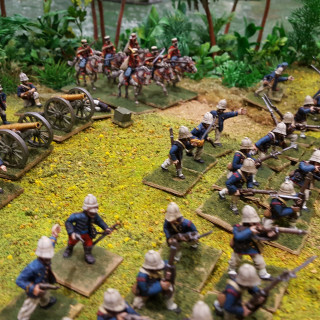 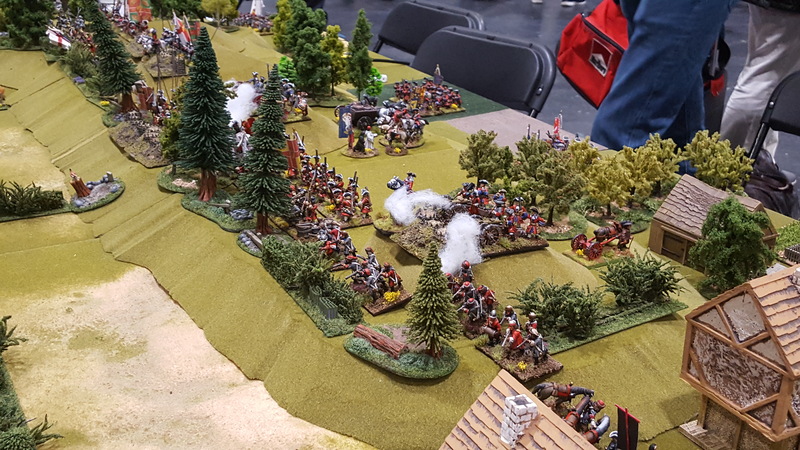 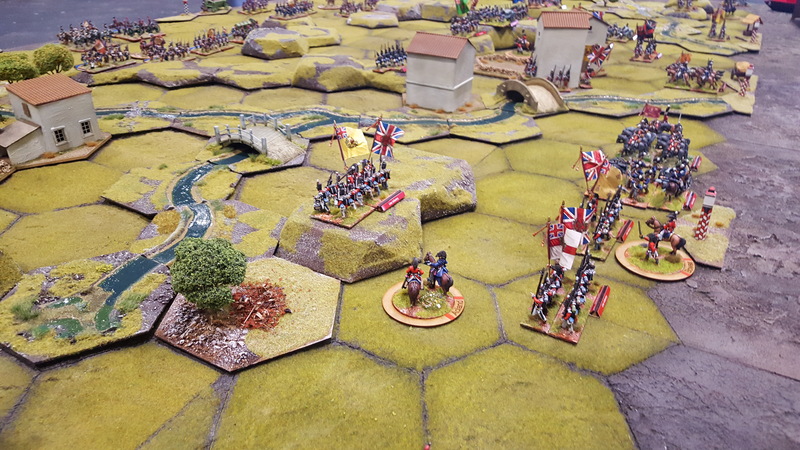 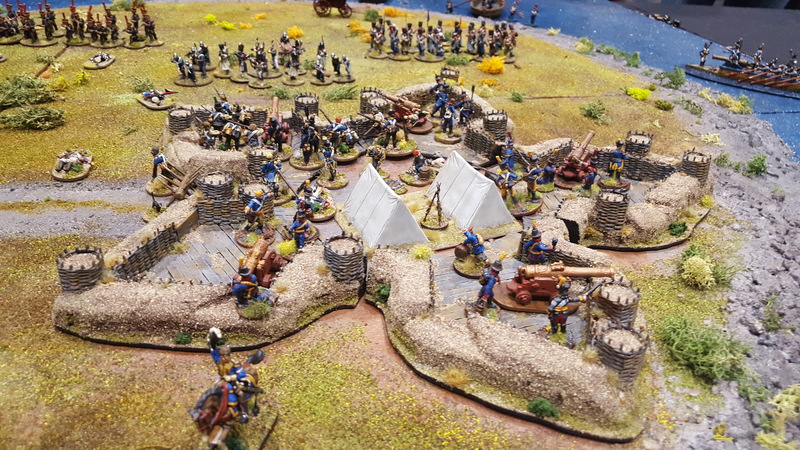 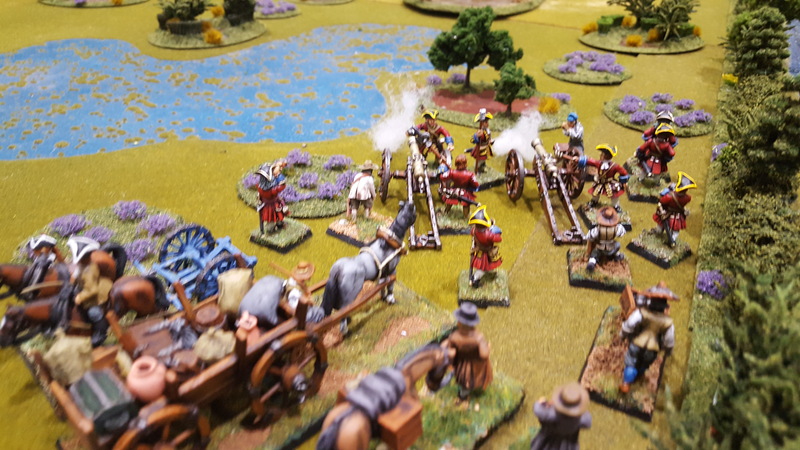 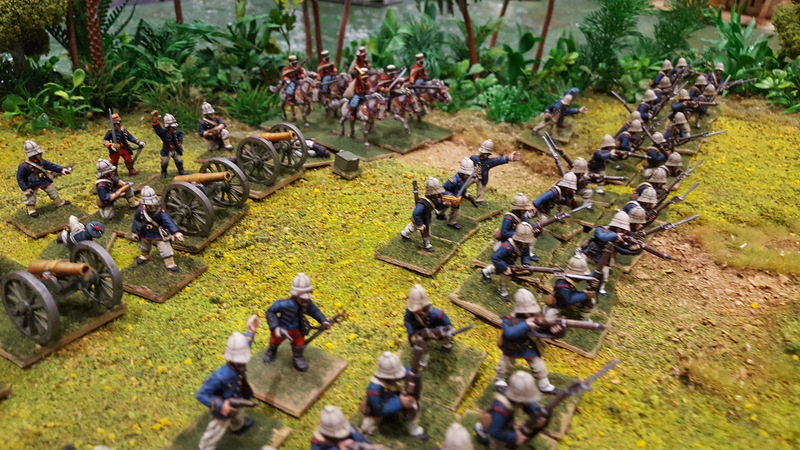 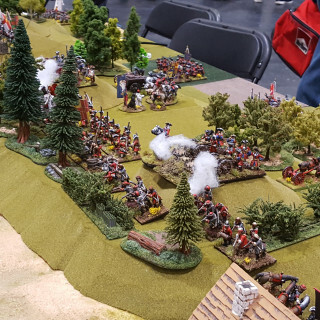 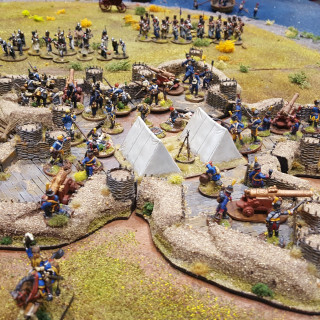 This is one of the massive Napoleonic clashes on the tabletop which uses hex-based movement to make it quicker and easier to play. 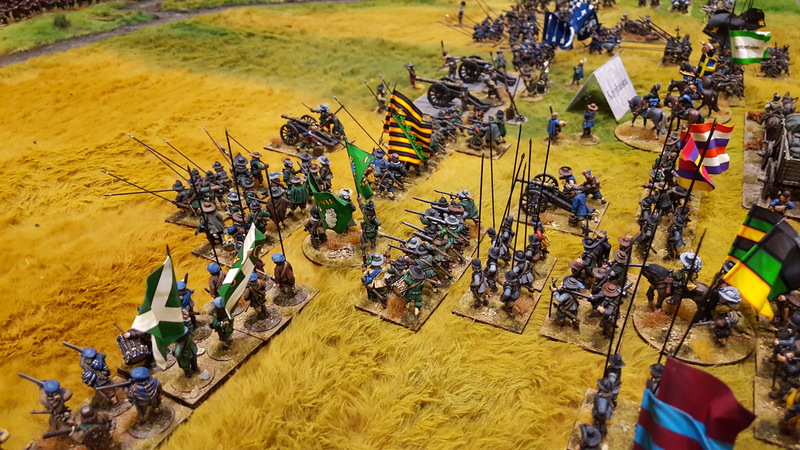 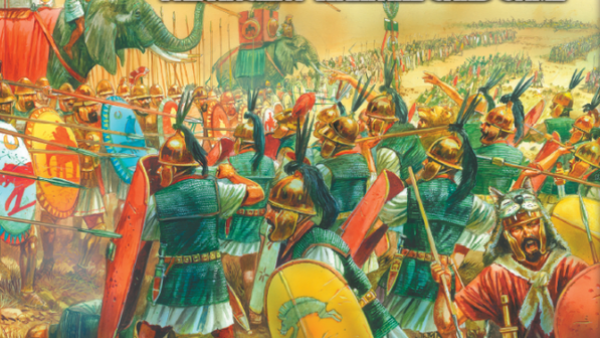 One of the key things is that the game focuses in on mechanics which deal with sections of the battlefield over single units making it a big, grand encounter. 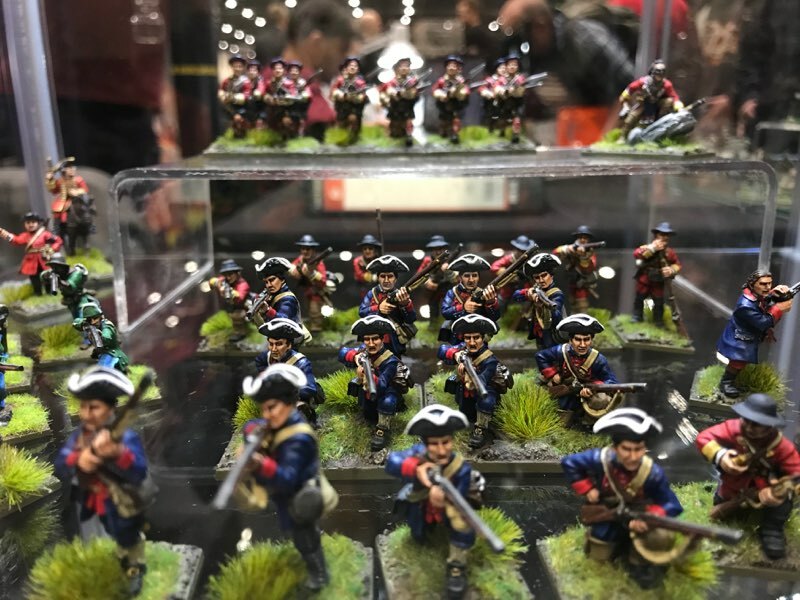 JUNIOR 12 – Junior Class – any figure or unit entered by a person up to and including 16 years old. 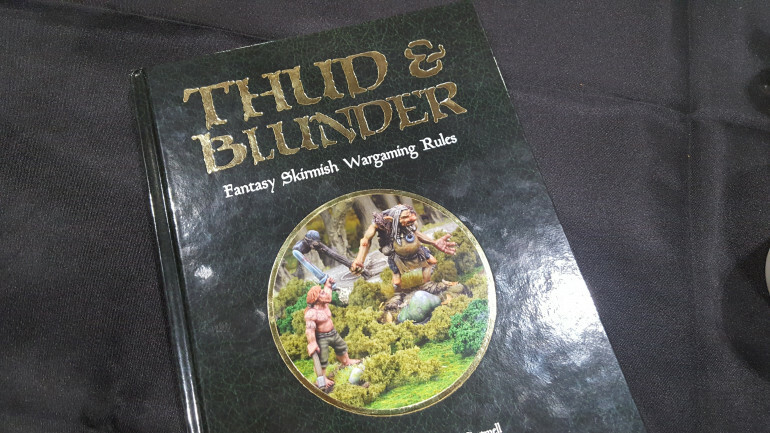 Winners announced at 3.30PM, and I’ll bring them to you around 4pm! 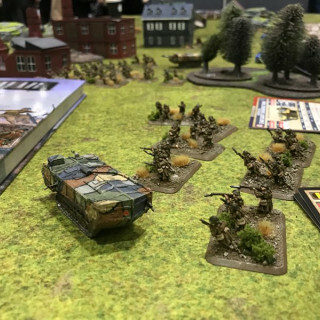 The Friends Of General Haig Talk About Their Demo Game! 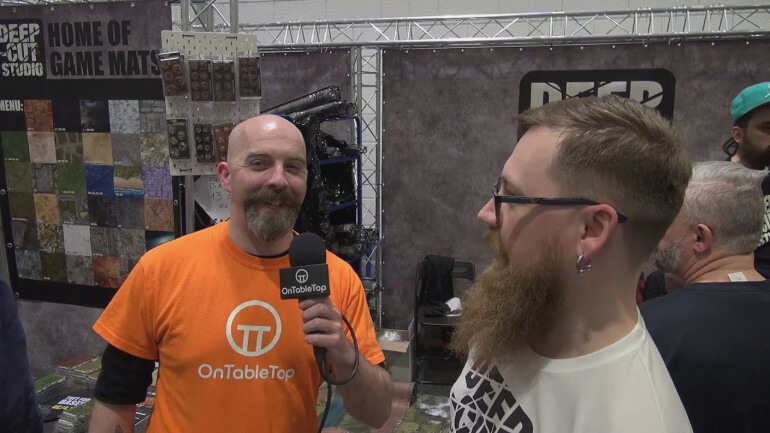 Gerry spotted a table which really caught his attention! 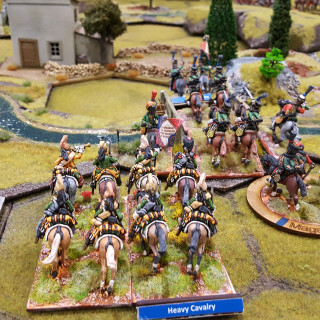 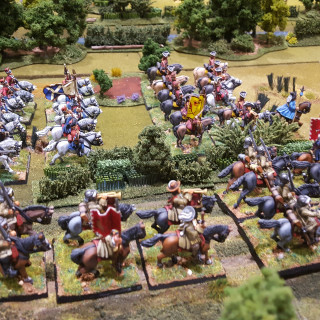 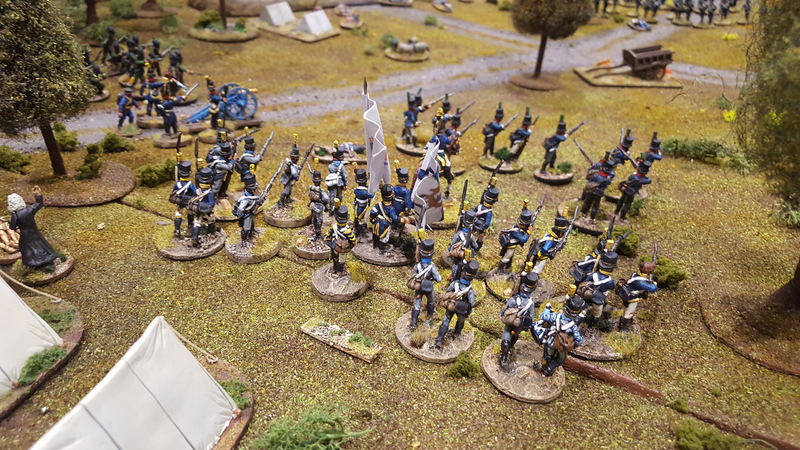 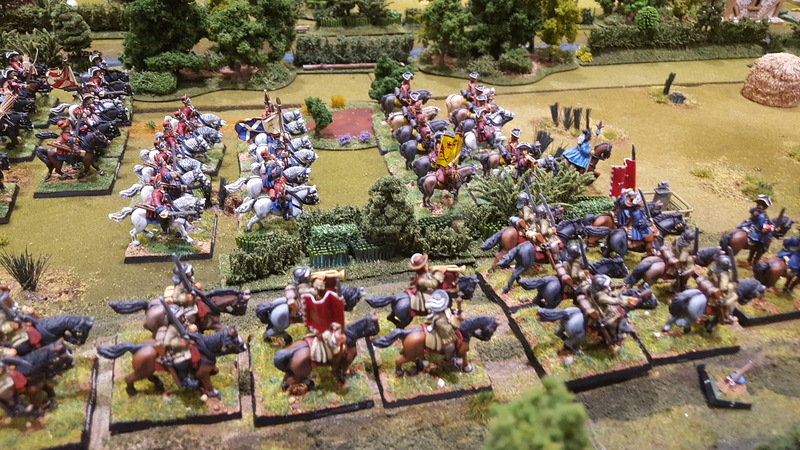 Come and check out this wonderful group from The Worcester Wargames Club, The Friends Of General Haig. 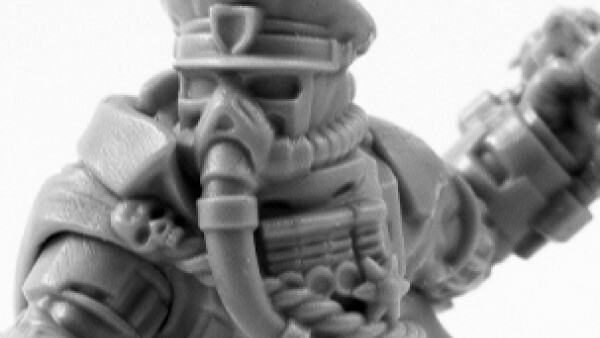 He has been delving down into everything that has been going on with this game. 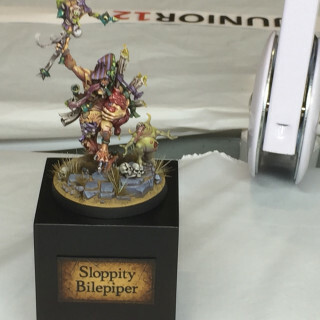 I have to say, I think he is rather taken with it! 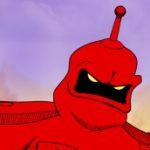 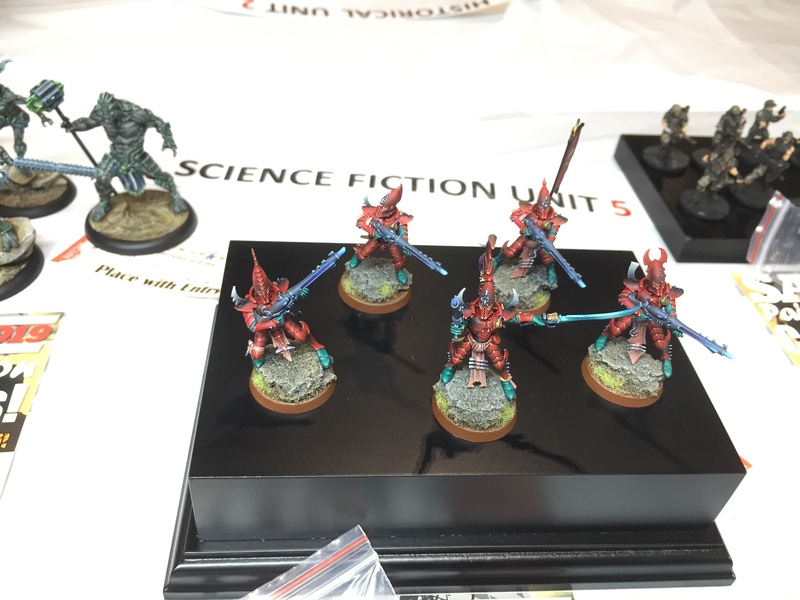 Bandua Wargames Talking About Their New Releases - WIN Prizes! 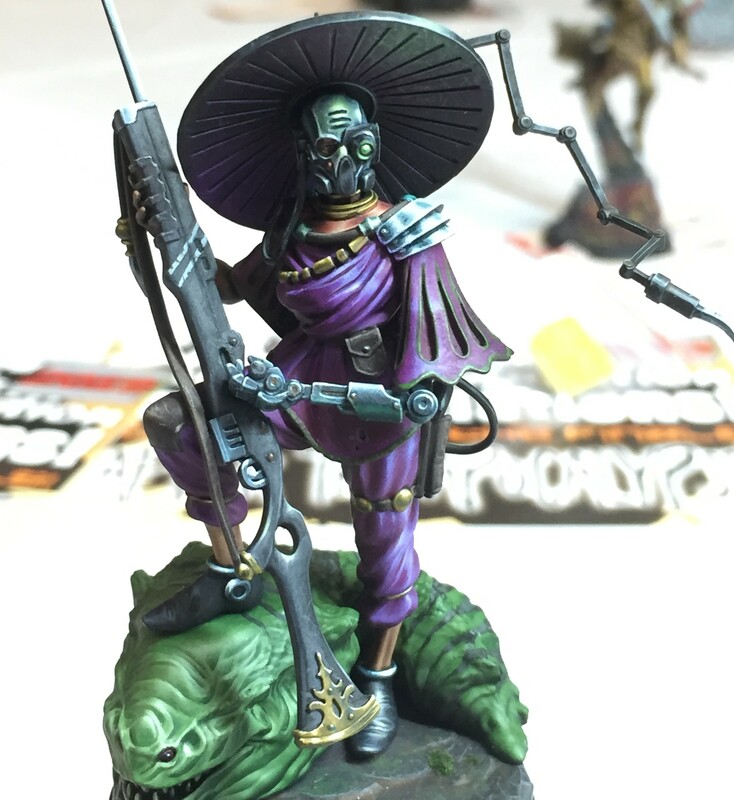 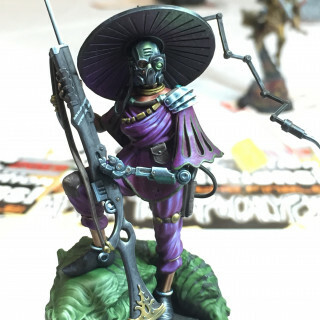 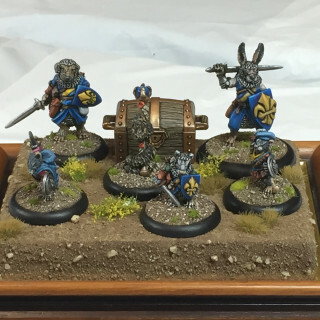 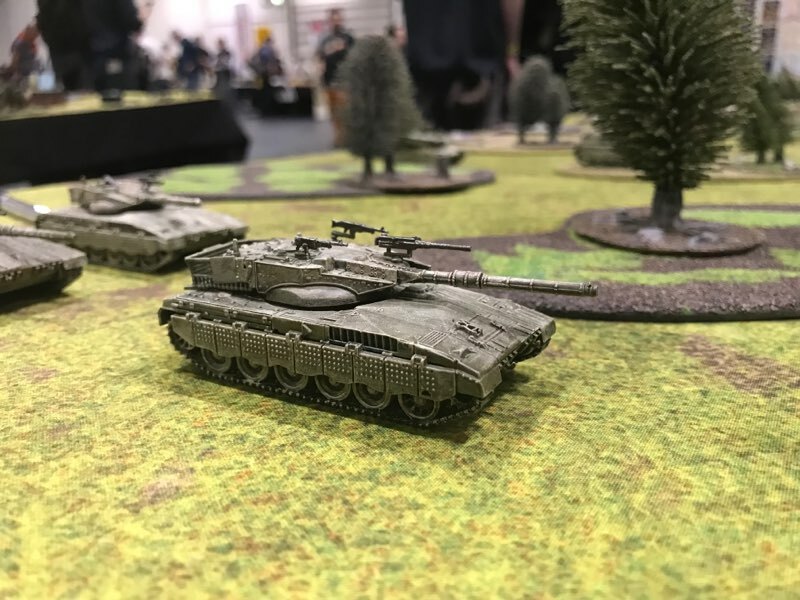 We stop off with Ivo from Bandua Wargames and discuss some of his new releases from the past couple of weeks. 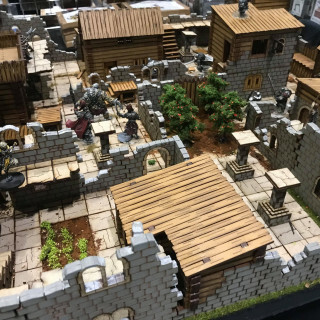 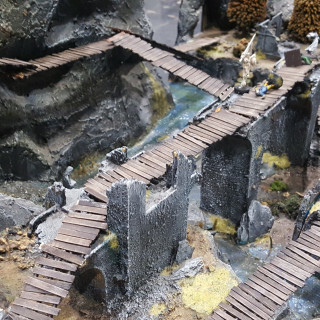 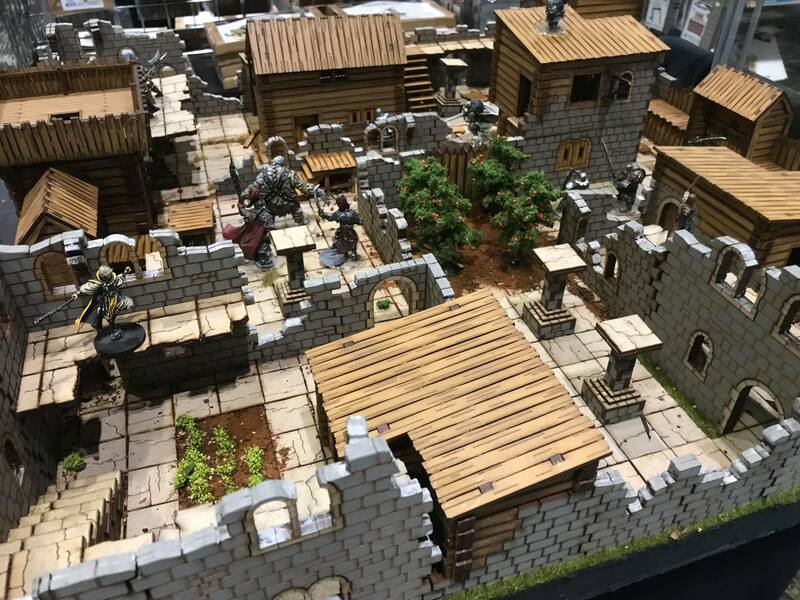 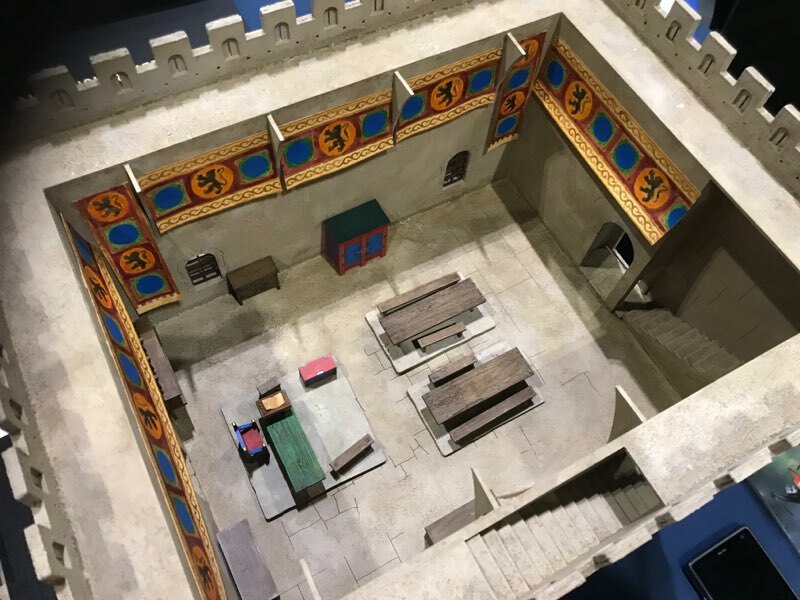 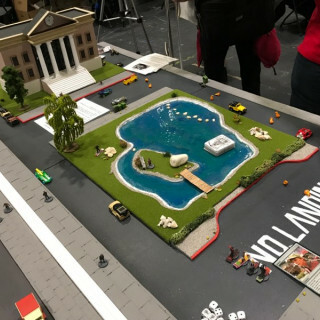 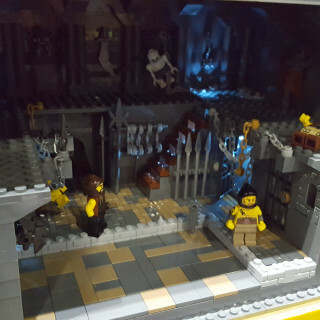 These fellows do some awesome work, looking at not only terrain but also lots of accessories for those that are maybe playing games in clubs or at the tournament level. 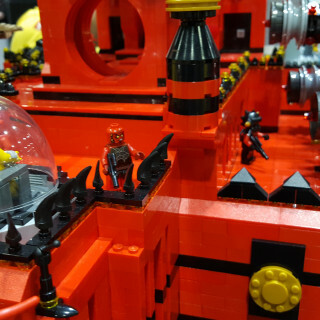 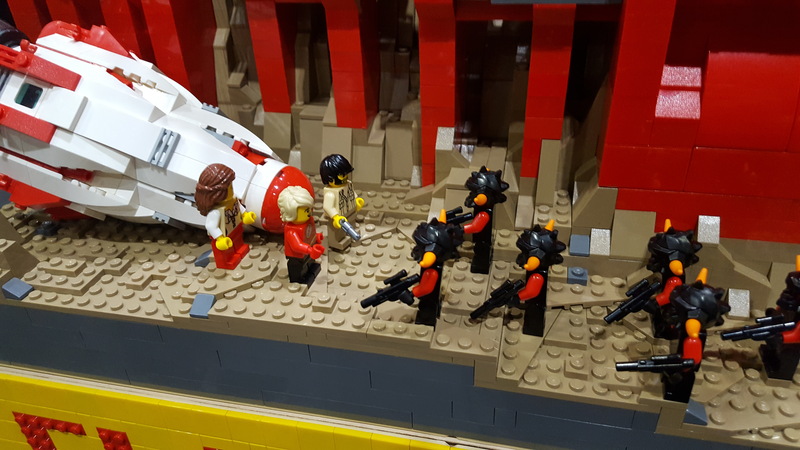 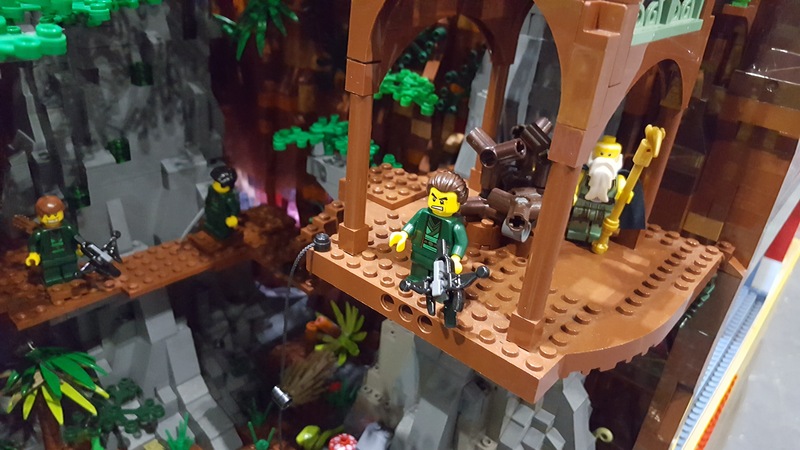 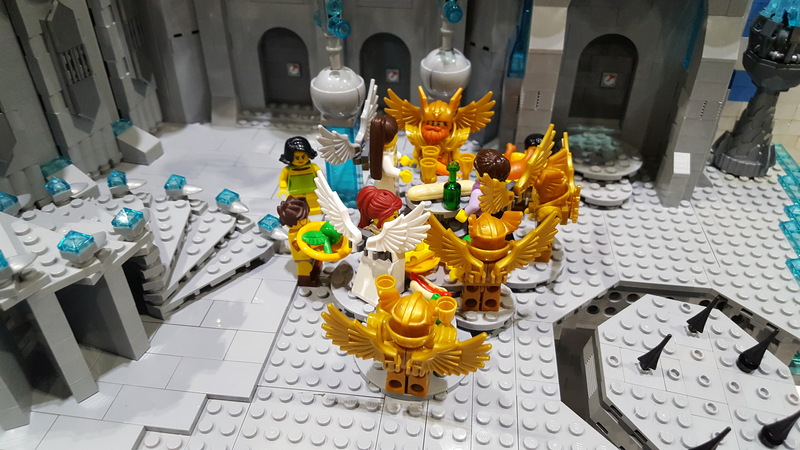 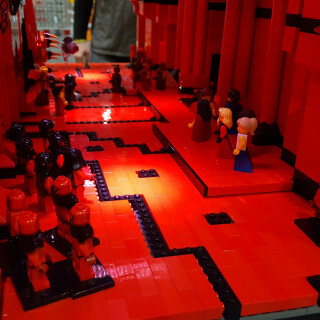 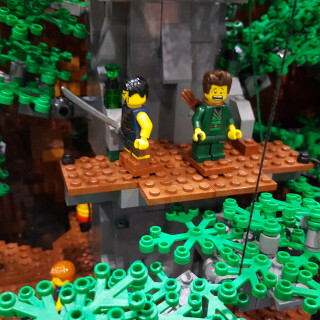 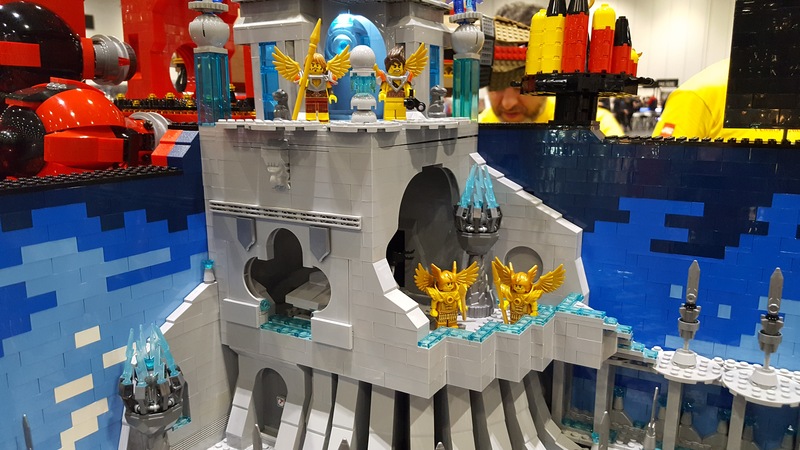 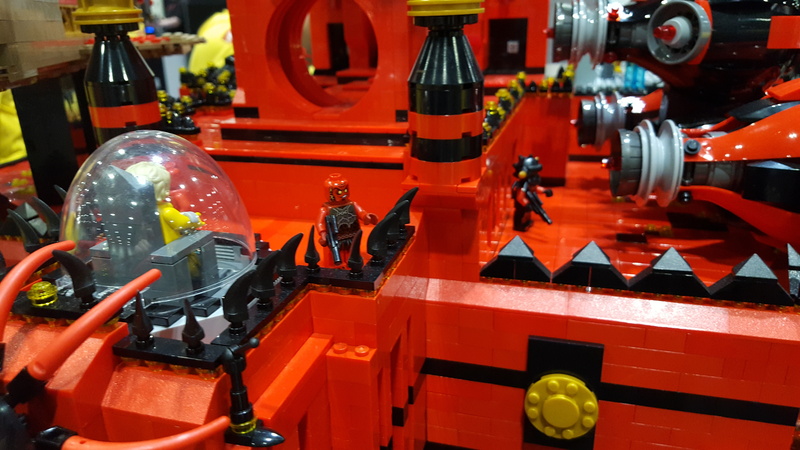 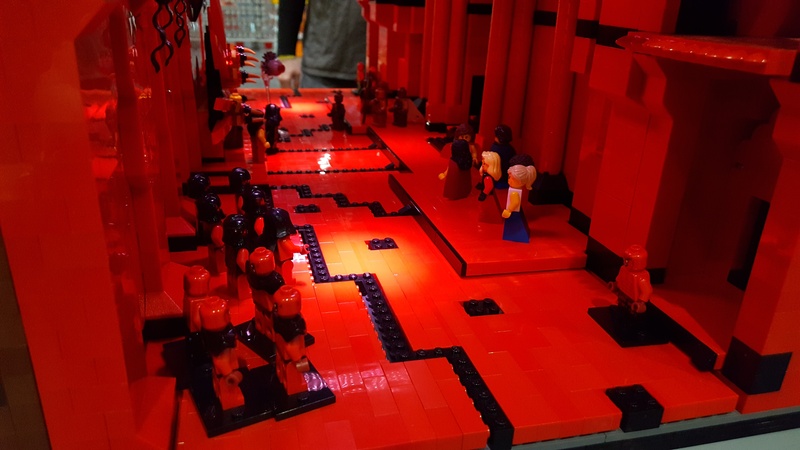 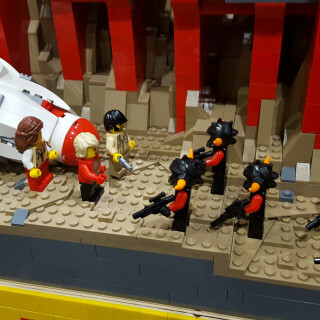 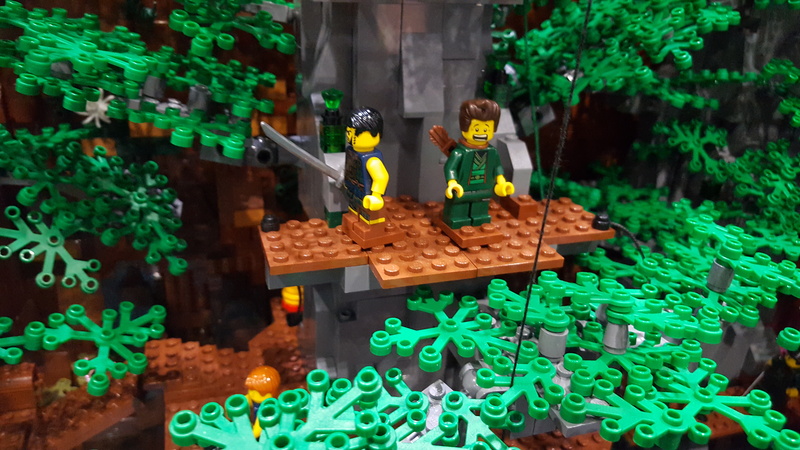 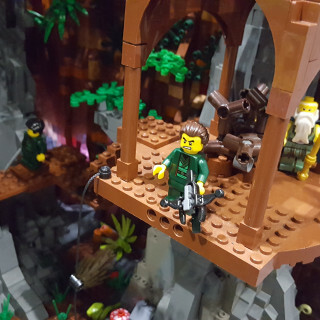 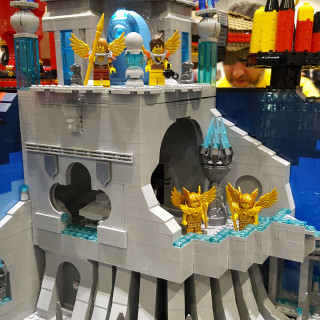 Gerry has a chat with the team behind this absolutely awesome game featuring Flash Gordon and a LOT of LEGO. 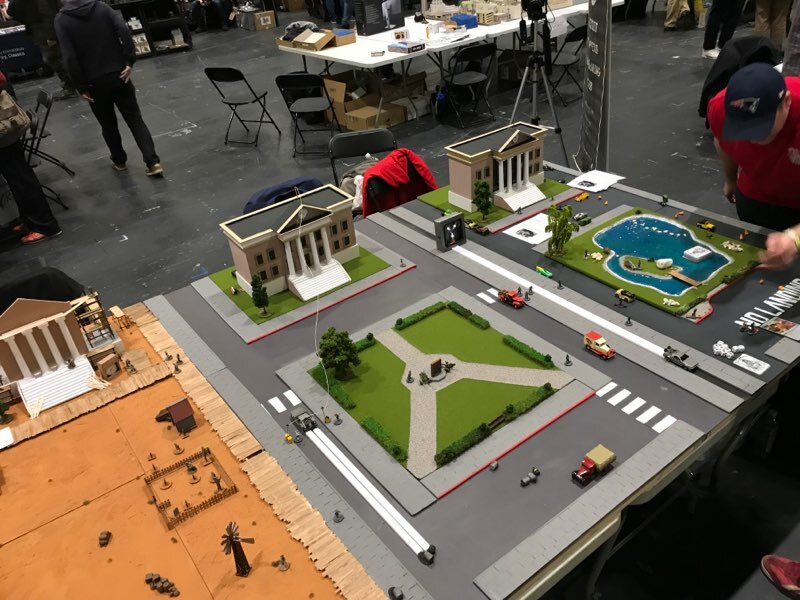 The team have been working on this fantastic gaming table which also features mechanics which draw from…you guessed it, LEGO! 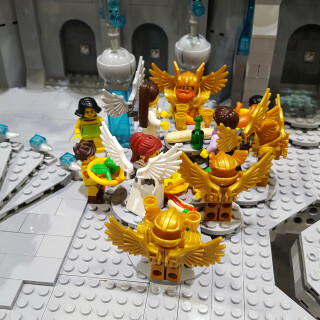 Even the player boards they use for each of the characters are done using lego! 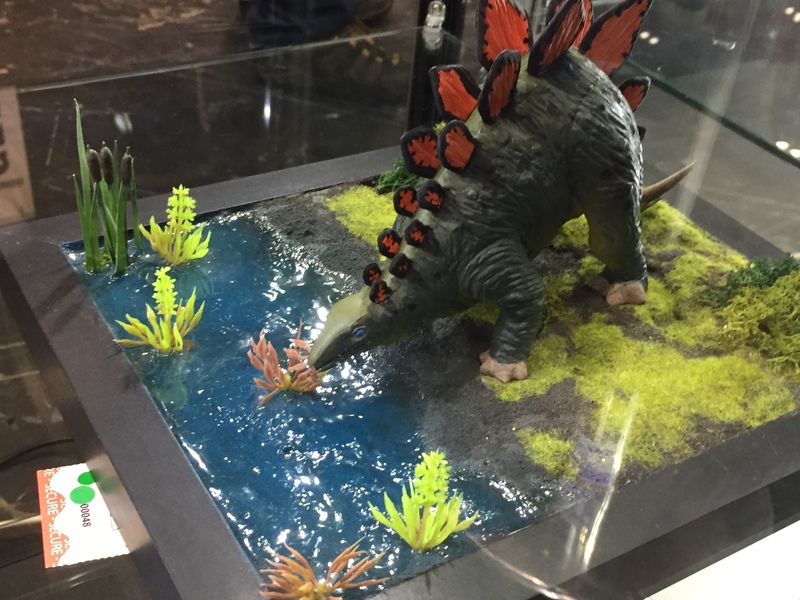 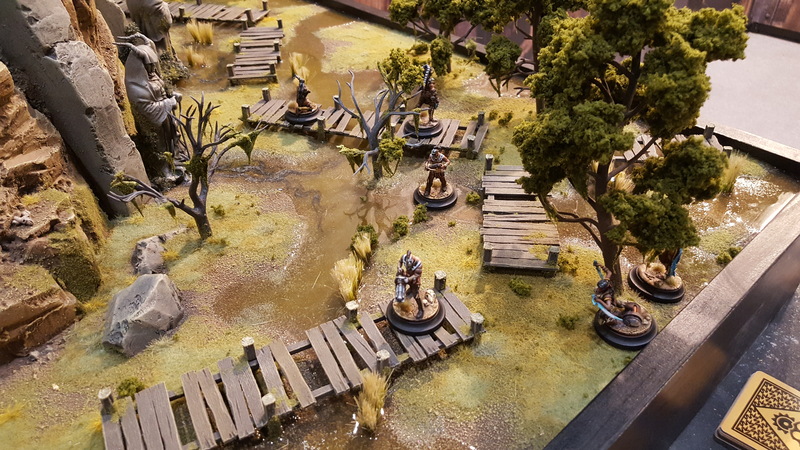 One of the other amazing tabletops from the show is this fantastic table which shows off an amazing river made using fantastic water techniques AND brilliant bush work too. 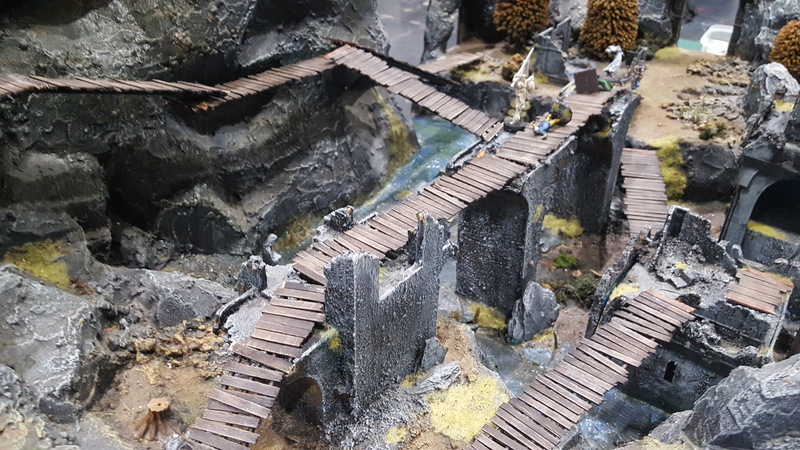 I love how the terrain flows from wonderful forest landscapes through to the massive fort at the back. Everyone loves some Stingray…and so when we saw that there was a game based around Stingray we had to go and find out more about it. 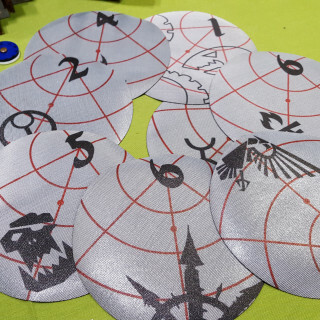 One of the cool things about this show is that it seems like everyone is drawing on some of those awesome retro shows for their inspiration when delving into their tabletop games. 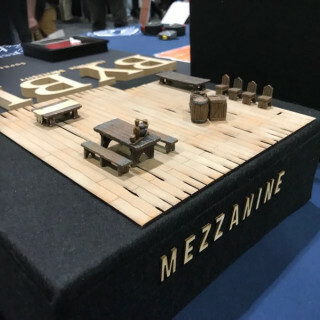 It’s very neat seeing how inventive everyone is! 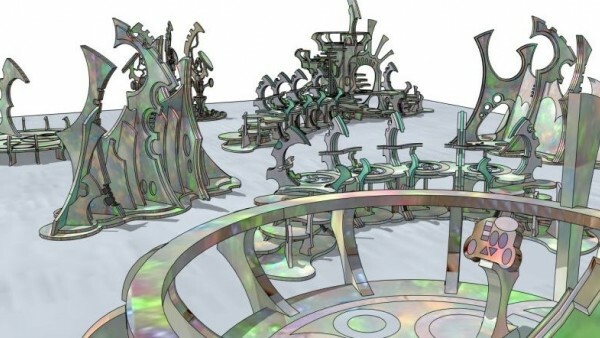 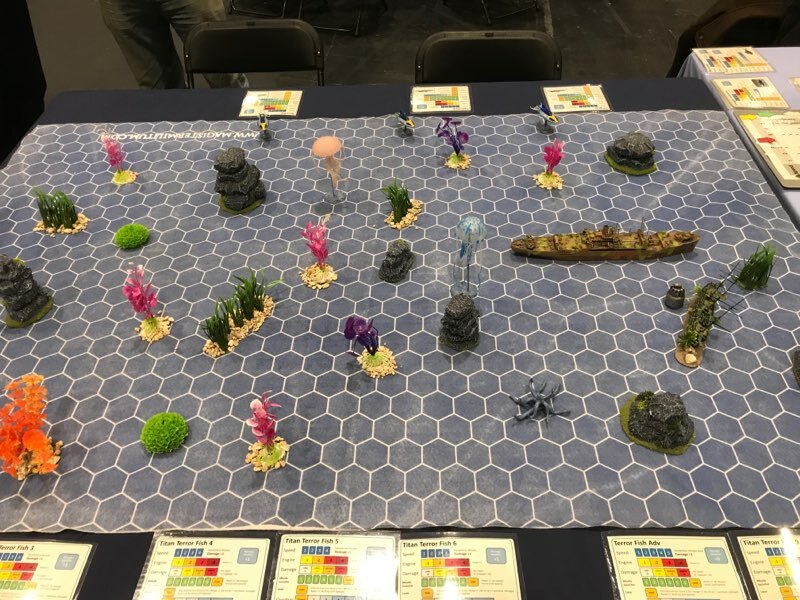 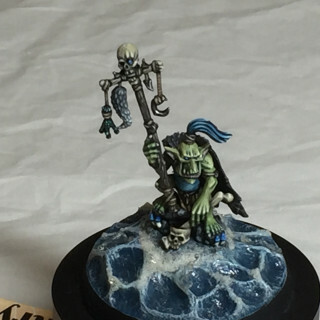 Kraken Wargames Talk Us Through Their New Designs - WIN A Prize! 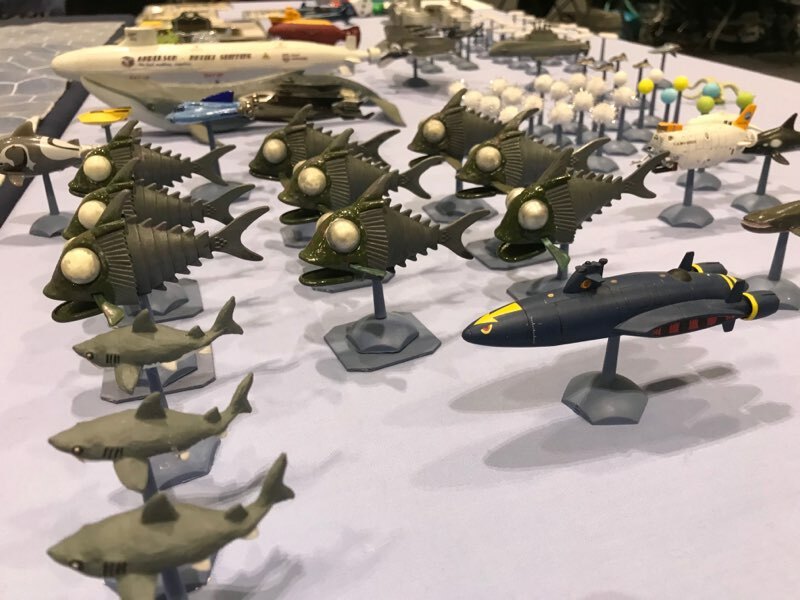 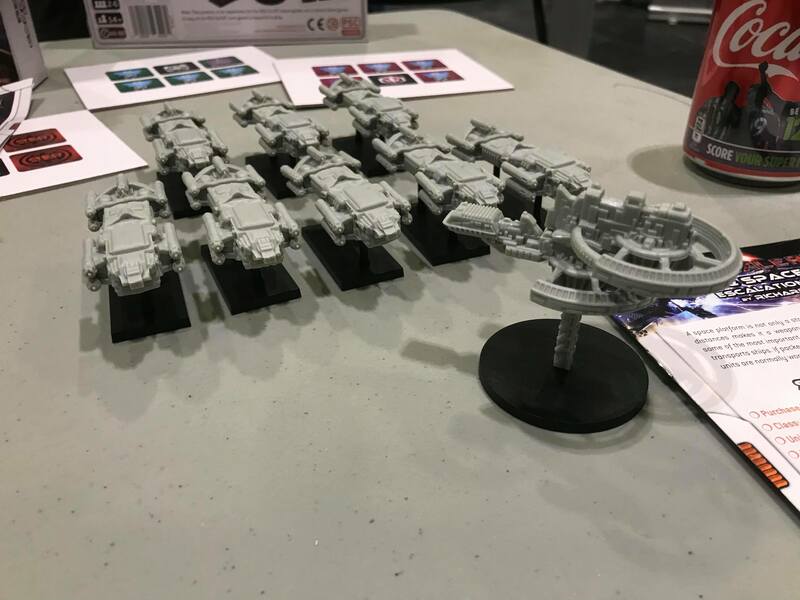 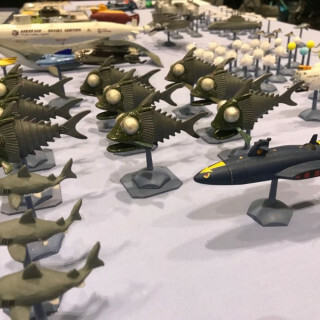 Kraken Wargames has been talking to us about some of the awesome new designs they have coming out. 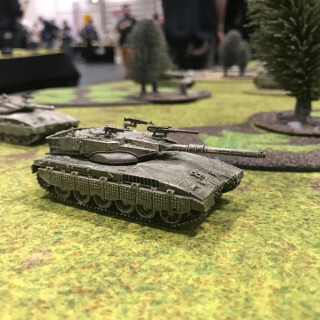 Get involved in the comments as we’d love to hear what you’re thinking! 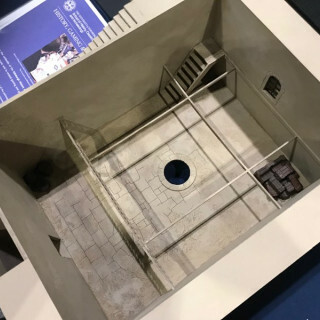 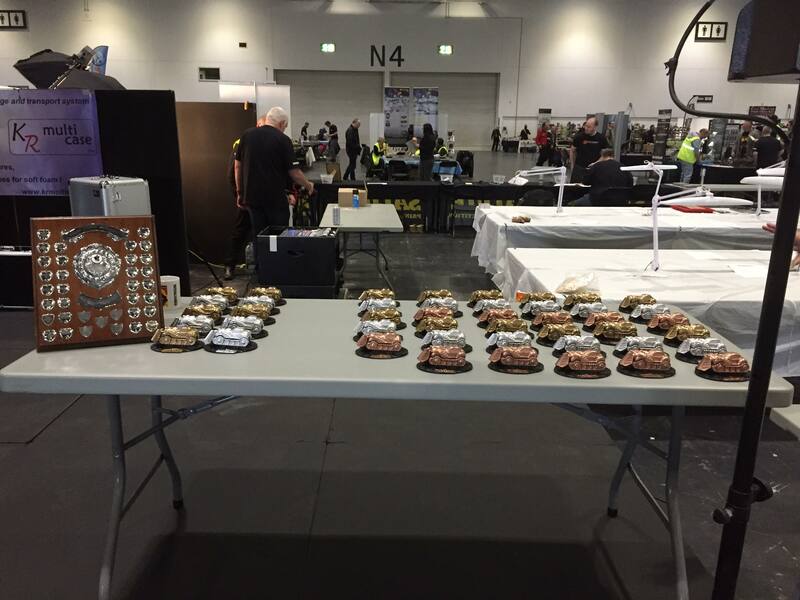 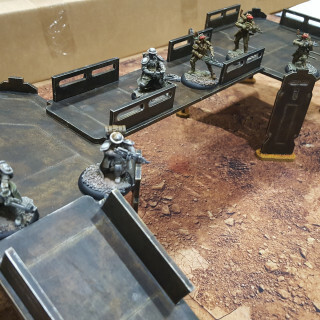 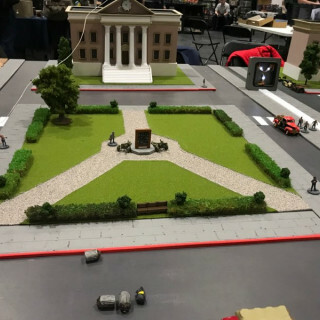 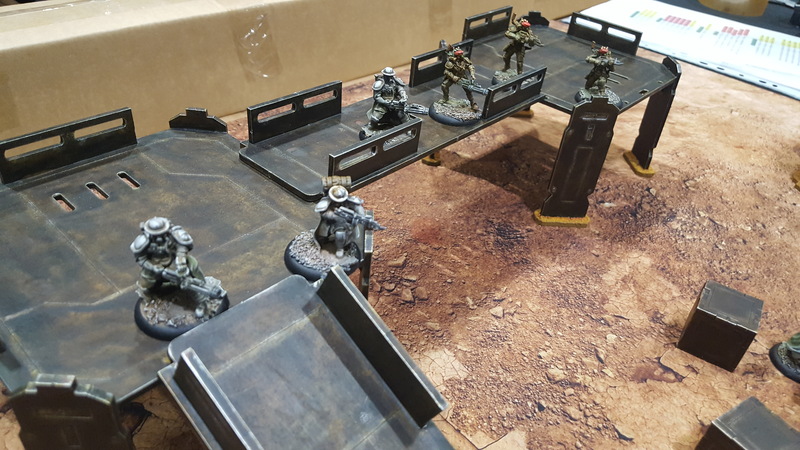 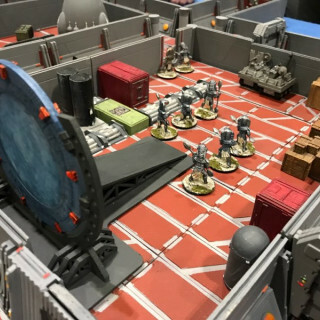 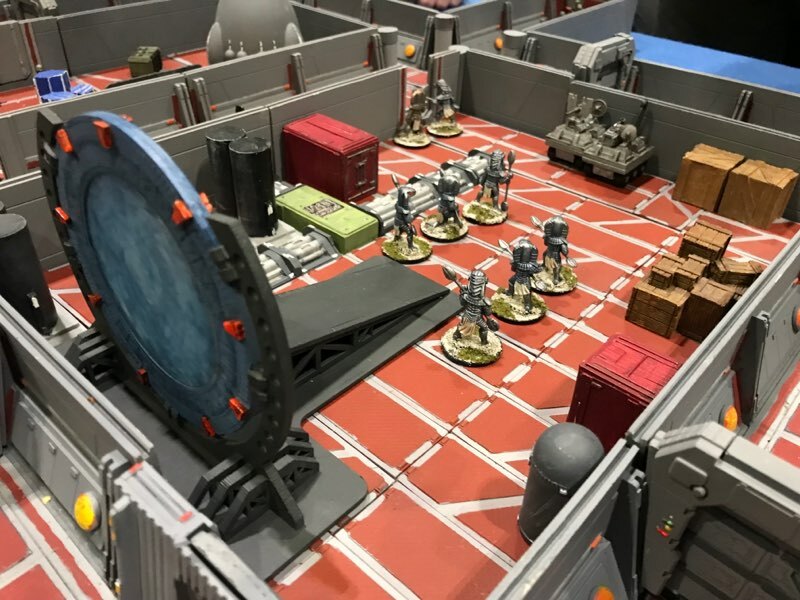 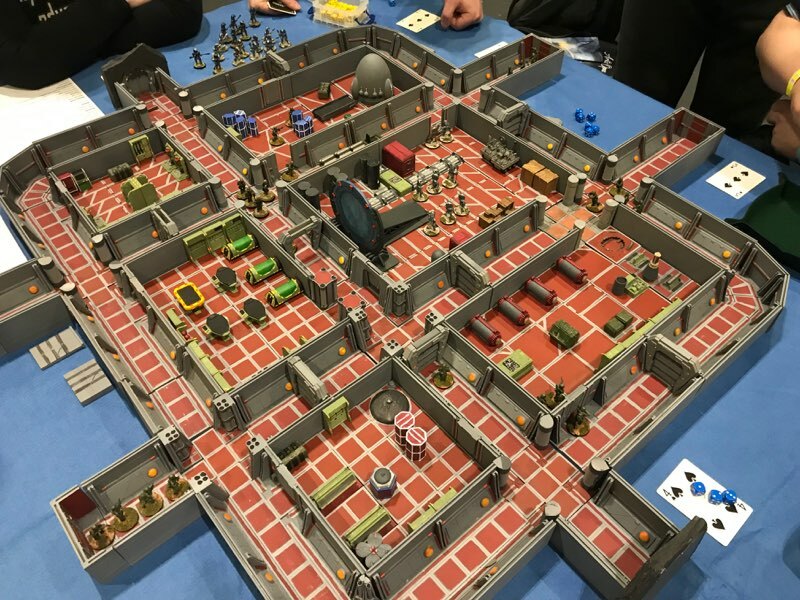 Continuing the trend of interesting and diverse gaming tables to explore here at Salute we talked with the ever awesome RAF Wargaming Association as they have been setting up a really awesome Stargate game here for people to delve into. 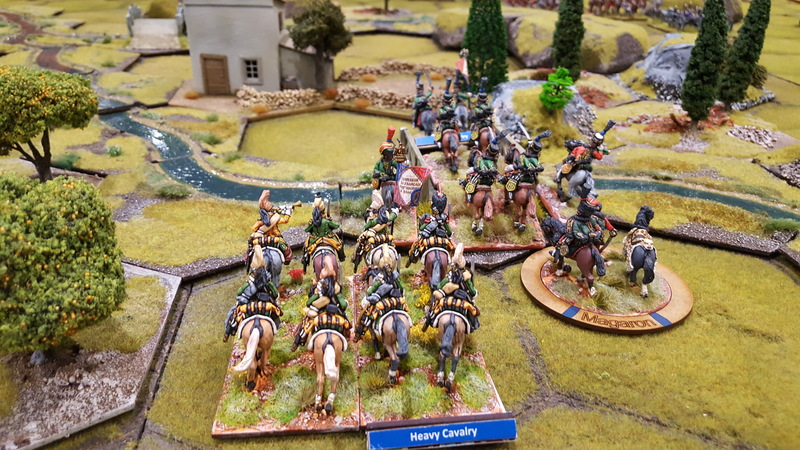 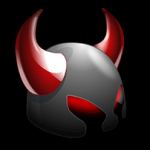 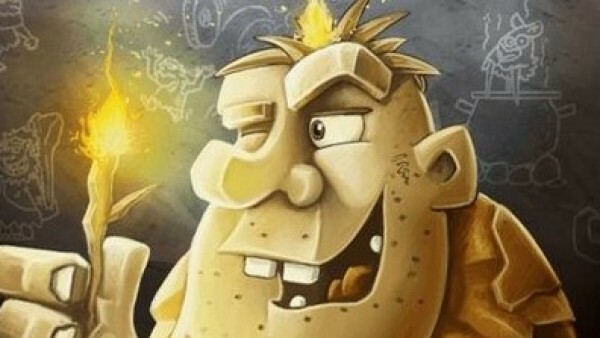 Come and have a look at what Gerry learned about this particular game. 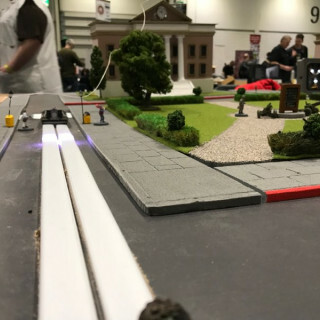 Bexley Reapers - Take Us Back To The Future! 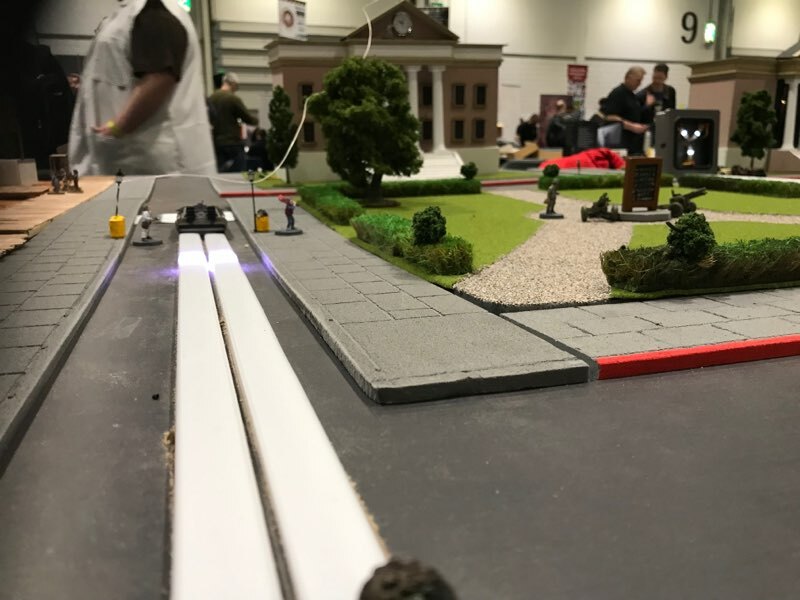 We got to chat with another awesome gaming club, the Bexley Reapers, about their great participation game where you’re going to be going through not one, not two, but all three of the Back To The Future games. Entries Close and Judging Begins! 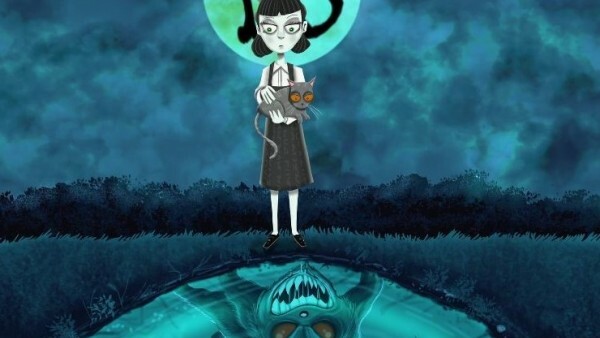 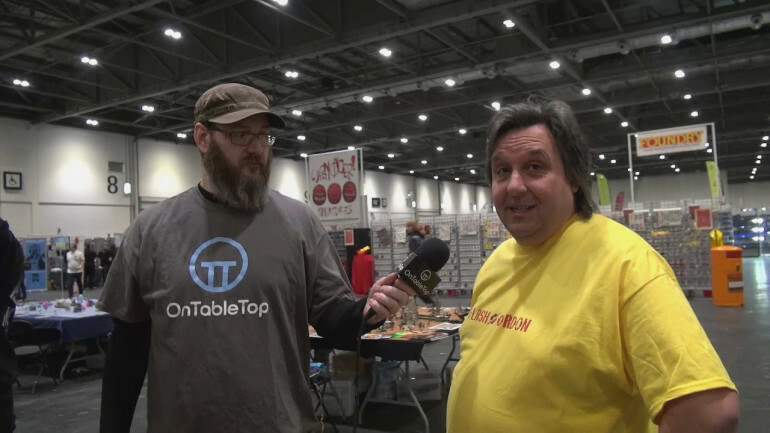 We get to chat with the team behind a really fascinating game which is as much for fun as it is for education. 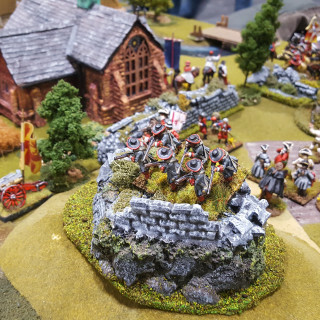 Created alongside the University Of Edinburgh the game is focused around an assault on a Templar Keep. 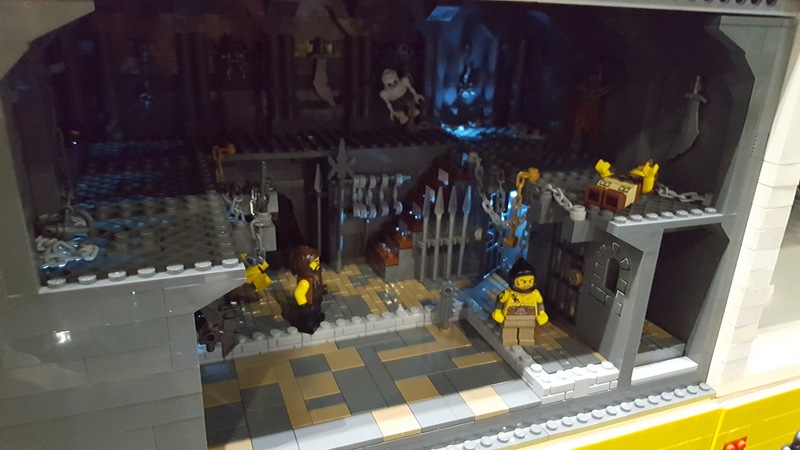 The interiors for this build are fascinating and I think that anyone who enjoys their Crusades is going to be loving this. 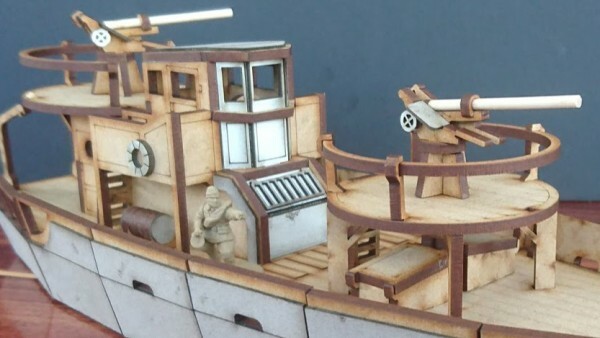 Warlord Games Reveal New Game Black Seas - Win A Prize! 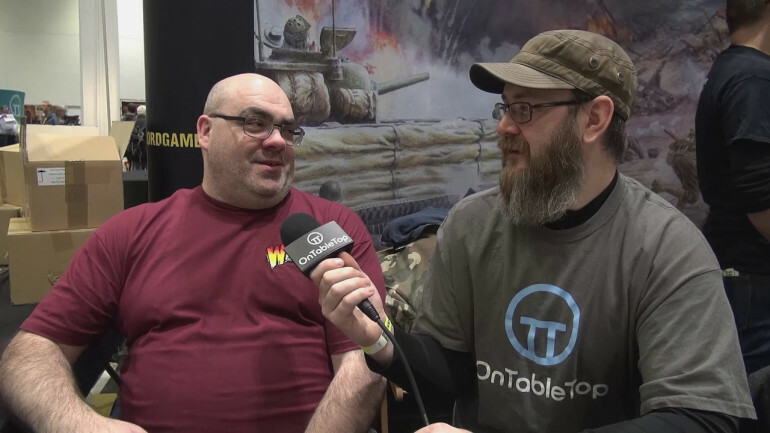 Warlord Games’ Gabrio and Colin talk to us about what’s happening with their new game (yes, a new game!) 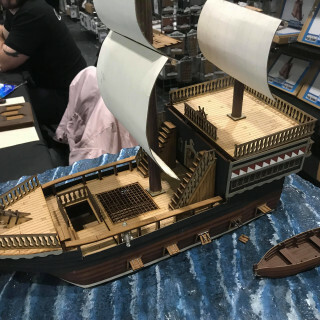 called Black Seas! 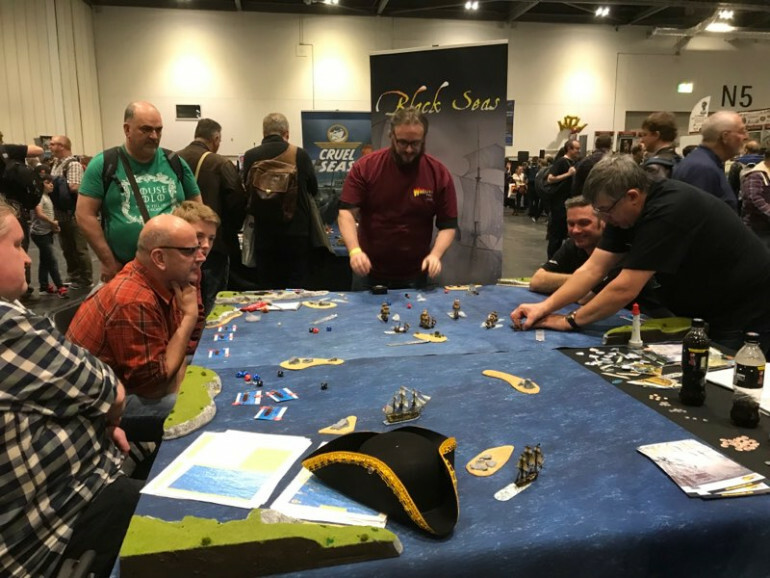 You Could Win – Black Seas! 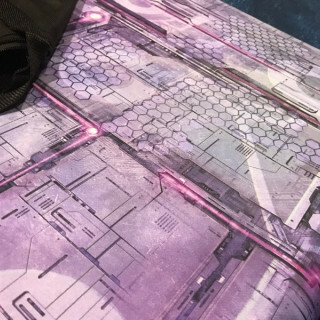 You could win this (when the game releases) by simply commenting down below. 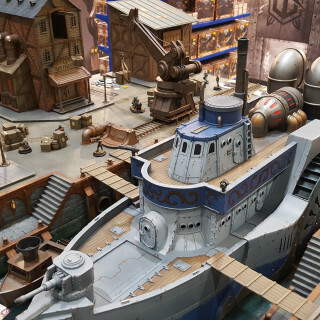 Make sure to delve in and check this out as this is quite the stunning new range! 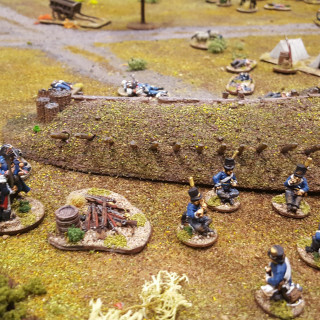 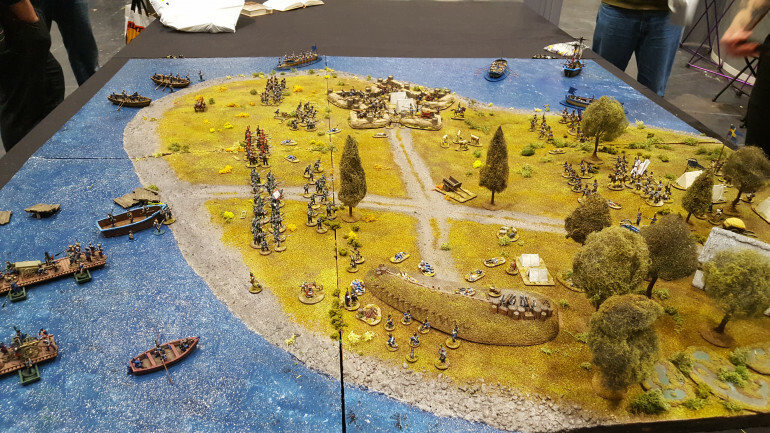 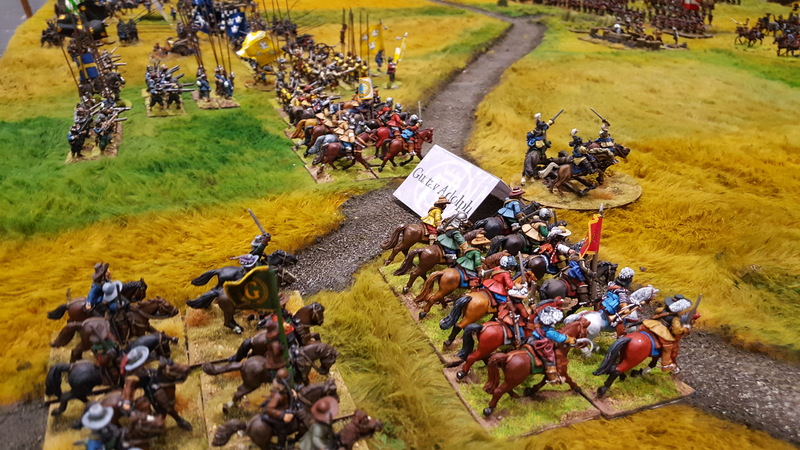 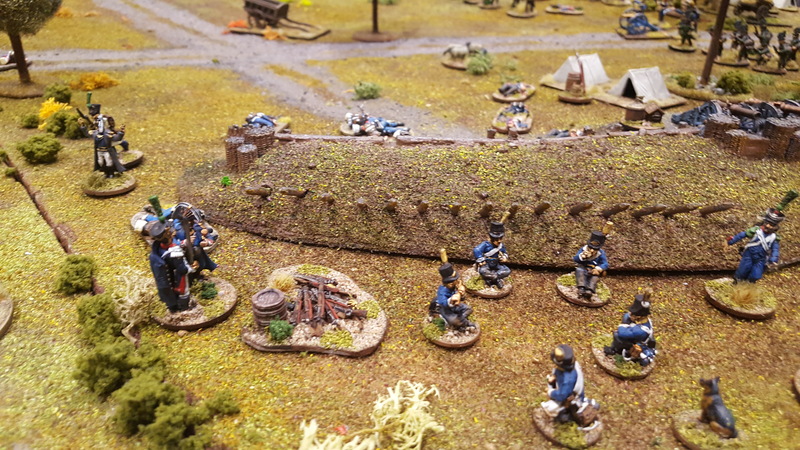 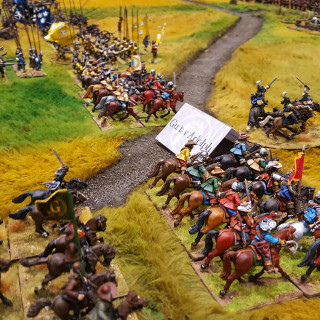 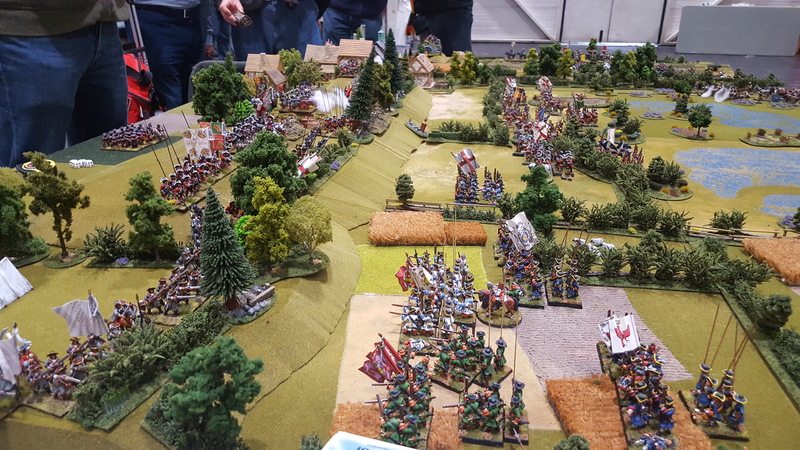 A classic bit of historical takes to the tabletop with this wonderful tabletop which has been designed to play out The Battle Of Danholm! 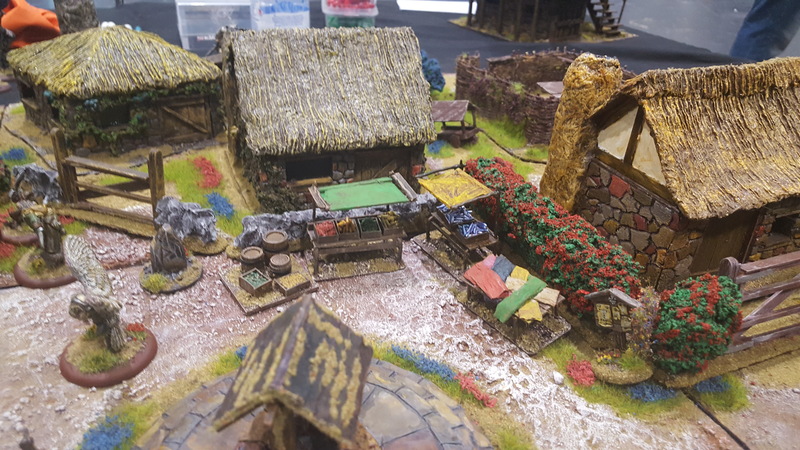 Come and take a peek at some of the amazing looking range of terrain, armies and more that they have put together. 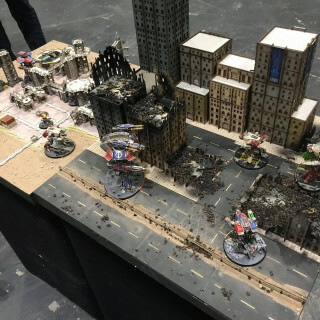 Batman Miniatures Game With Mark Latham! 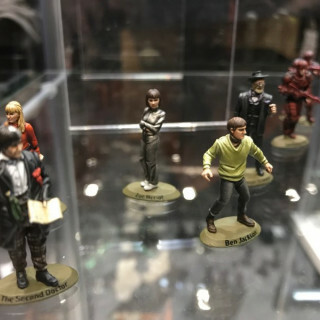 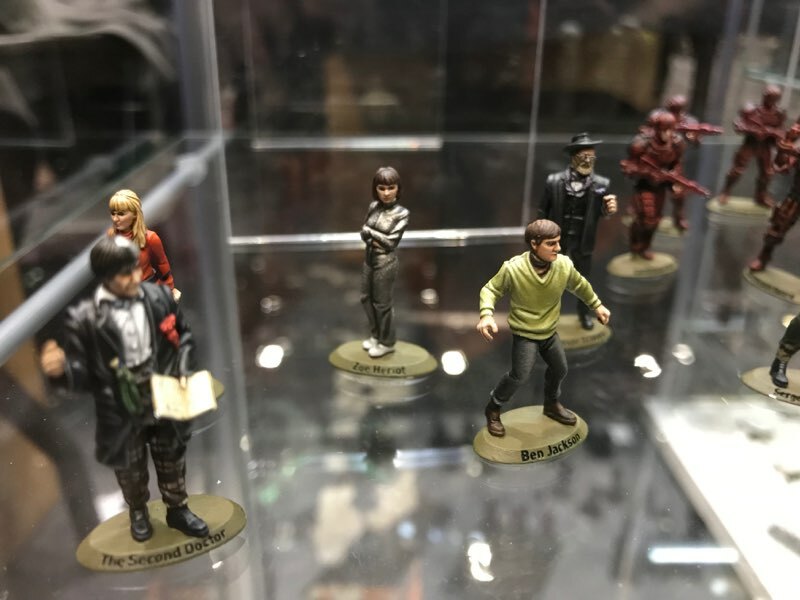 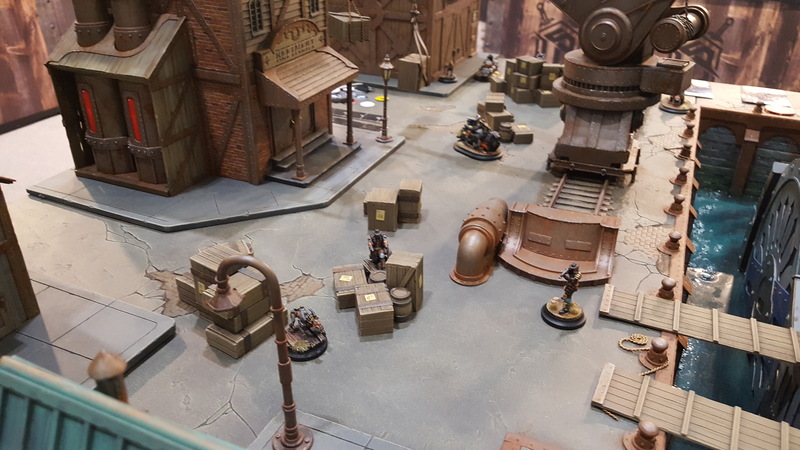 Gerry talks to Mark Latham about the development of the Batman Miniatures Game and how it has been tweaked for the new edition and a very special boxed version of the game. 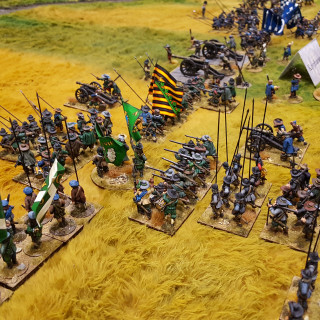 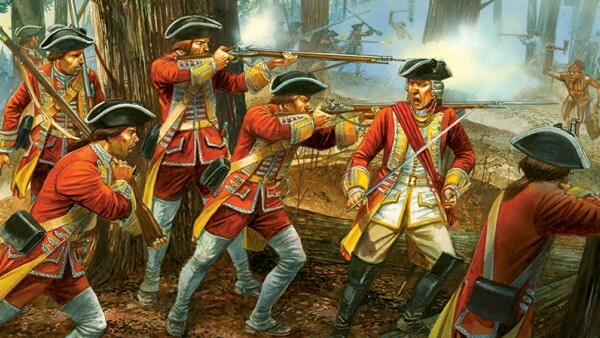 The Williamite Wars In Ireland! Keeping with the theme of historical…because we know what you love, we thought we’d take a look at another of the extraordinary looking tables which has been designed to refight The Williamite Wars In Ireland! 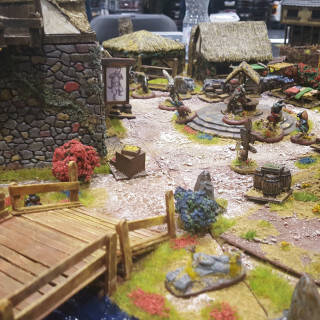 This is quite the dynamic and interesting table filled with all sorts of little vignettes. 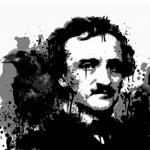 More On The Horizon From Blood Red Skies - Win A Prize! 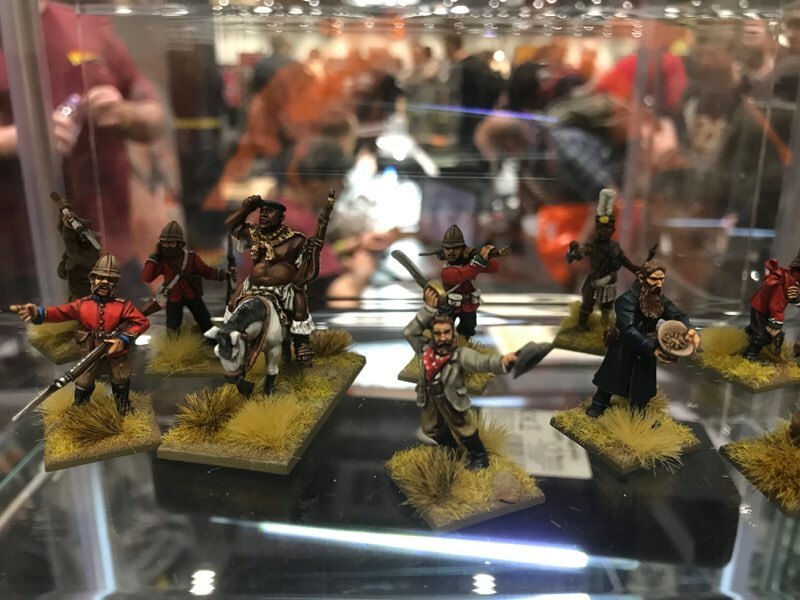 There is plenty more on the horizon for Blood Red Skies to thanks to the team at Warlord Games. 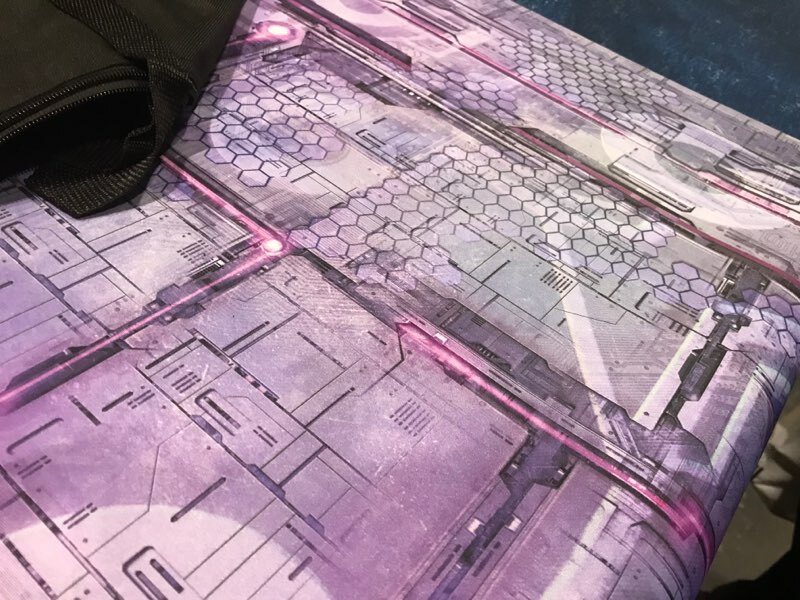 We delve into what has been shown off and explore what the future of the game is going to be with the team. 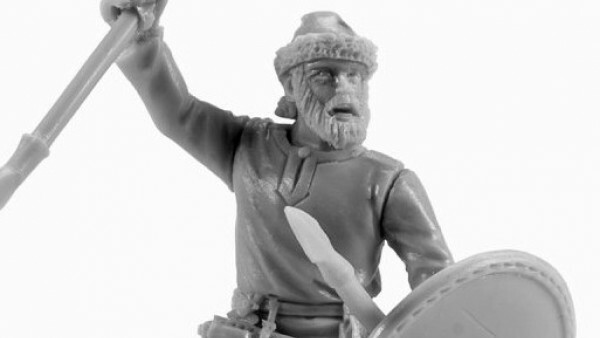 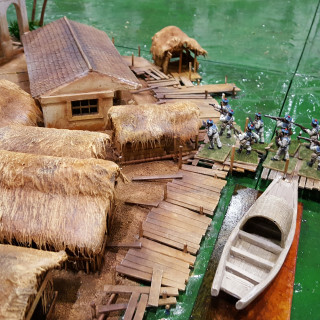 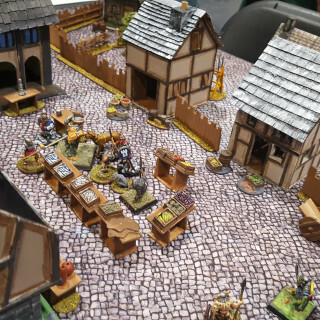 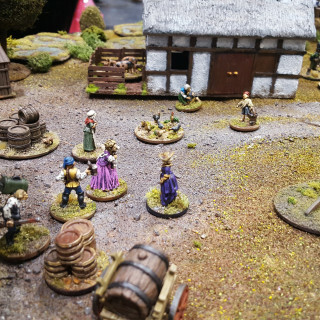 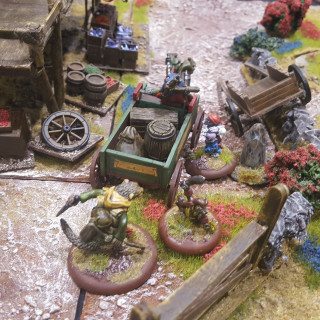 Thud & Blunder from the Ministry Of Gentlemanly Warfare is a great new Fantasy Skirmish Game which allows you to use whatever miniatures you like to create storytelling opportunities on the tabletop. 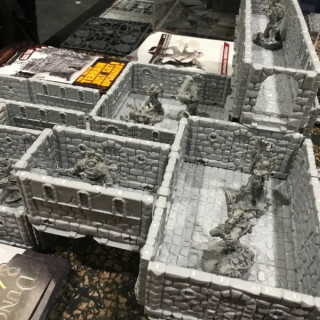 This could include doing some role-playing adventures, skirmishing with warbands, or maybe even a little bit of a cooperative adventure! 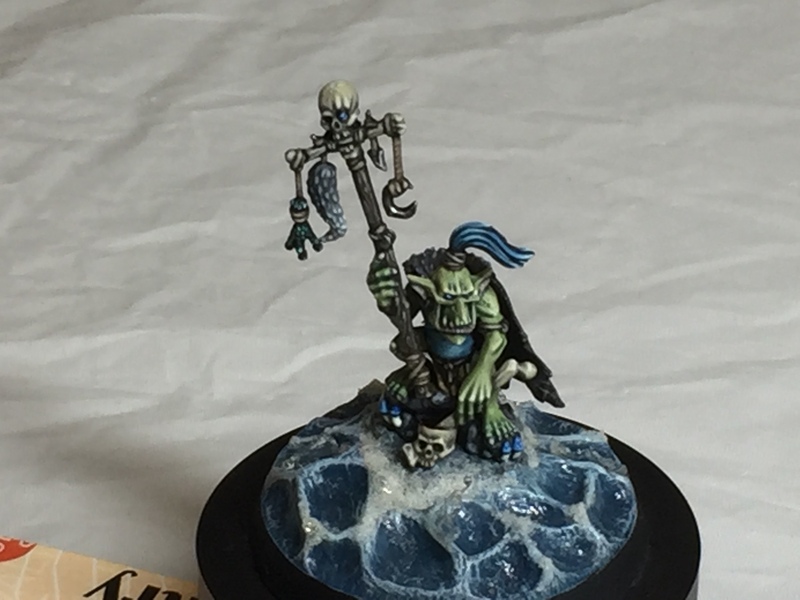 Deaddave's Limited Edition Miniature + Win A Prize! 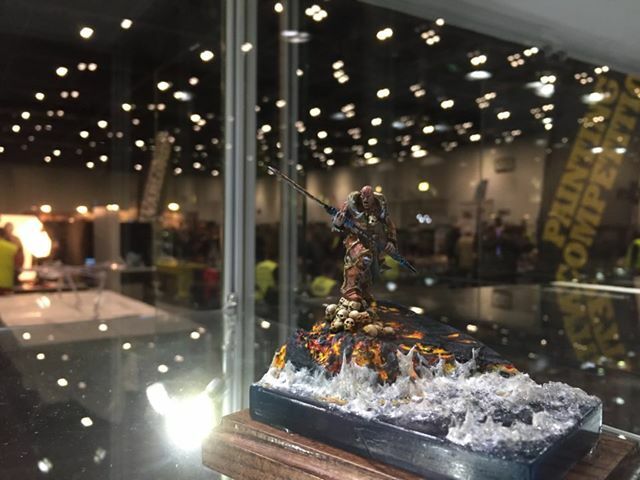 THIS is a one of a kind miniature so if you get your hands on this it’s pretty special. 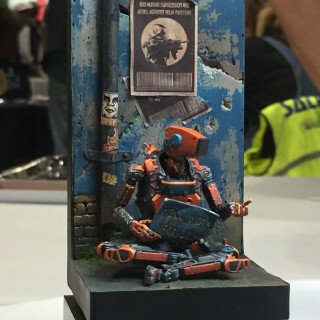 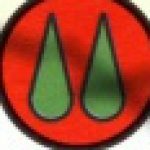 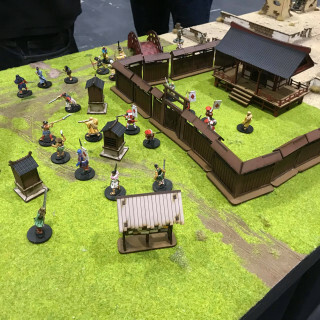 PWork Wargames' New Designs - Win A Prize! 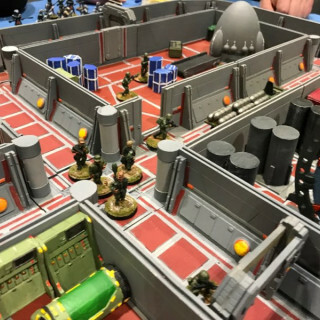 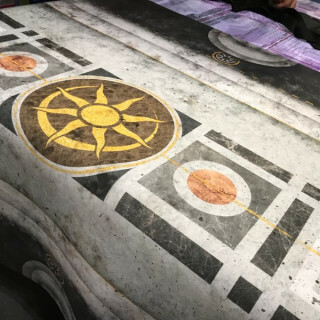 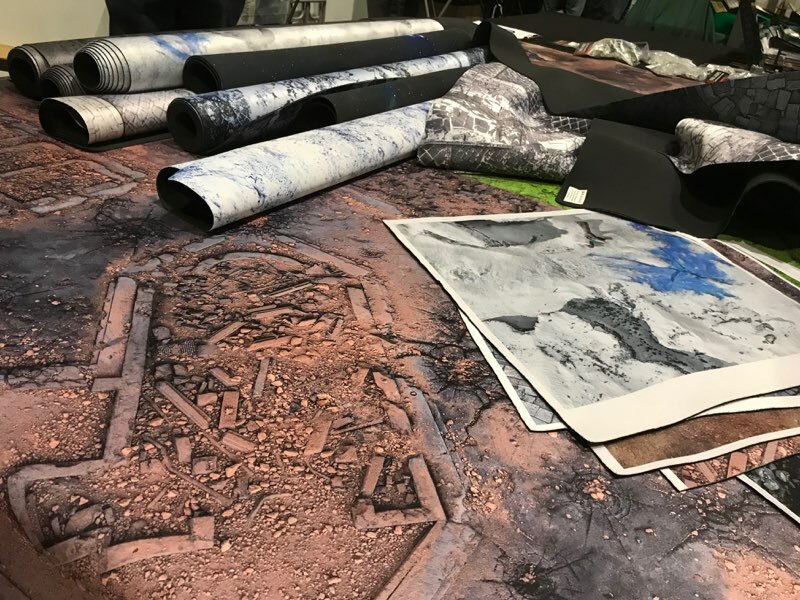 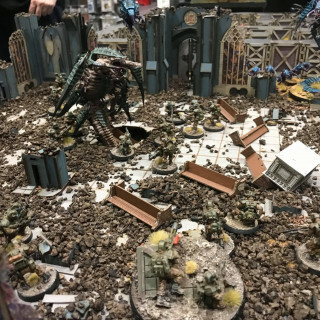 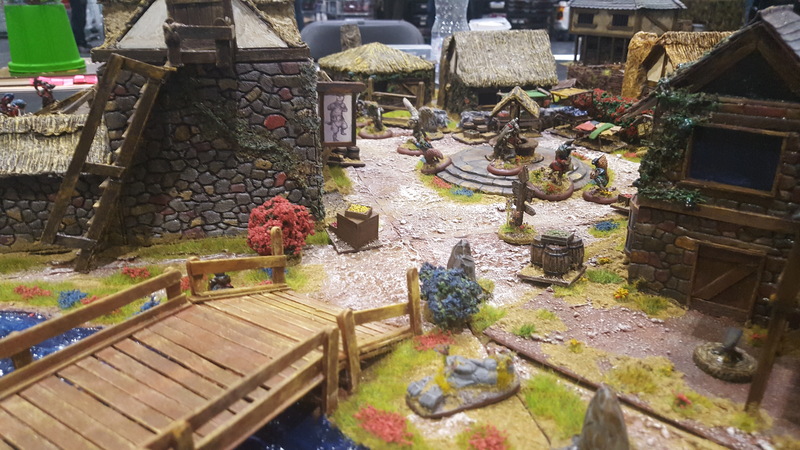 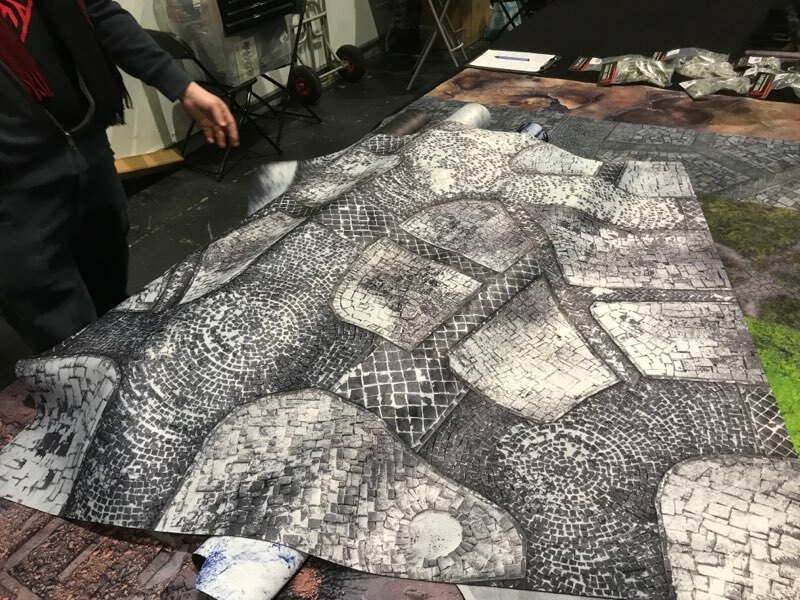 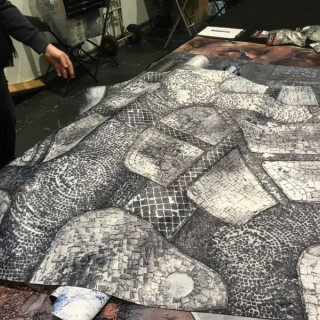 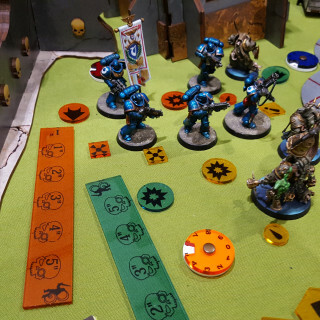 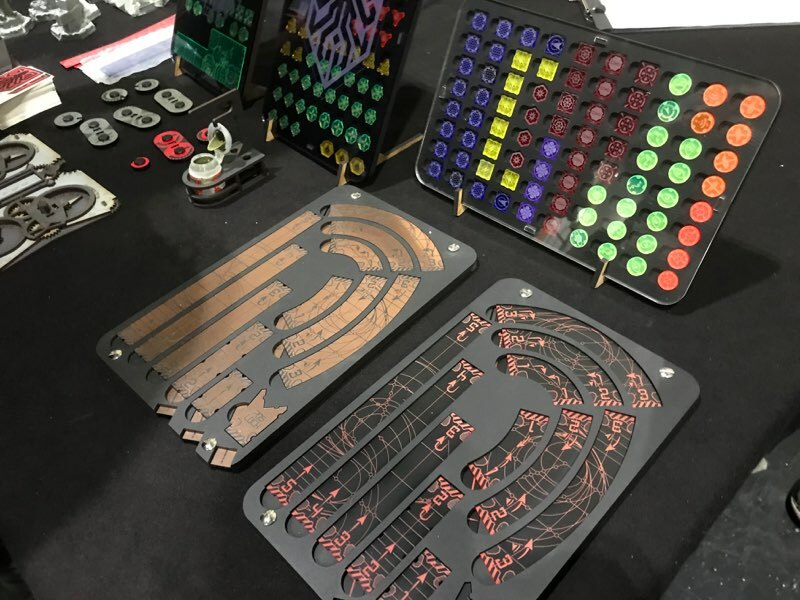 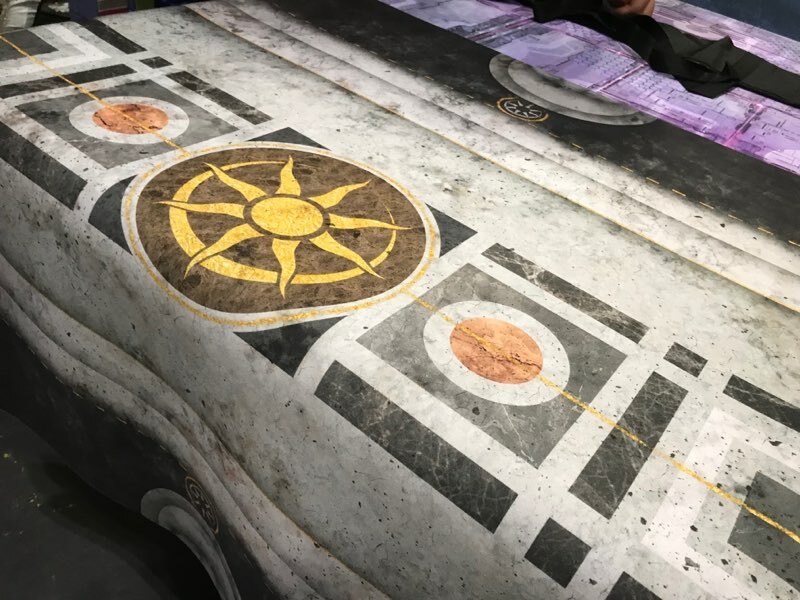 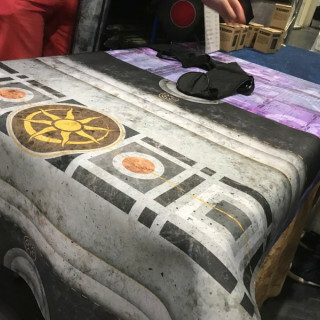 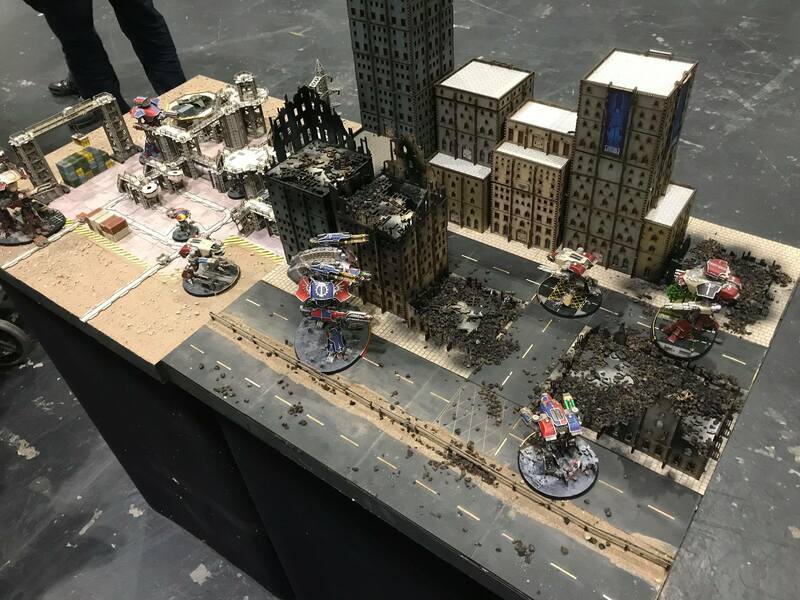 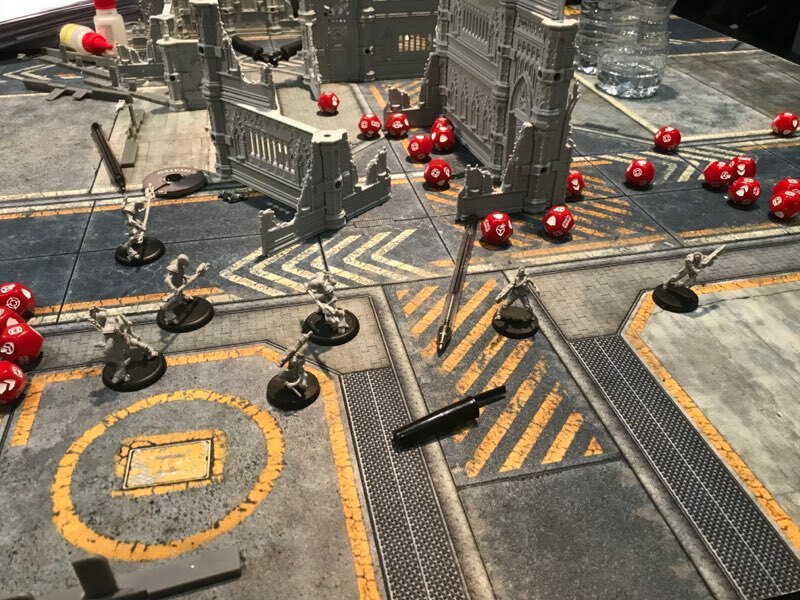 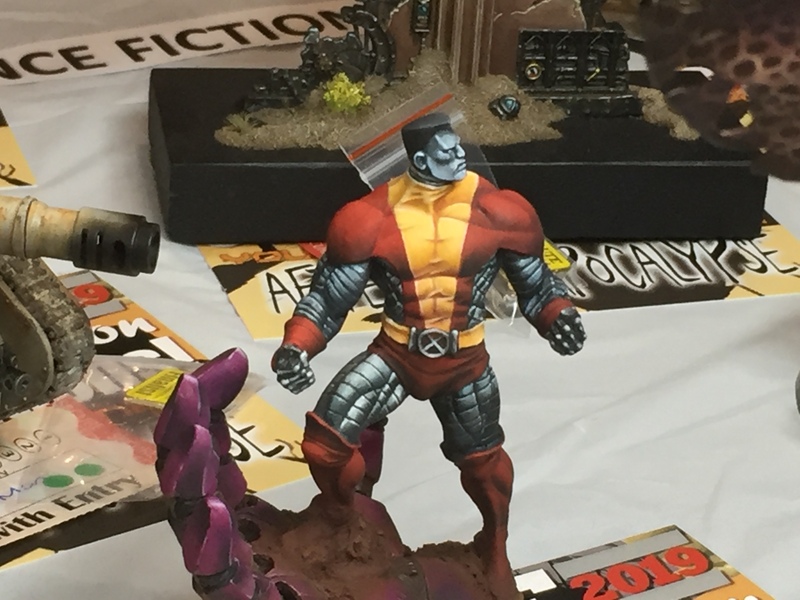 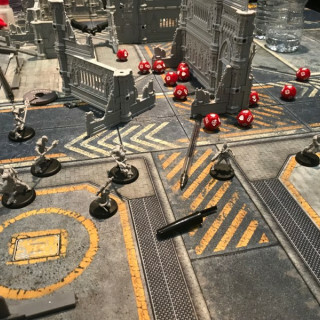 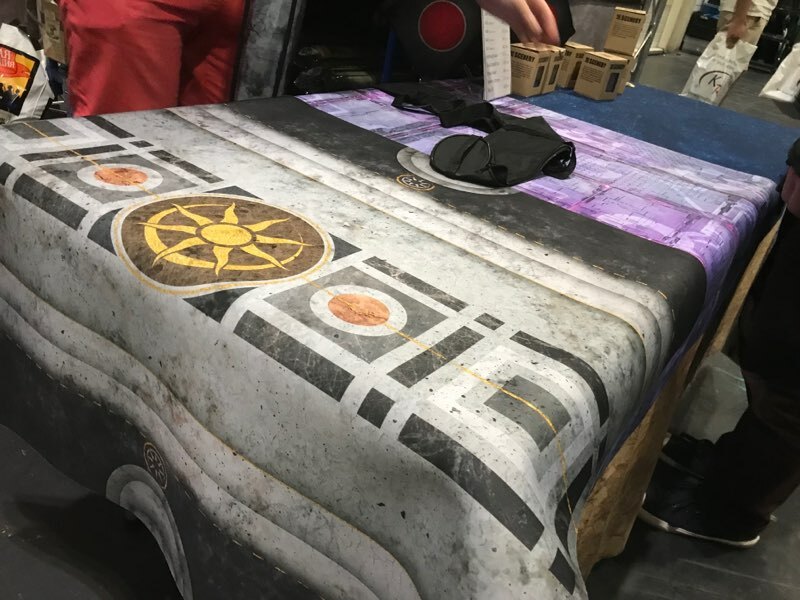 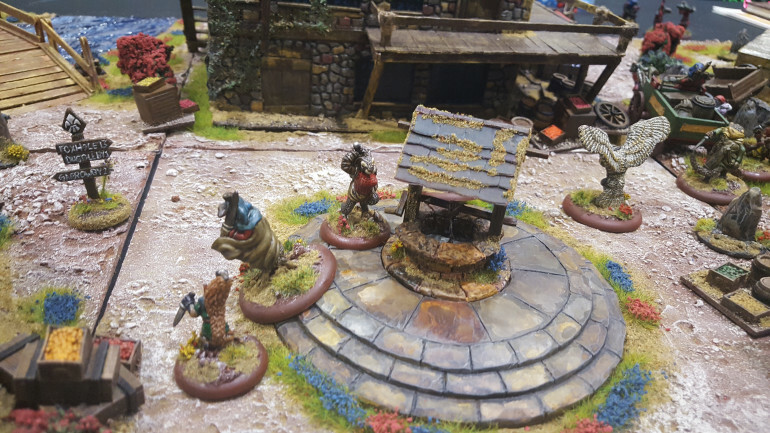 We got to stop off with the team at P-Work Wargames to talk about their new mat designs and where things are going for them in the future with terrain and more. 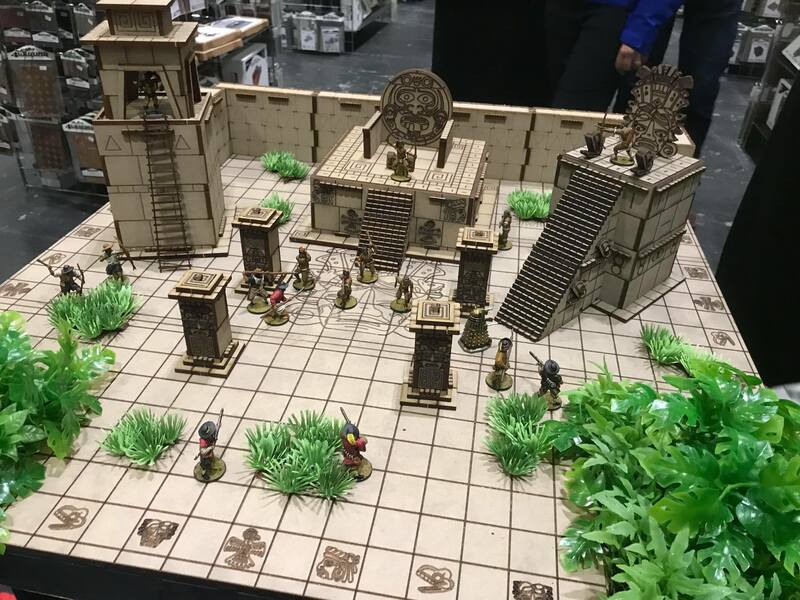 Make sure to check out their website as they have loads of other designs you can explore for various games and terrain which works really well for tournament gamers and clubs. 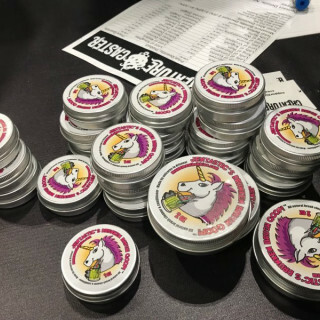 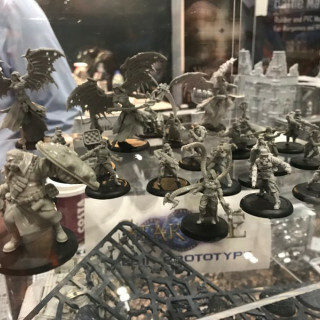 Learning More About Warlord's New Projects + Win A Prize! 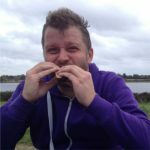 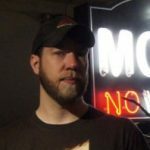 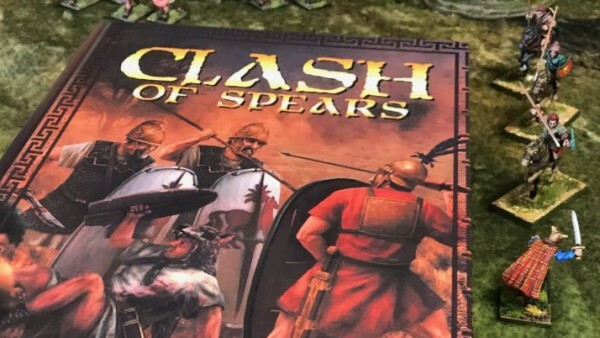 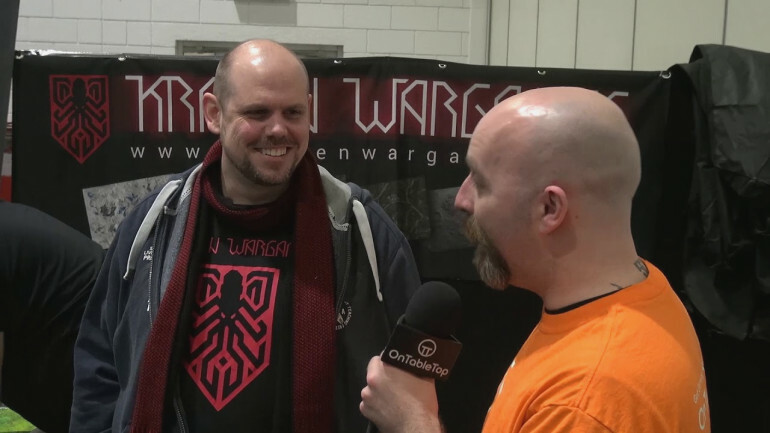 We got to chat with Paul Sawyer about what is coming up from Warlord Games, across the spectrum of games. 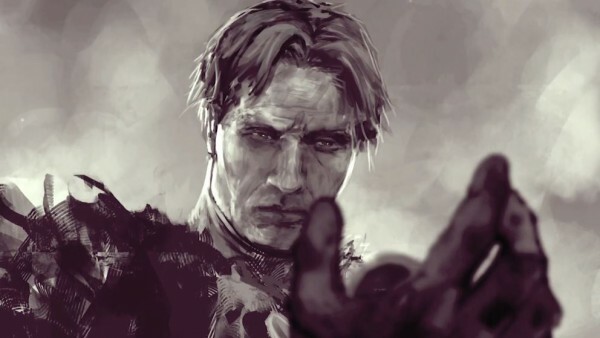 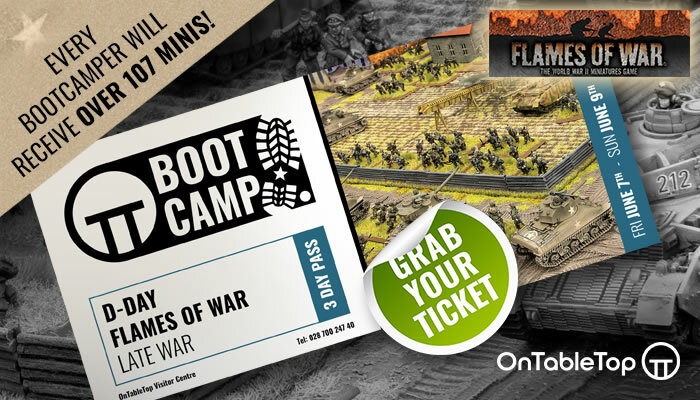 What part of the upcoming schedule from Warlord Game has really snagged your attention? 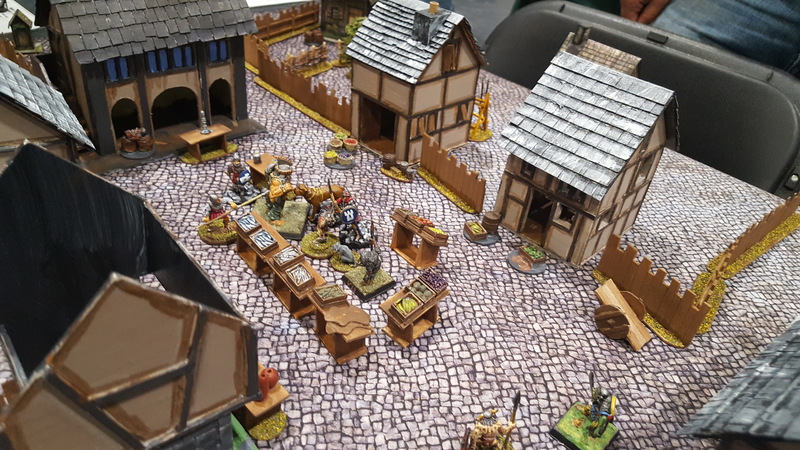 There is a group of gamers here showing off what’s going on when it comes to Wyrd Games’ The Other Side. 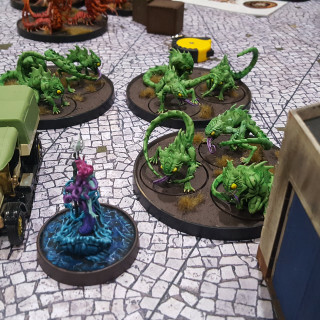 This larger scale game has you delving down into battles between monstrous creatures and all sorts of weird and wonderful entities. 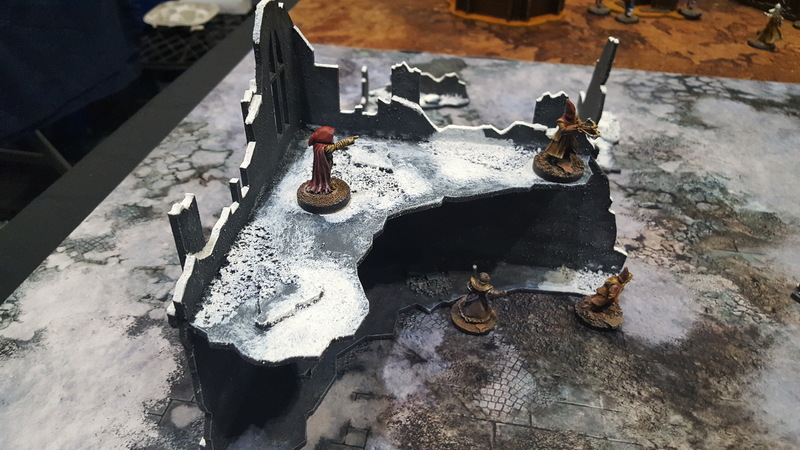 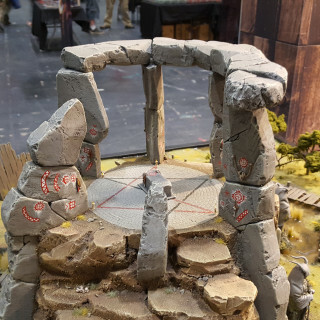 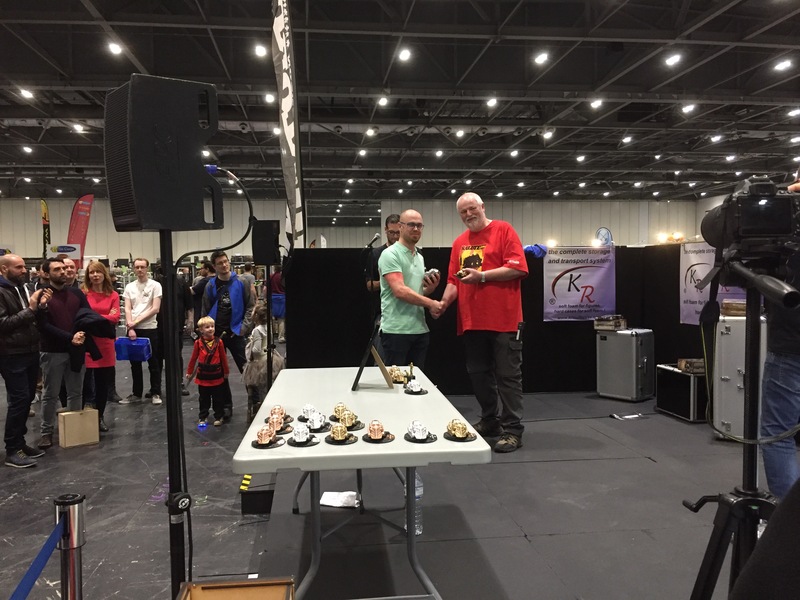 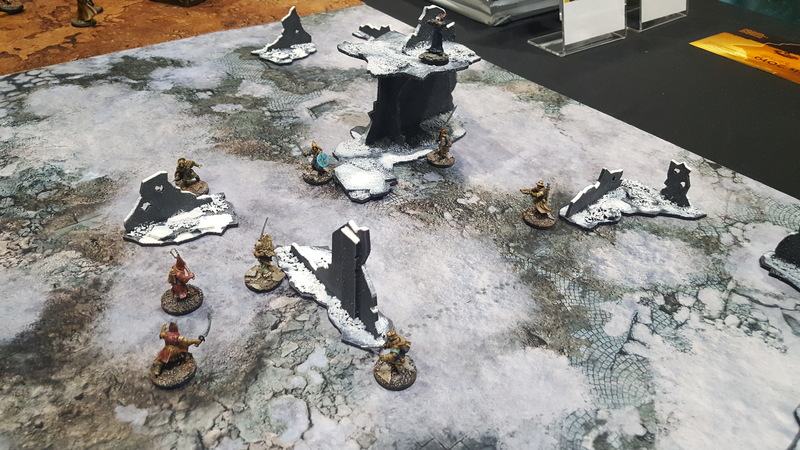 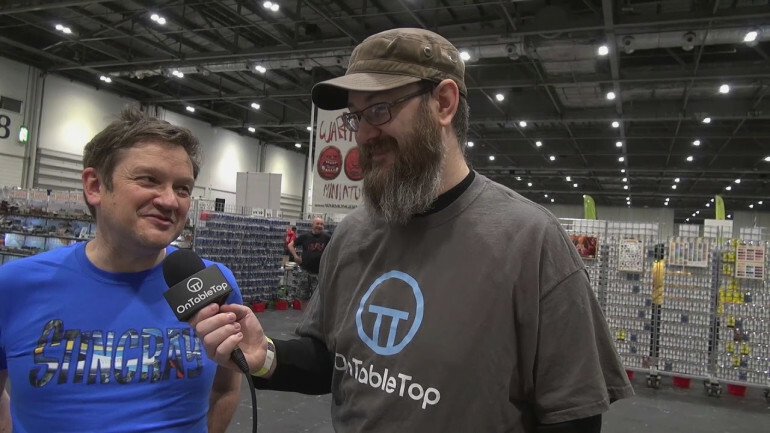 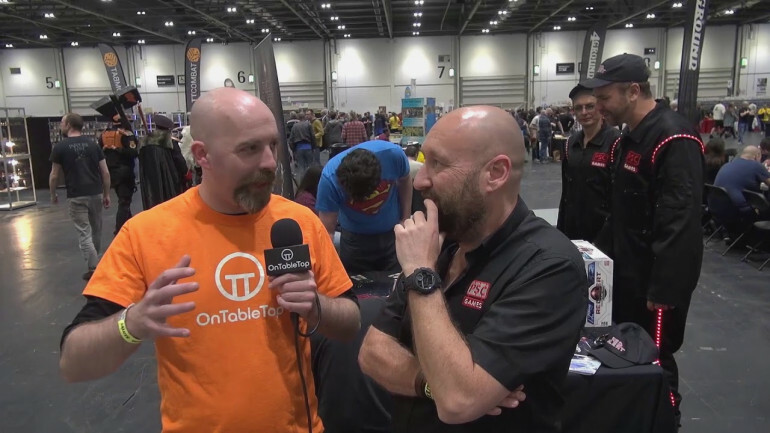 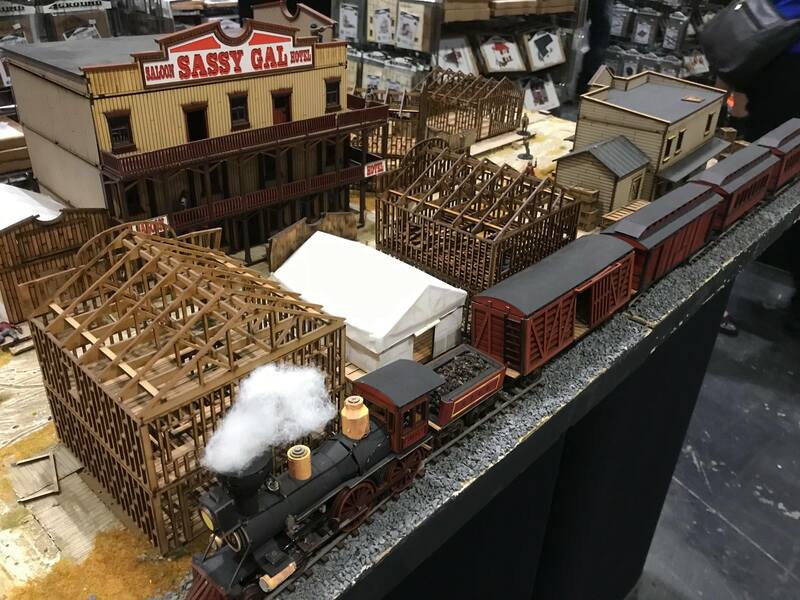 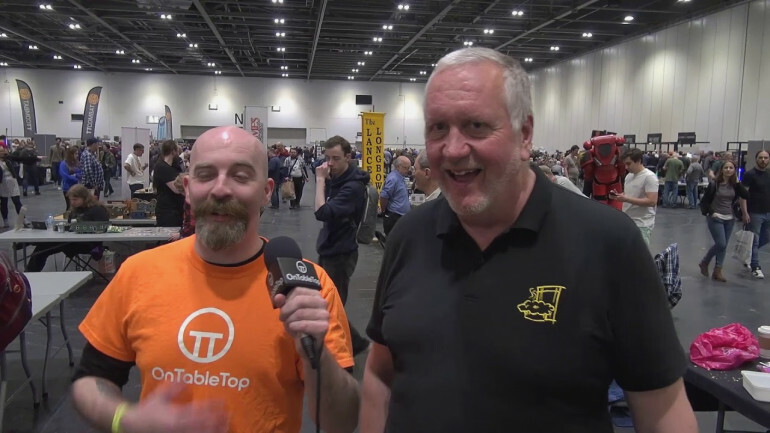 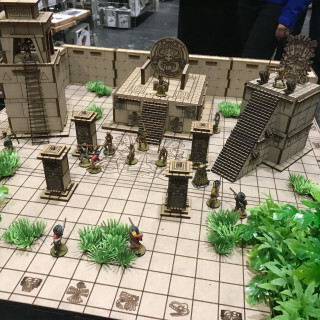 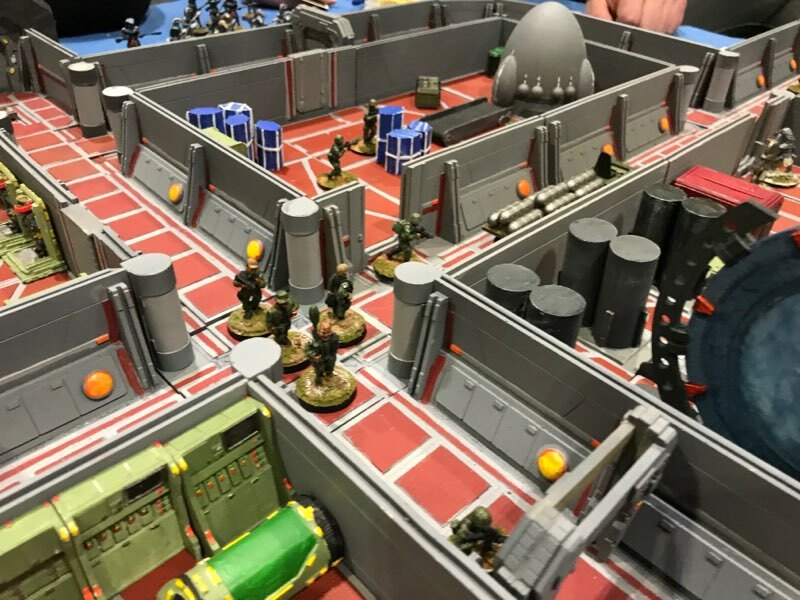 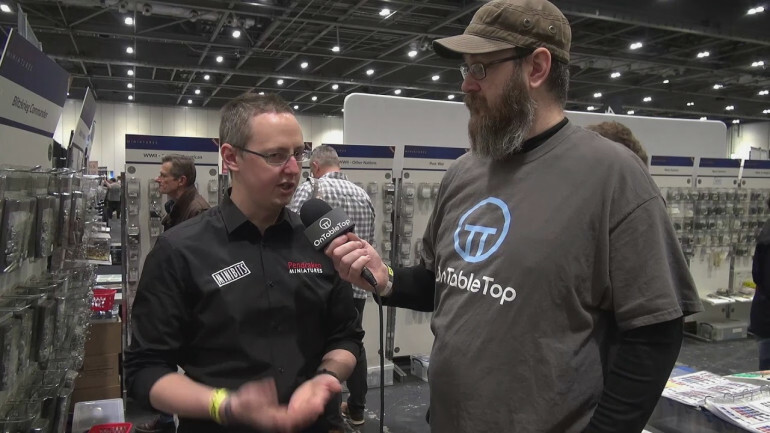 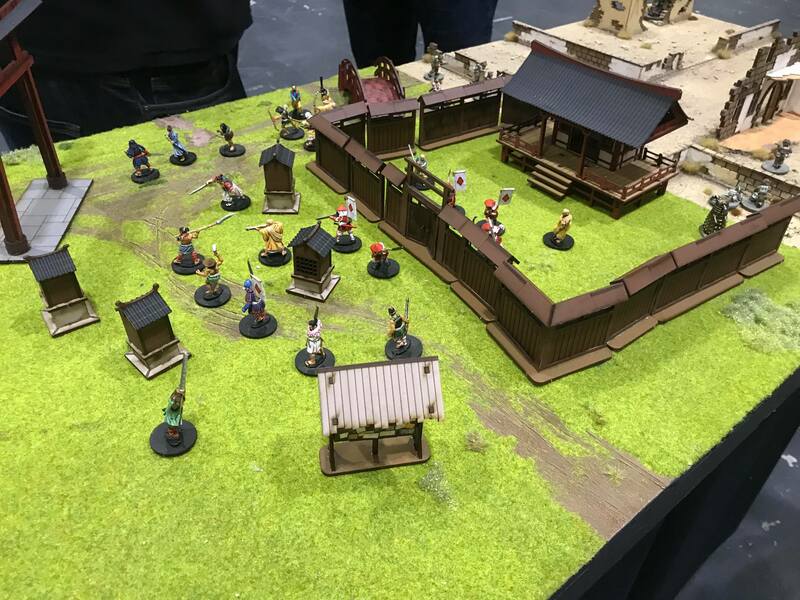 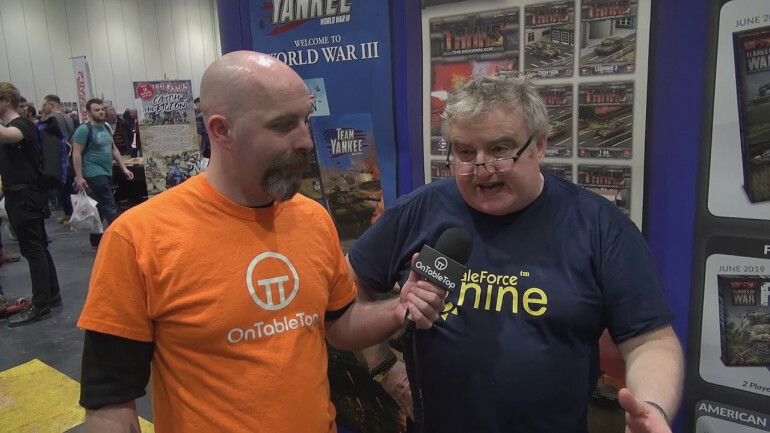 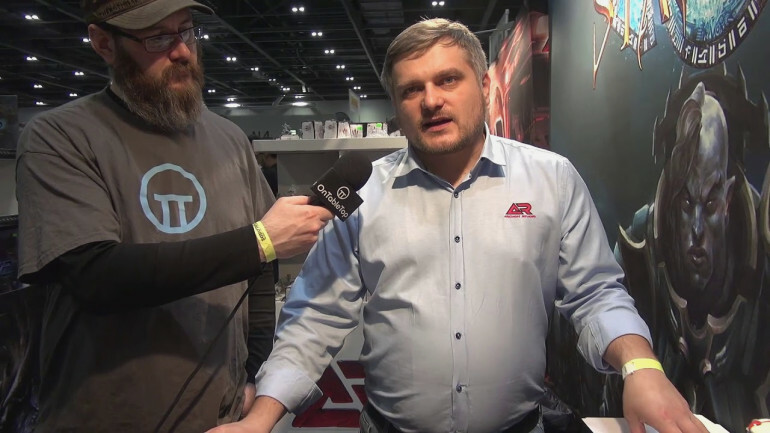 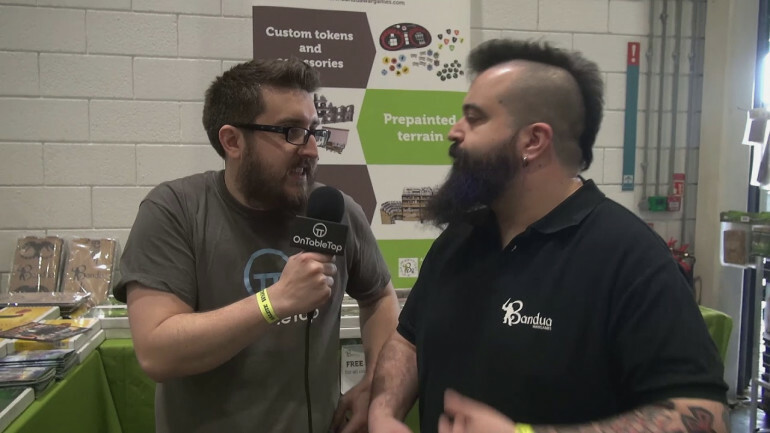 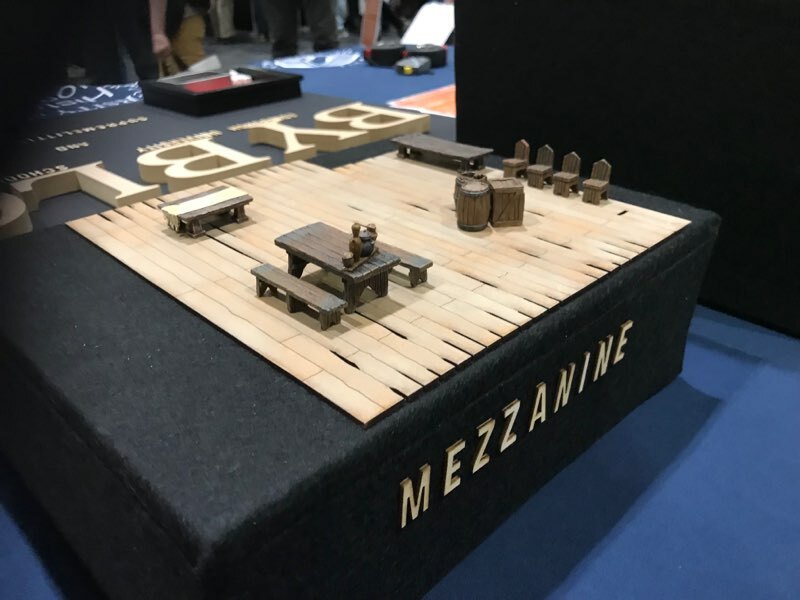 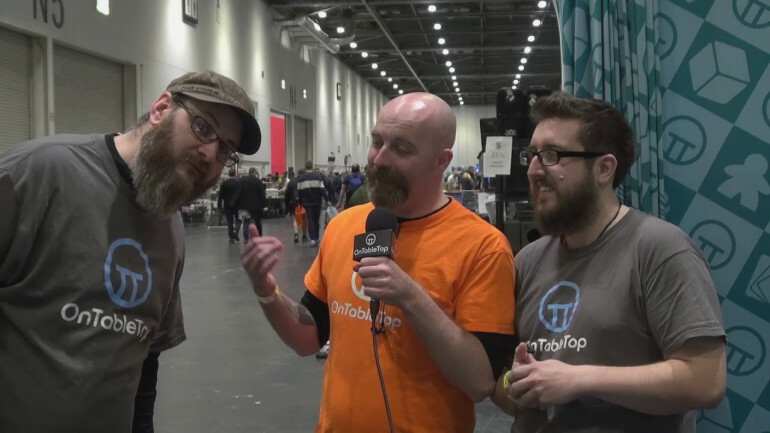 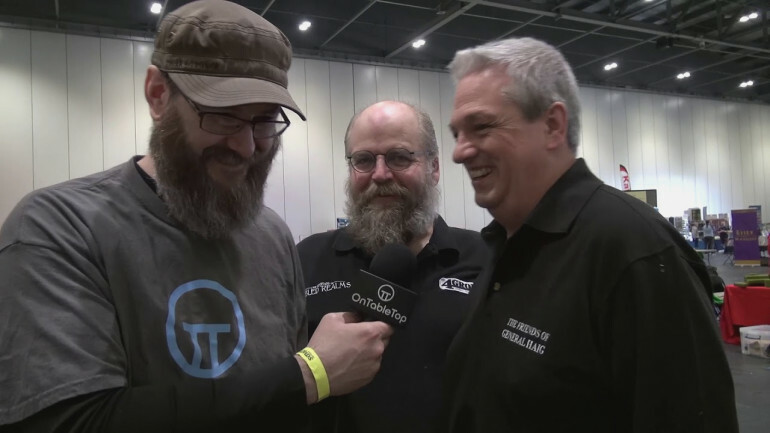 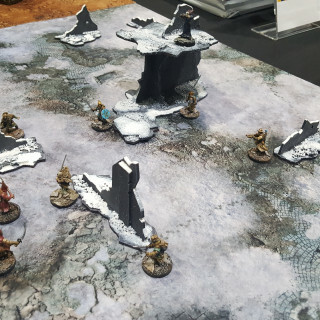 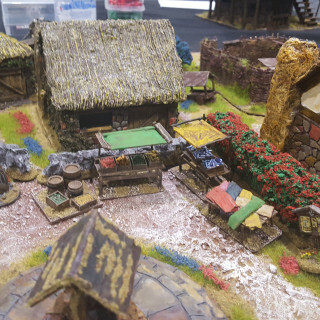 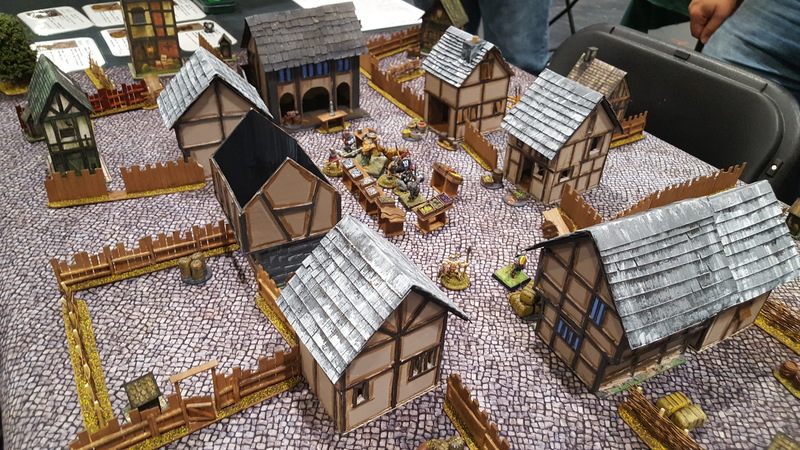 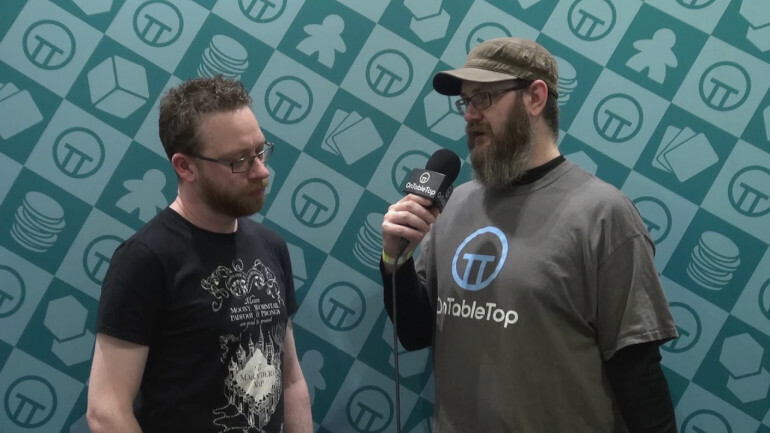 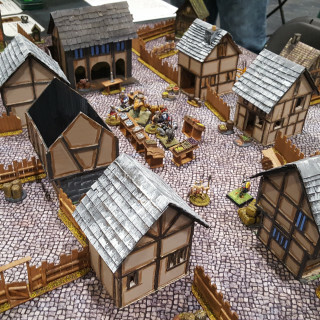 We had a lovely chat with Mel TheTerrainTutor about his experience here at the show as well as what he has planned for the final week of his Kickstarter alongside Dave Taylor to bring to life a Terrain Essentials Book. 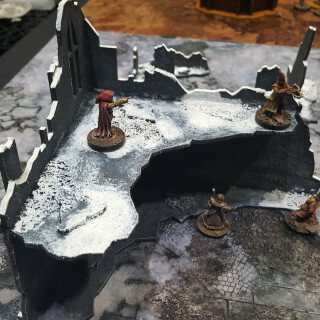 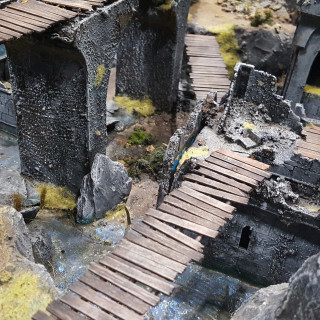 Mel is an awesome chap and we can’t wait to see what folks make of his terrain making tips! 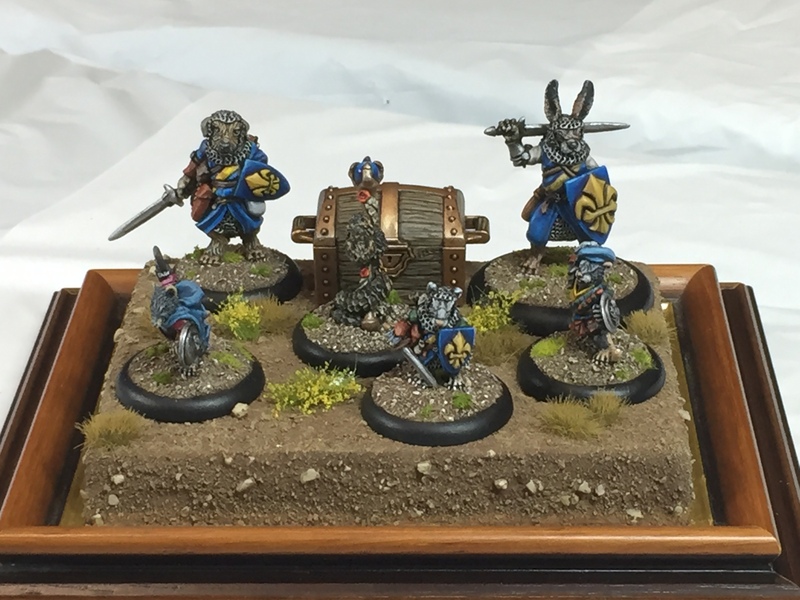 I couldn’t go through an entire Salute without delving down into some Burrows & Badgers. 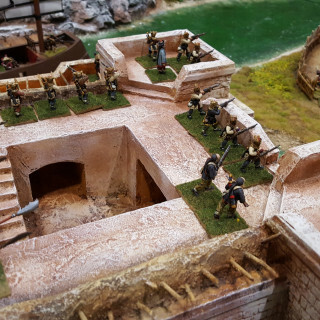 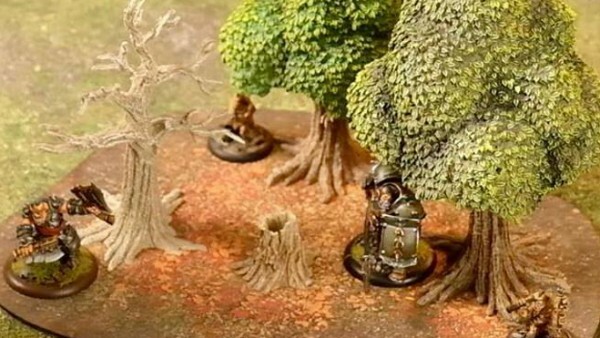 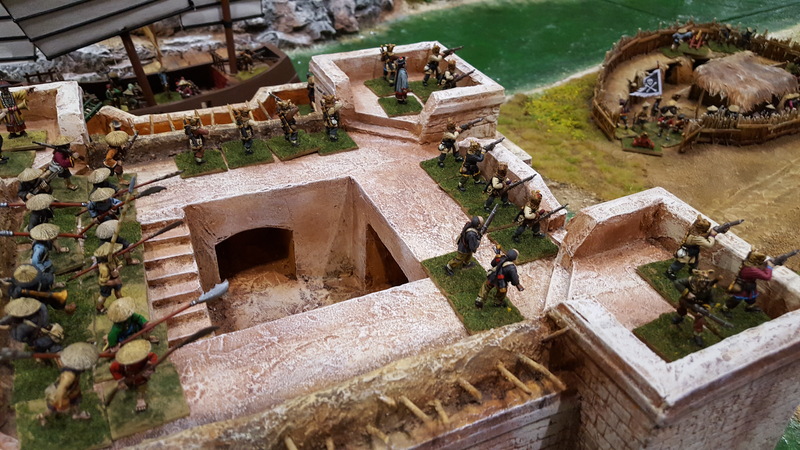 @soldado from the website has made an amazing tabletop here packed with very characterful terrain which is perfect for some skirmishes on the tabletop with your warbands. 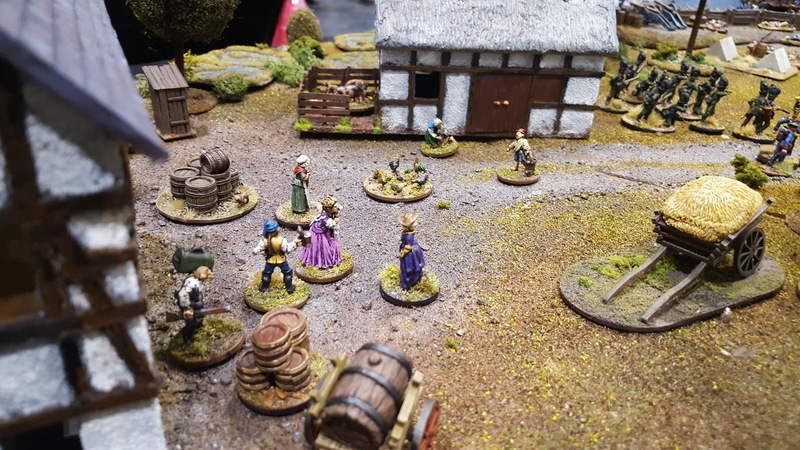 The team from Oathsworn have been having a wonderful time here too at the event, selling loads of miniatures and doing demo games which have been packed every time we’ve come to see them. 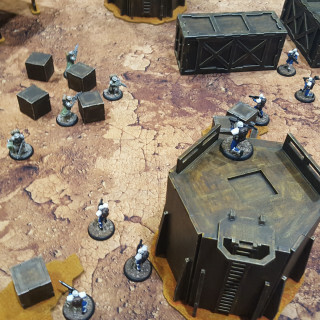 Battlefront Miniatures Update Us On What's Next! 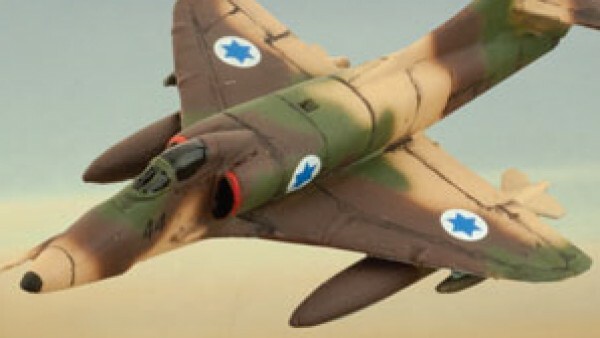 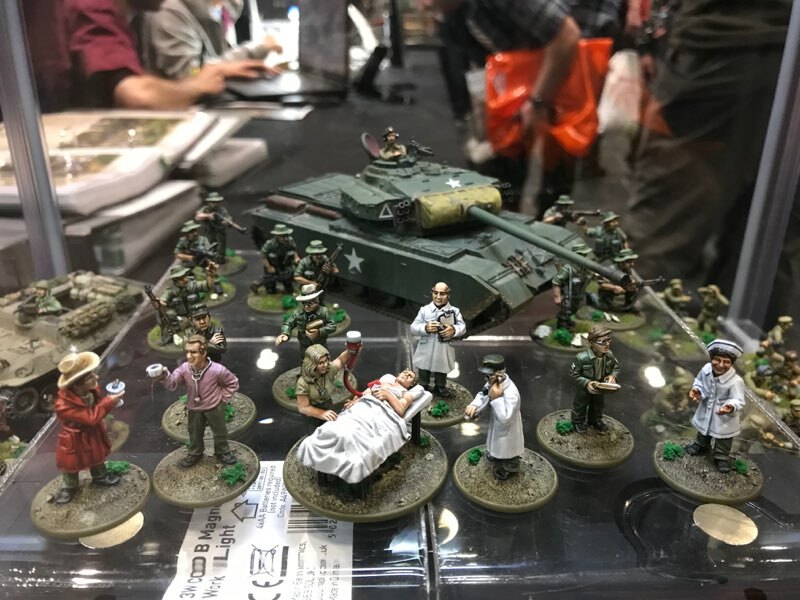 The team at Battlefront Miniatures give us a rundown of some of the new stuff coming your way for their games including of course Oil War and all sorts for Team Yankee, Tanks, Flames Of War and beyond. 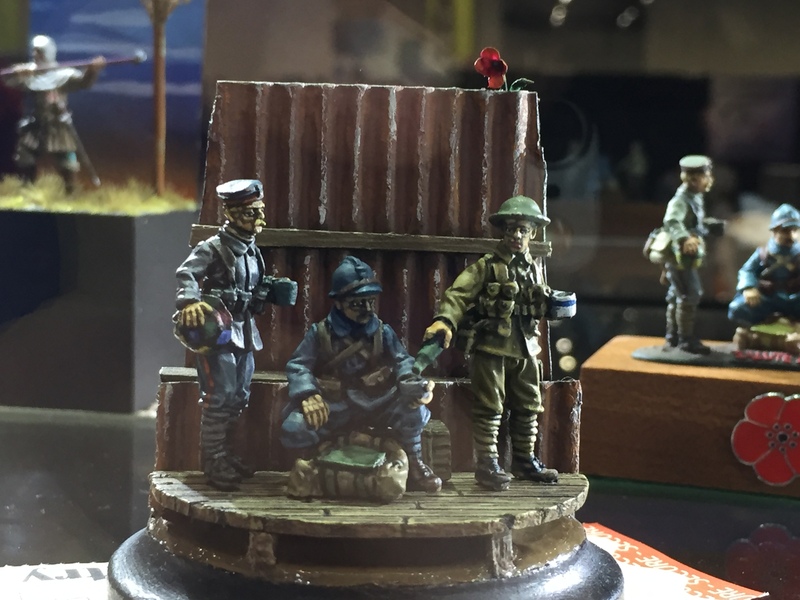 You might have seen an unboxing for Oil War recently and the Let’s Play for Great War which was really good fun. 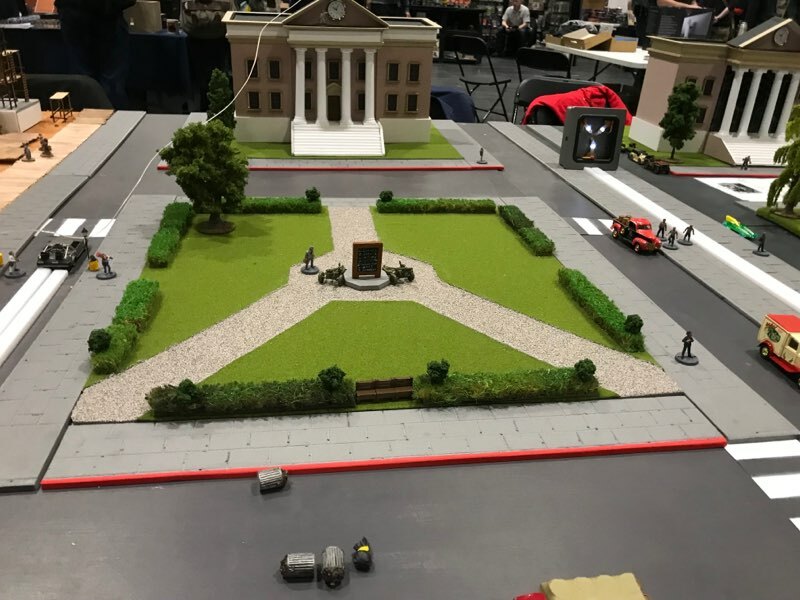 Vehicular Combat Comes To Albedo! 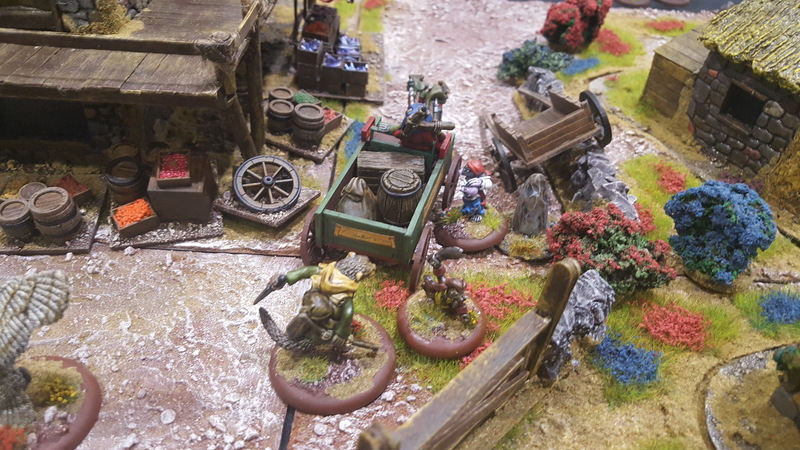 A range of new vehicles and more have been added into the mix for Albedo. 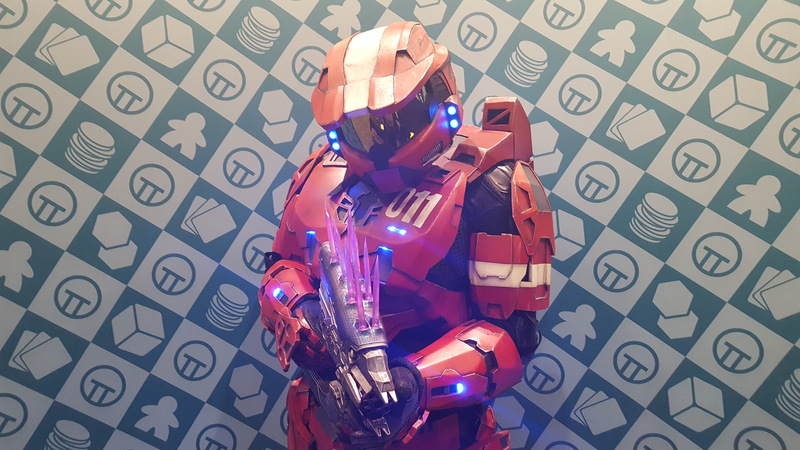 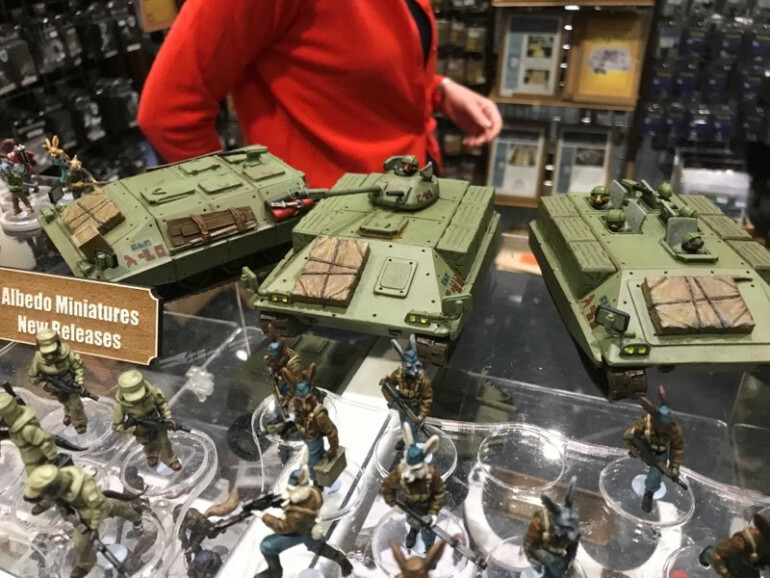 There are all sorts of interesting new bits and bobs popping up where you’ll not only get to play around with all sorts of new troopers but also throw armour into the mix. 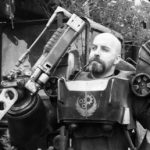 Warcradle Give Us An Update + Win A Prize! 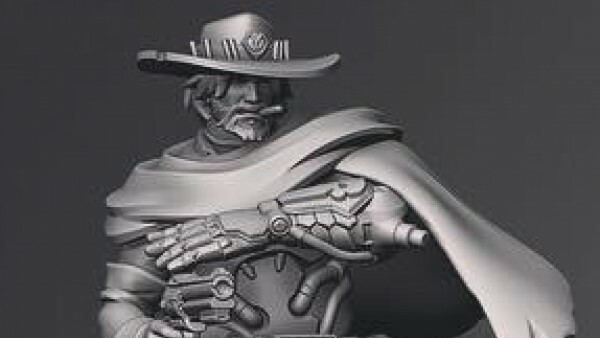 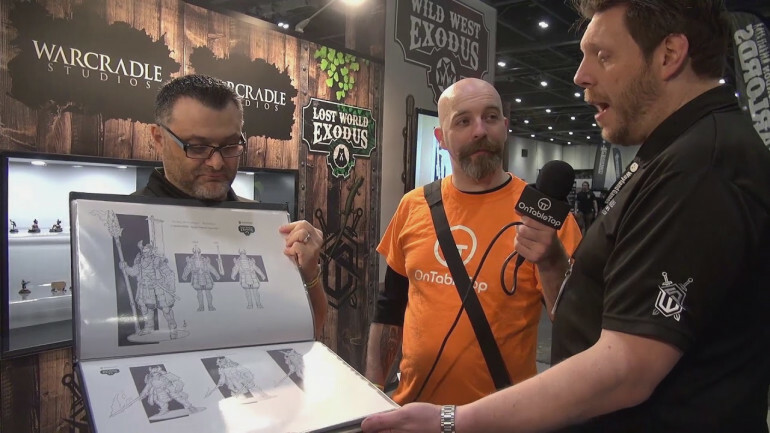 You can come and get involved with a big discussion from Warcradle Studio where they give us an update on all things Wild West Exodus, Lost World Exodus and of course Dystopian Wars. 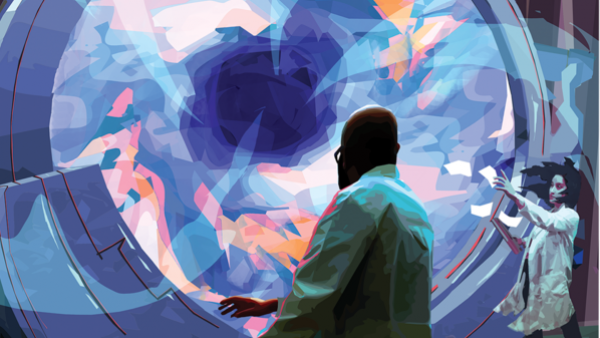 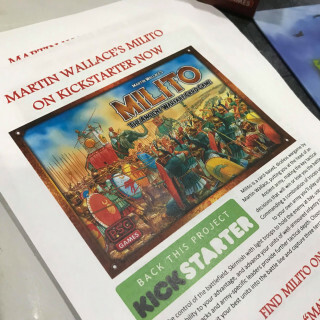 Make sure to get involved as we also talk with Roberto about the new artwork he has been doing! 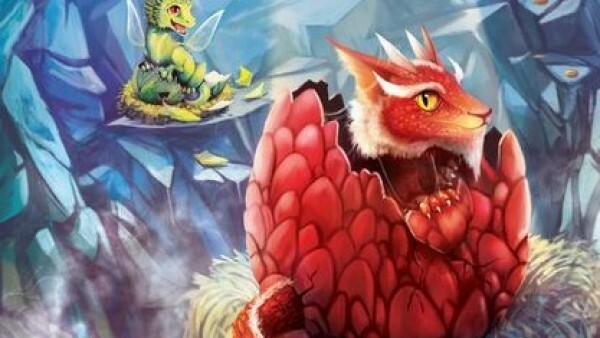 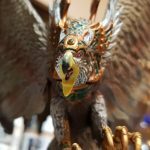 Creature Caster And Their Wonderful Creatures + Win A Prize! 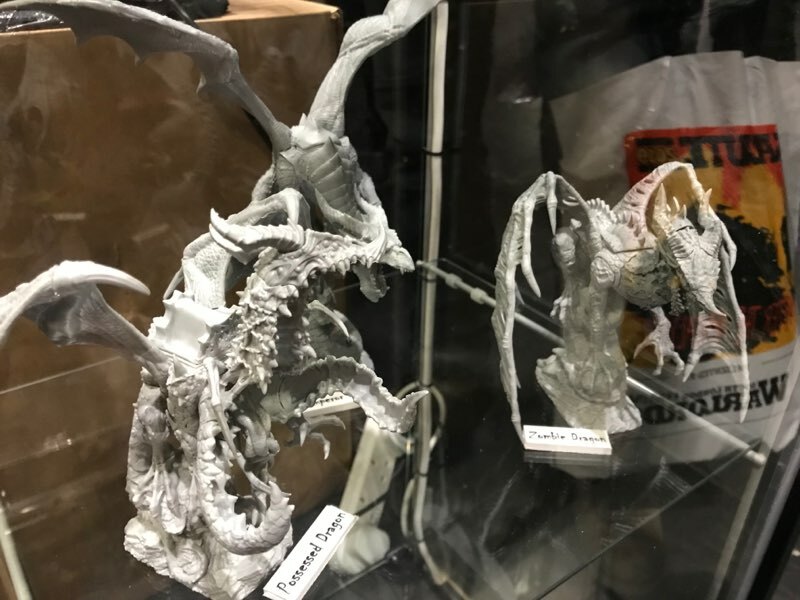 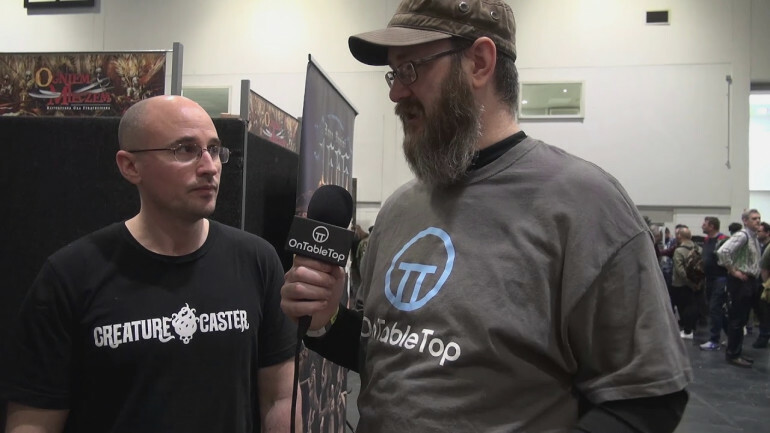 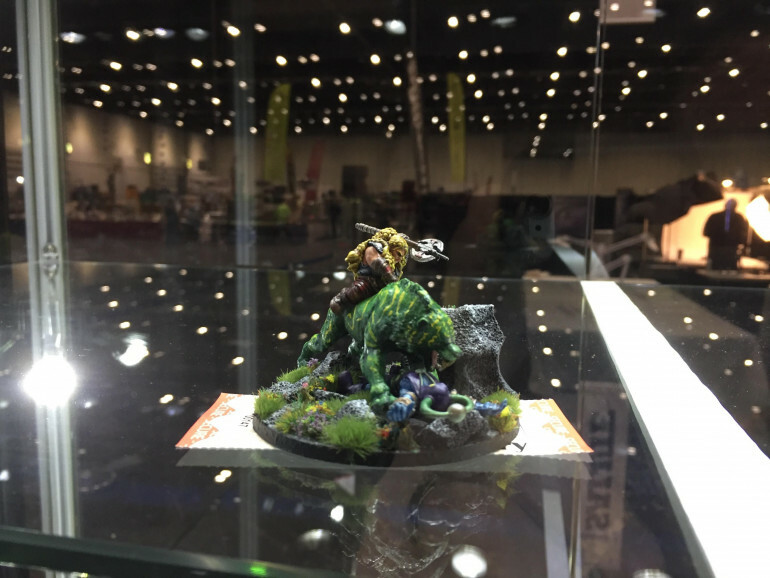 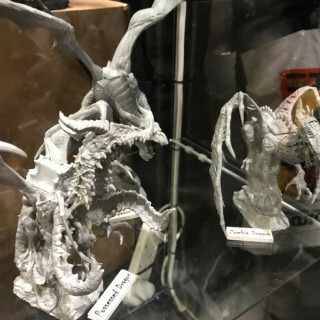 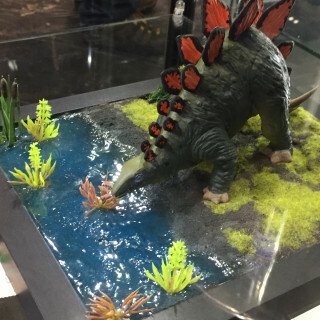 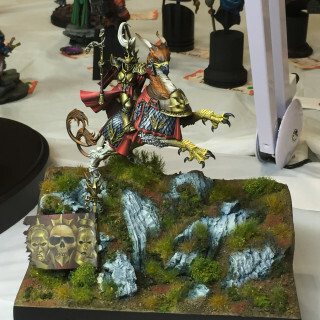 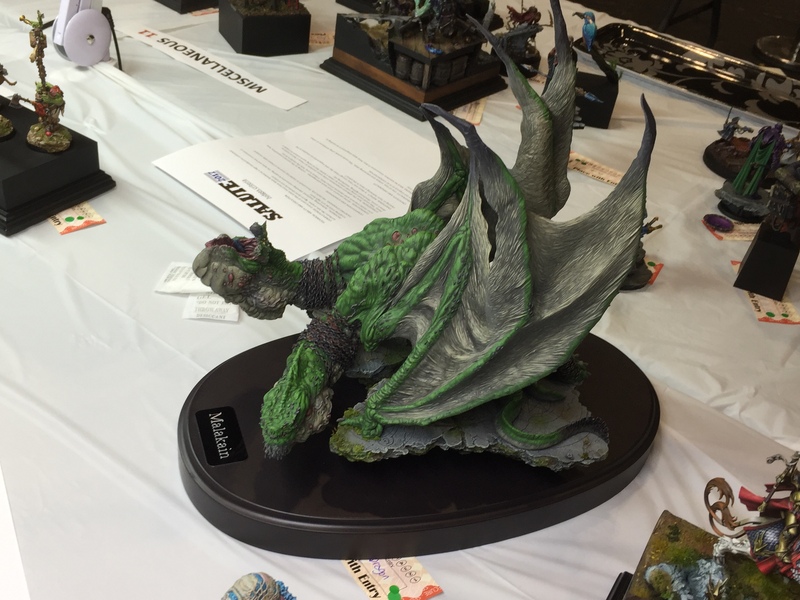 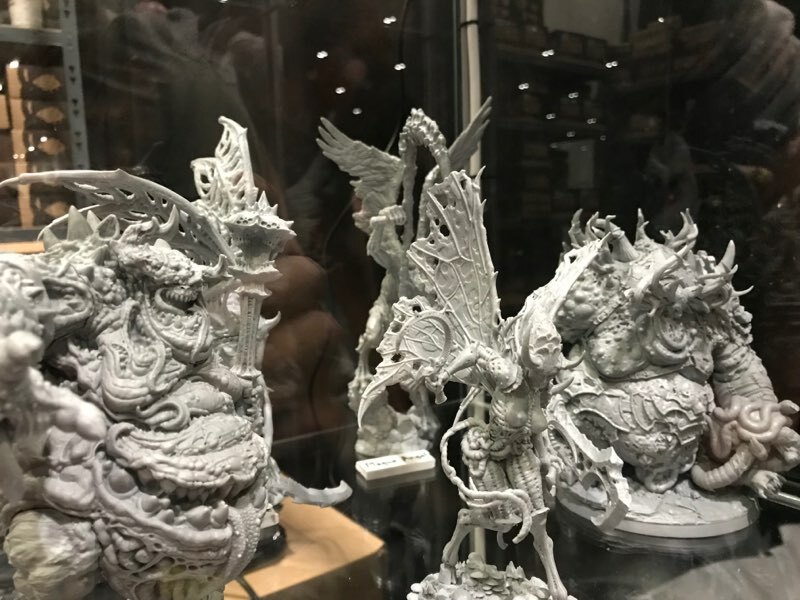 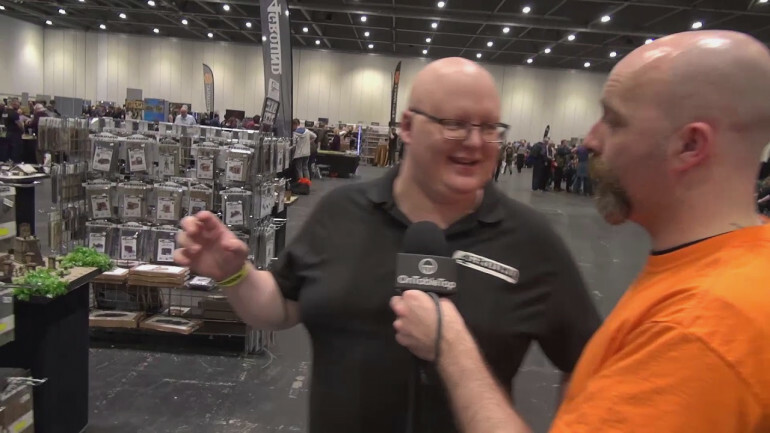 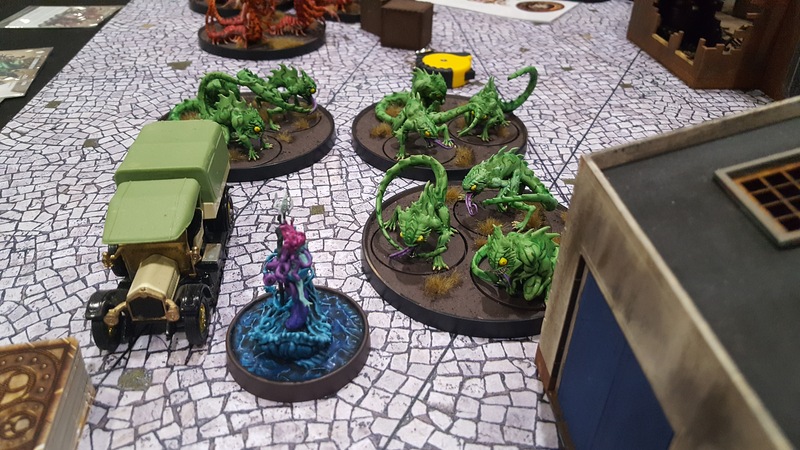 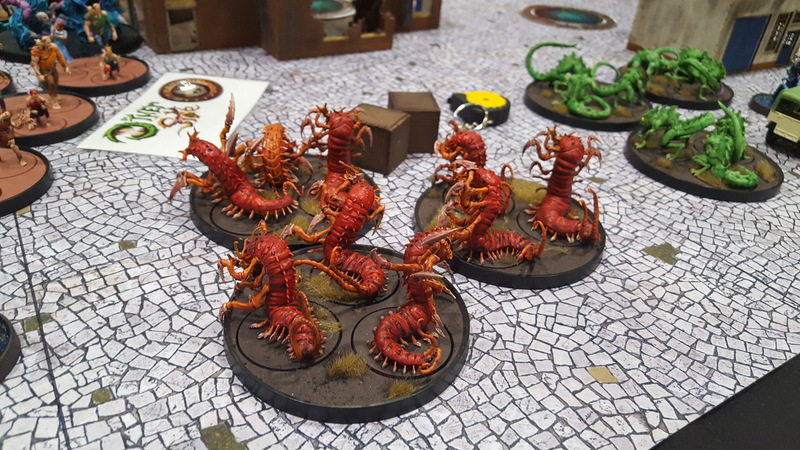 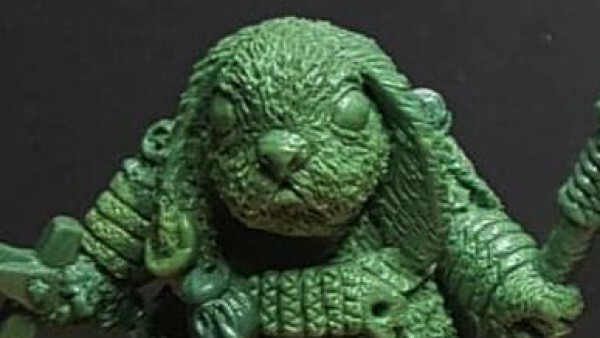 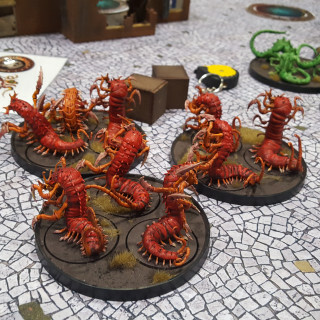 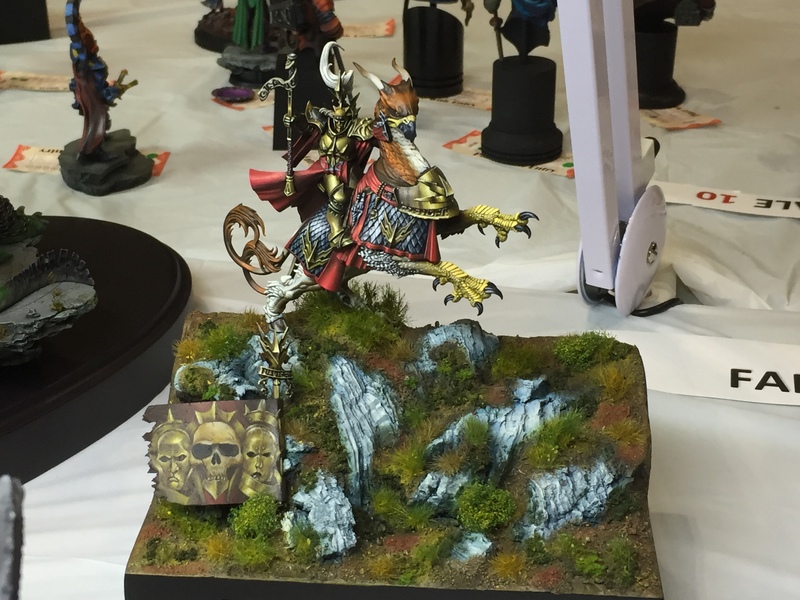 We get a chance to talk with the team from Creature Caster as they show off their amazing range of wonderful creatures and monsters BUT also some of the additional bits and piece they are also working on for hobbyists and painters. 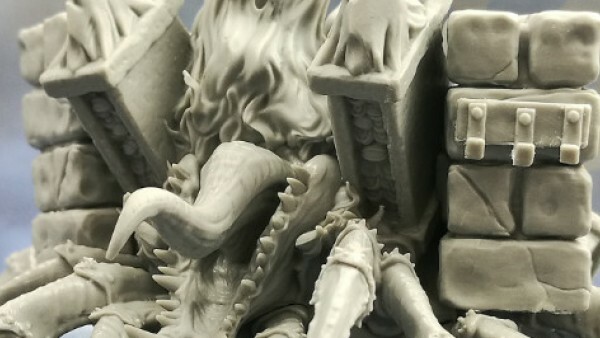 Make sure to get stuck in here and tell us which of their monsters are your favourite. 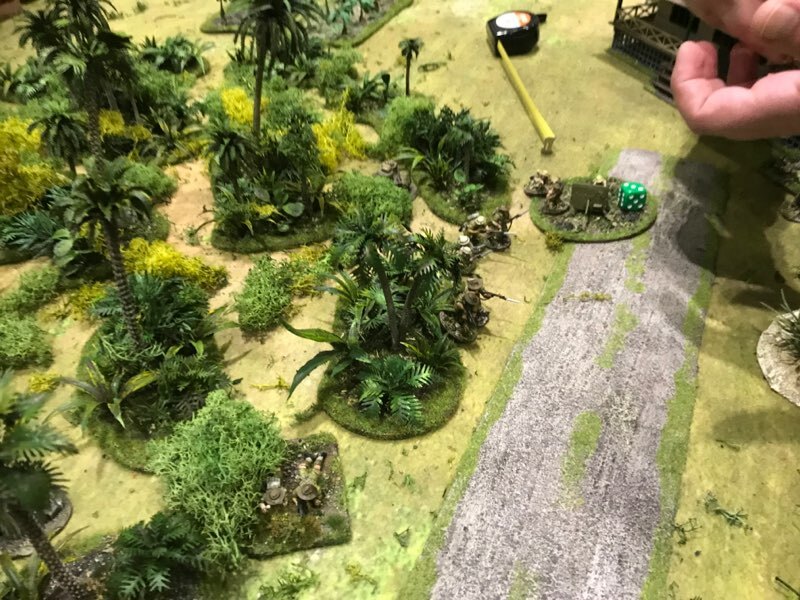 TooFatLardies Take Us To Vietnam + Win A Prize! 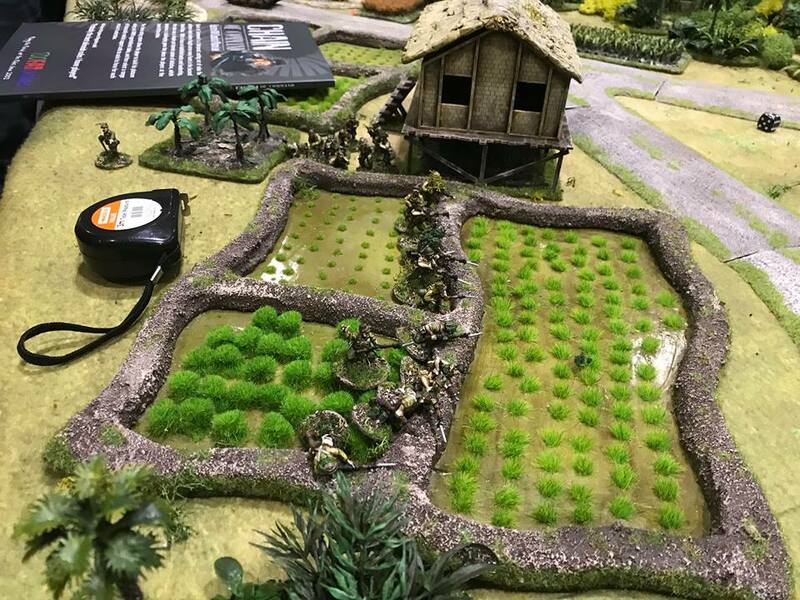 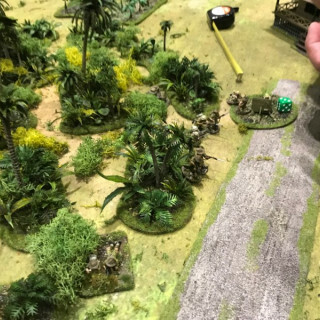 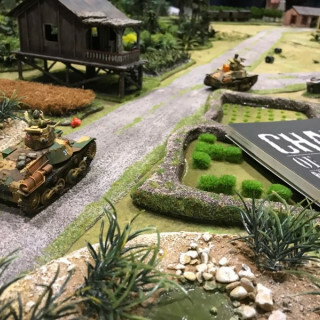 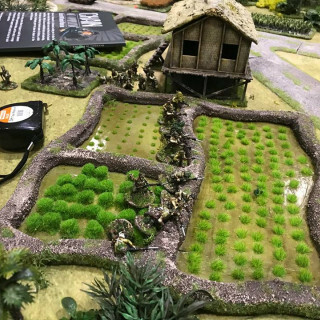 We managed to catch up with Rich from TooFatLardies as he delved into their new rulebook which will be taking them to…Vietnam! 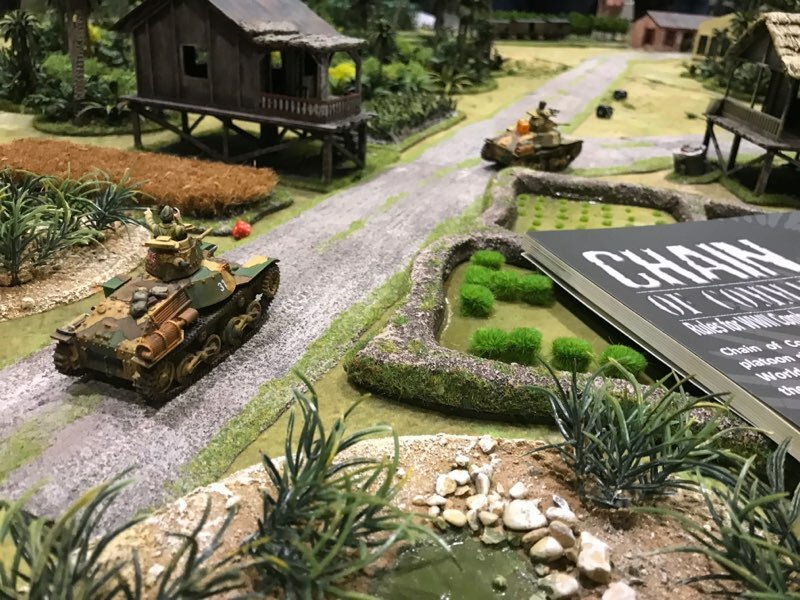 Make sure to let us know what you think of their games and if you’re going to be joining them in the Vietnamese theatre of war! 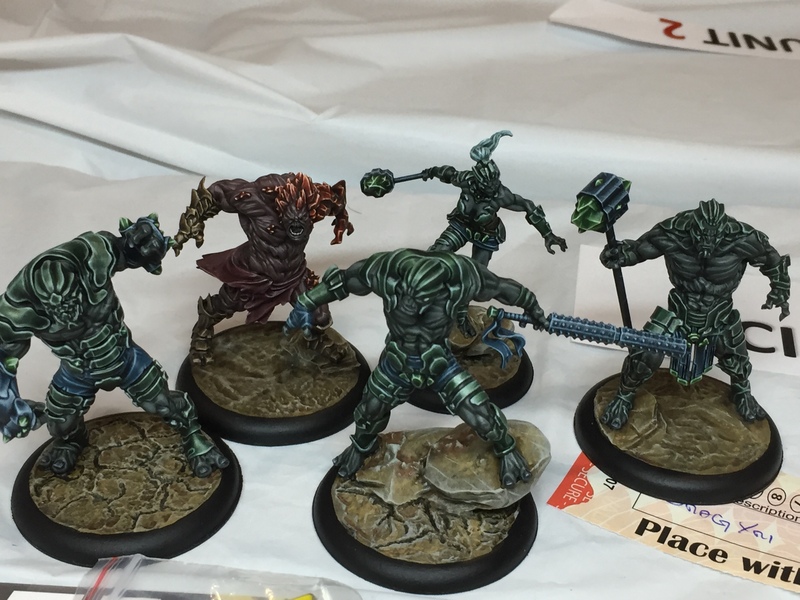 Checking Out Deep-Cut's New Designs + Win A Prize! 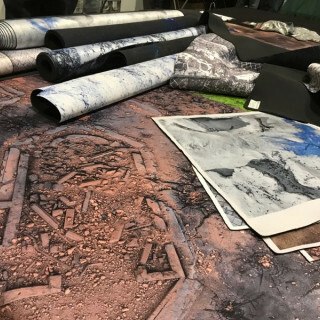 Deep Cut bring a veritable treasure trove of mats to Salute with most selling out pretty quickly. 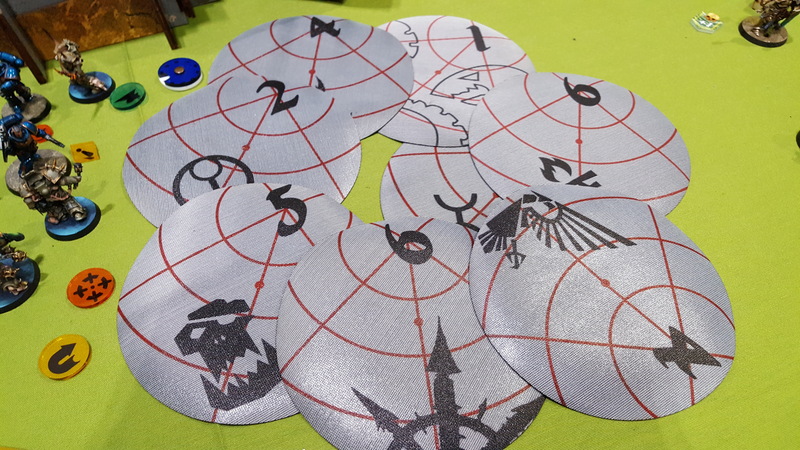 Some of their popular mats are the Guildball and Infinity mats with the latter almost selling out. 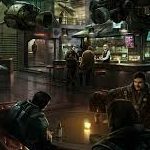 Justin tries his best to try and worm out some information of where Deep Cut are headed next with potentially some interesting hints within! 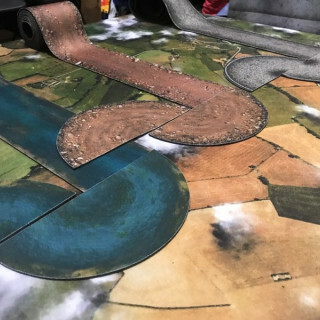 Comment below to let us know what you think of the awesome battle mats from Deep Cut! 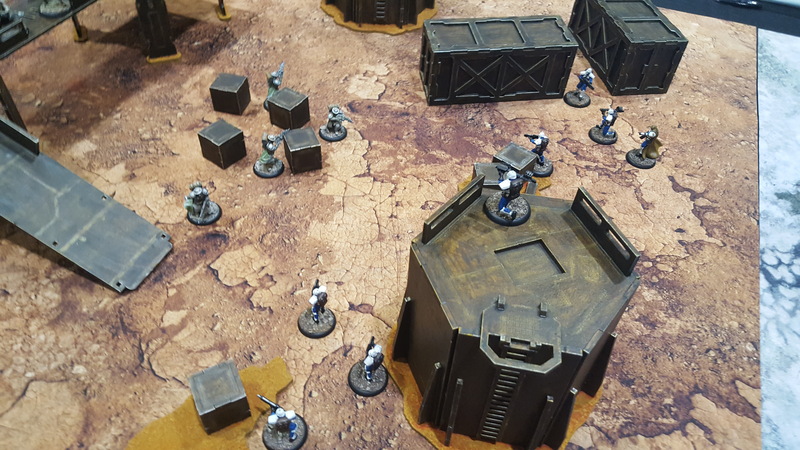 Archon Reveal StarCide & New Terrain Options + Win A Prize! 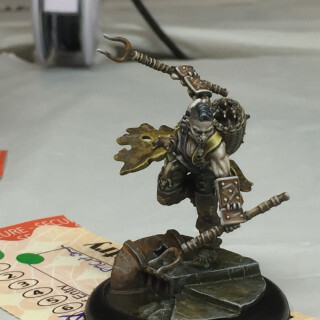 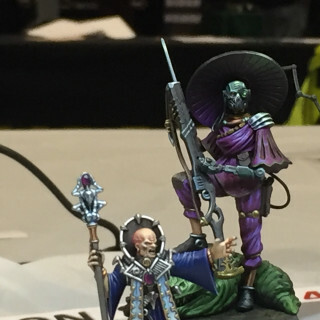 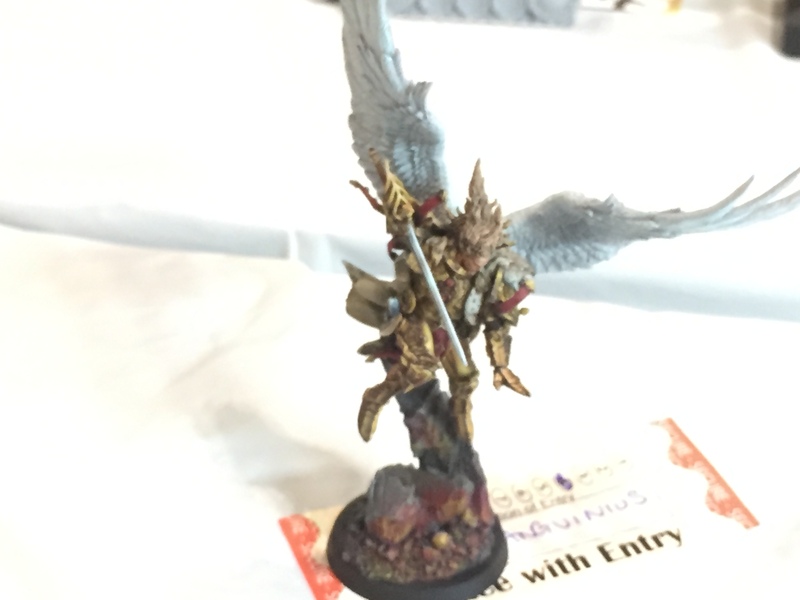 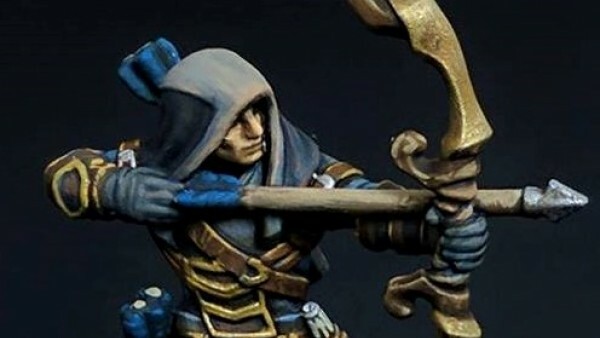 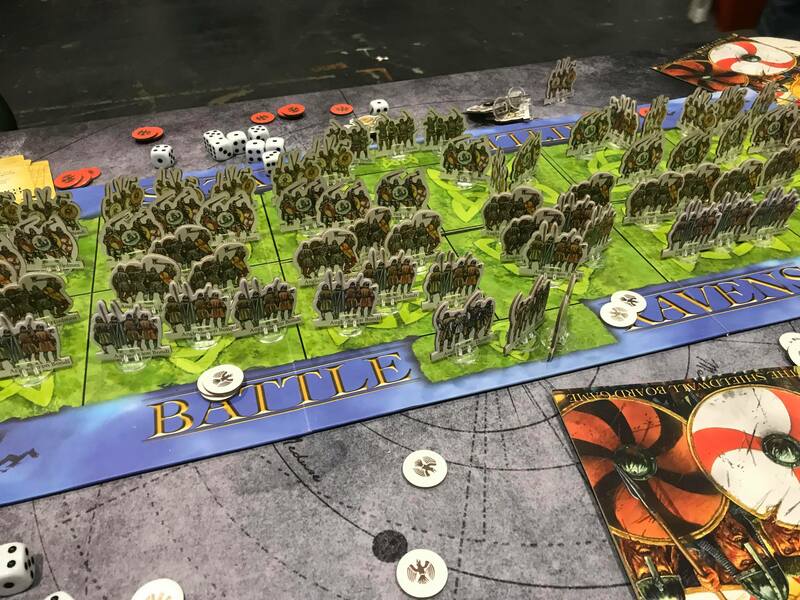 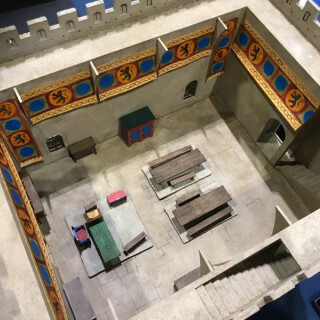 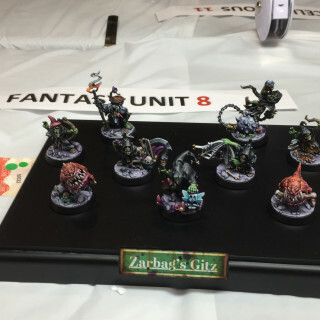 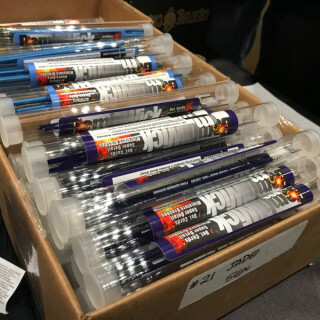 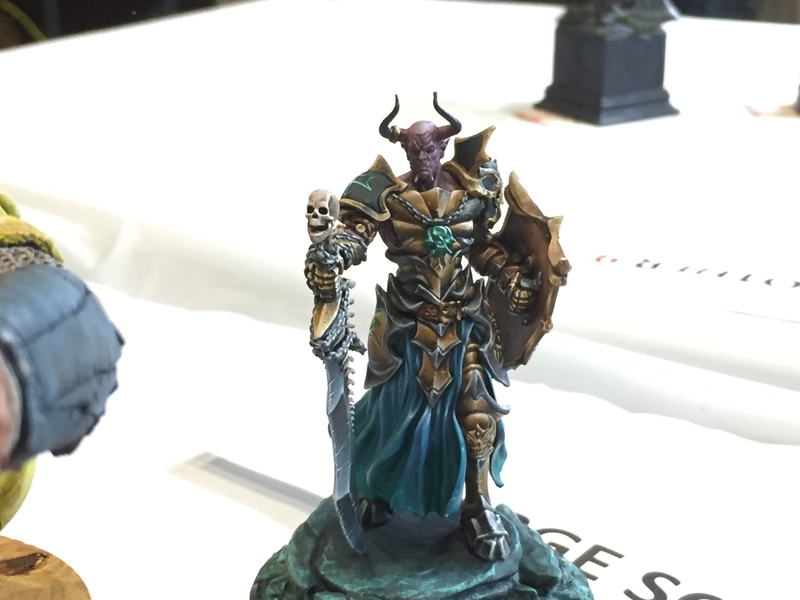 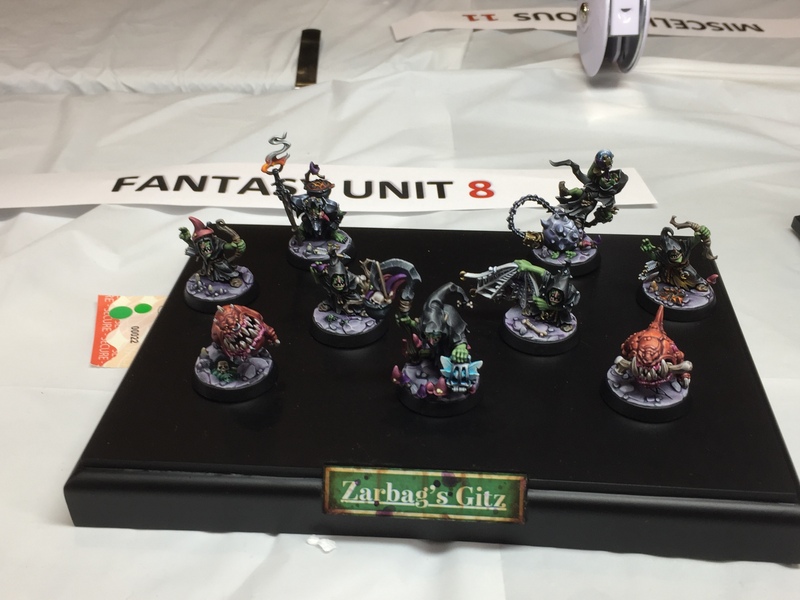 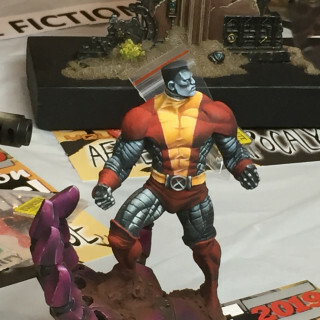 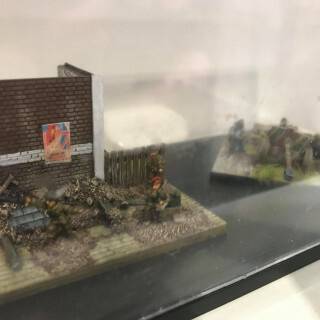 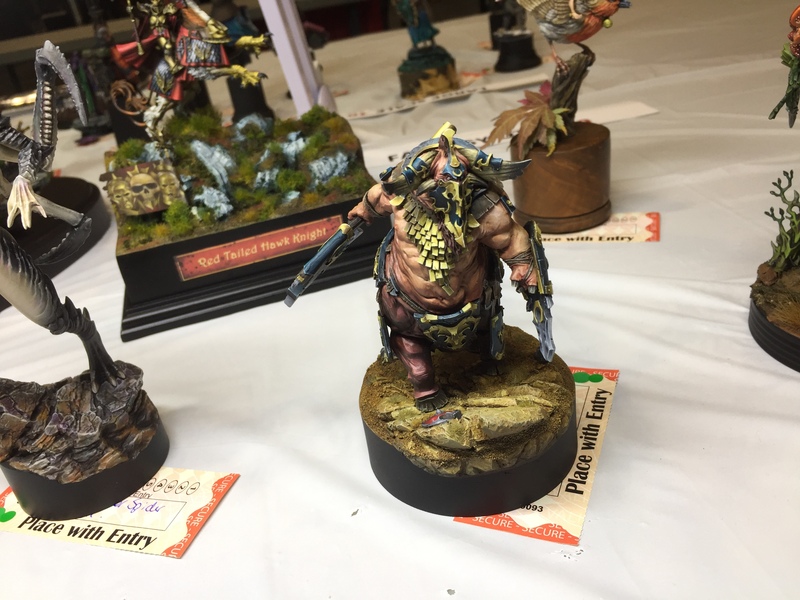 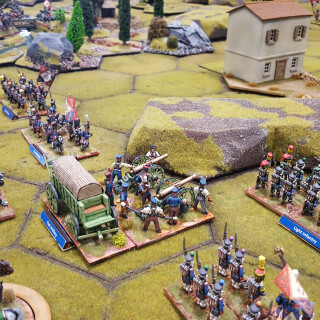 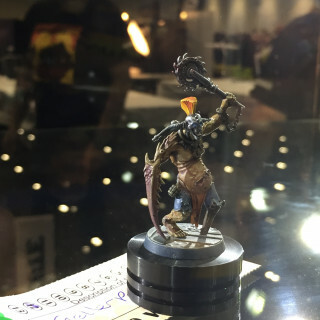 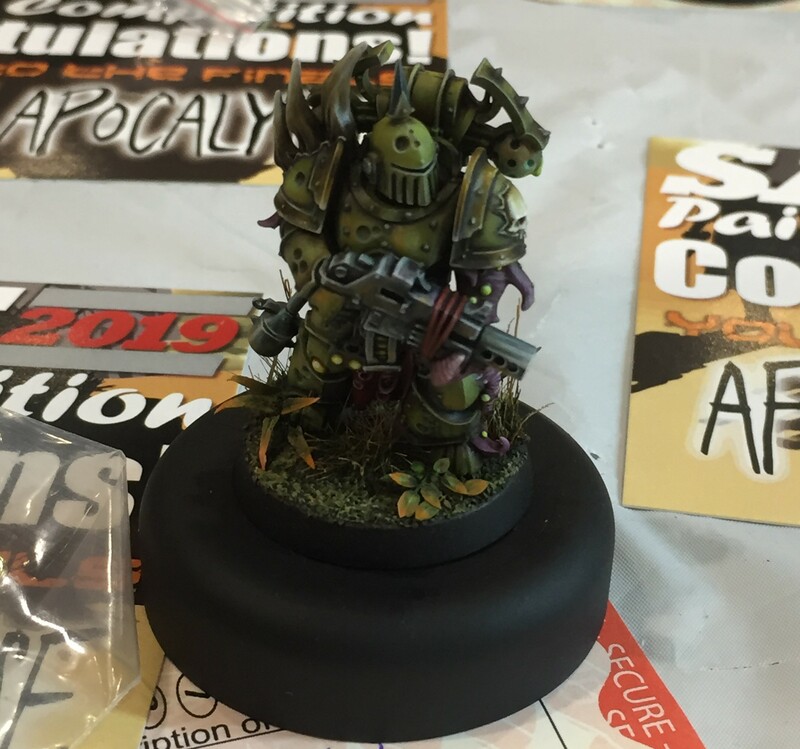 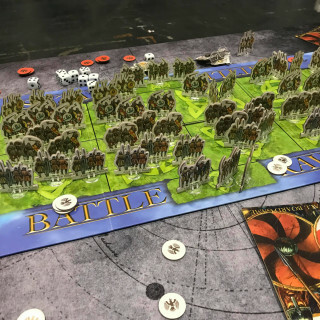 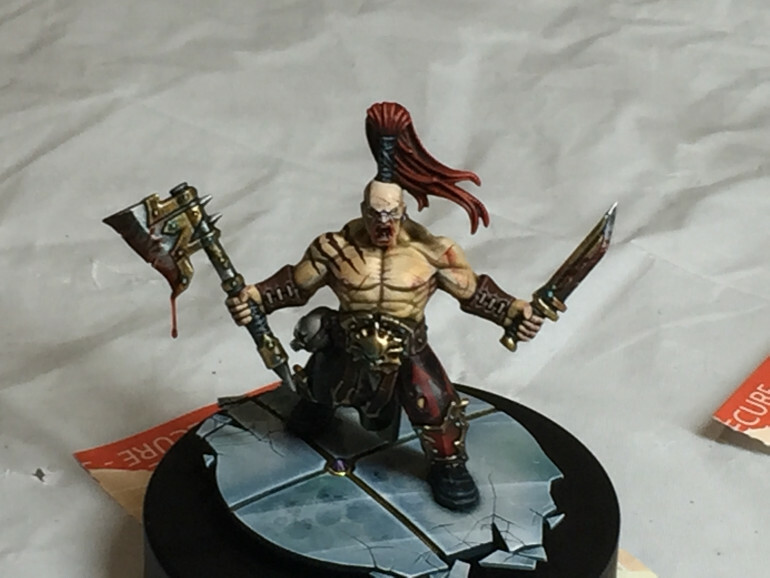 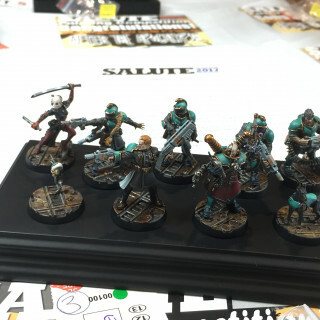 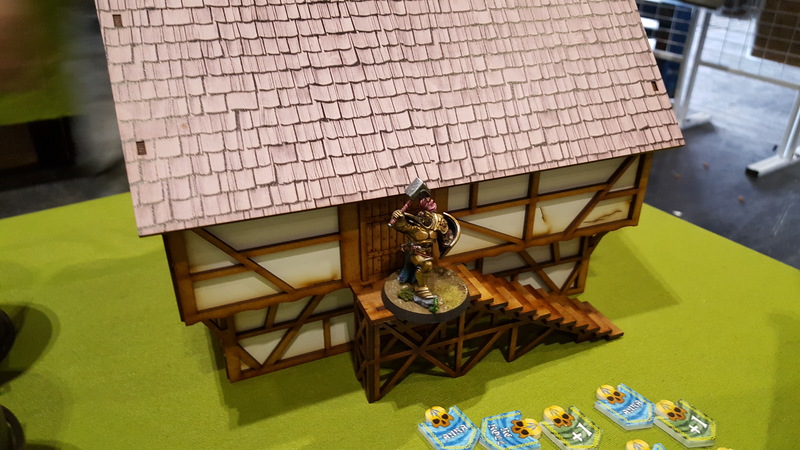 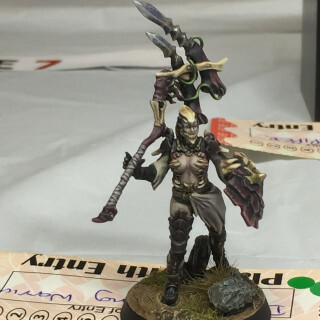 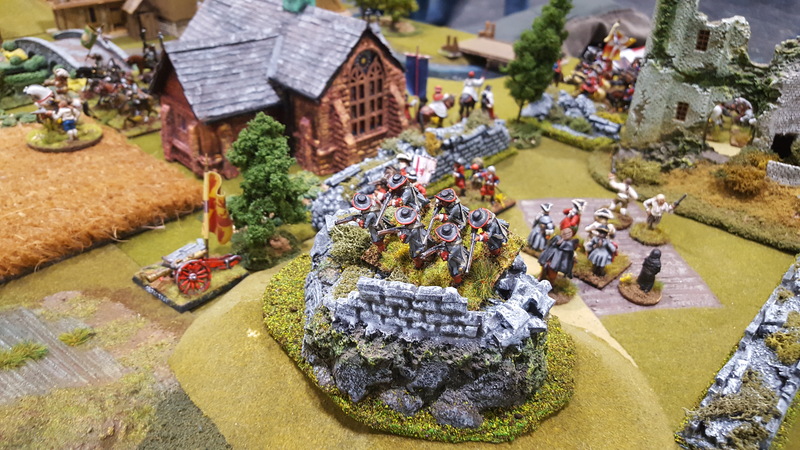 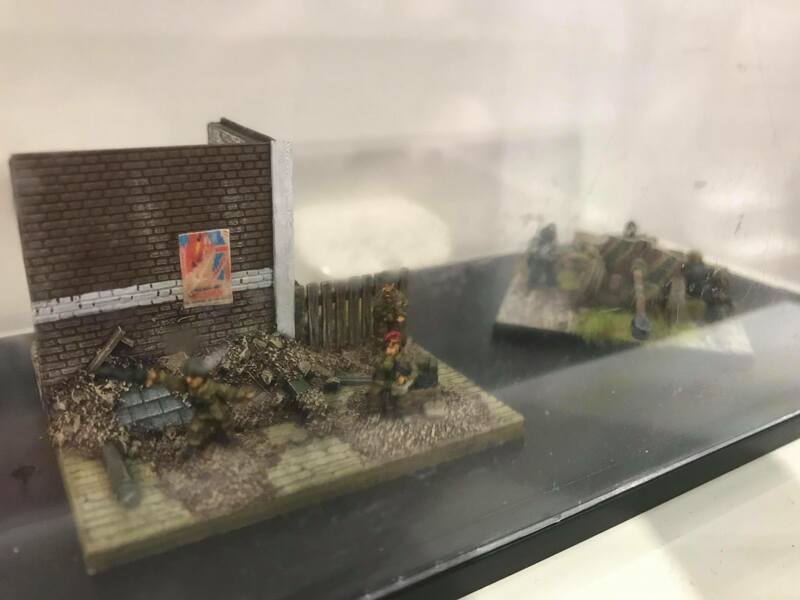 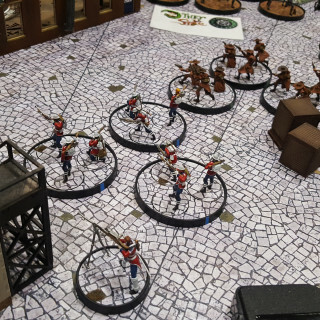 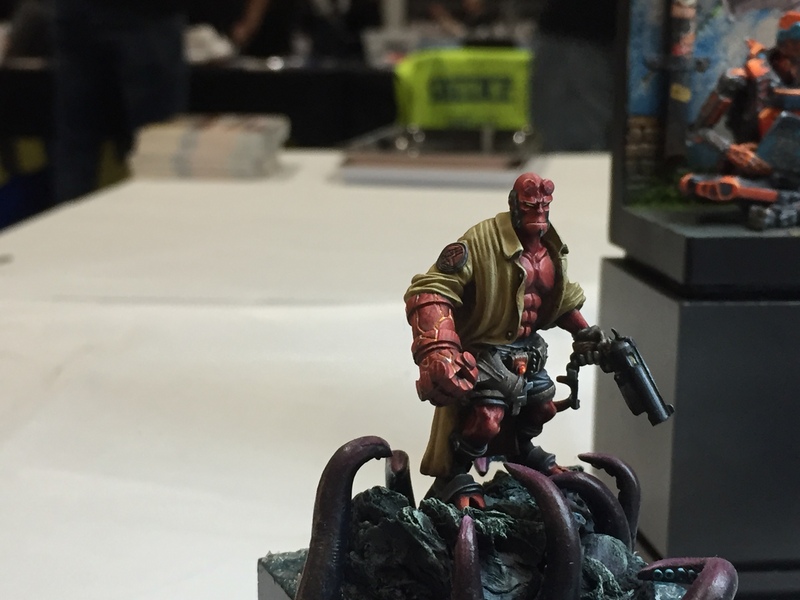 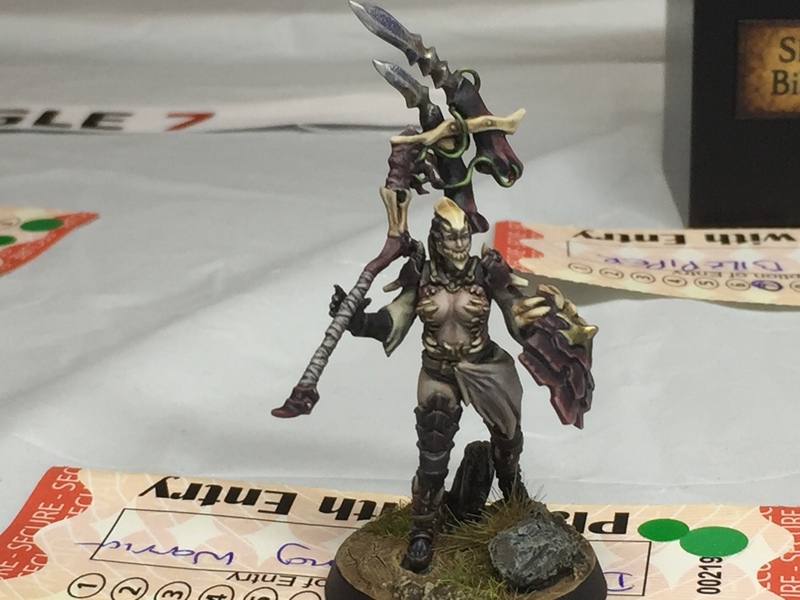 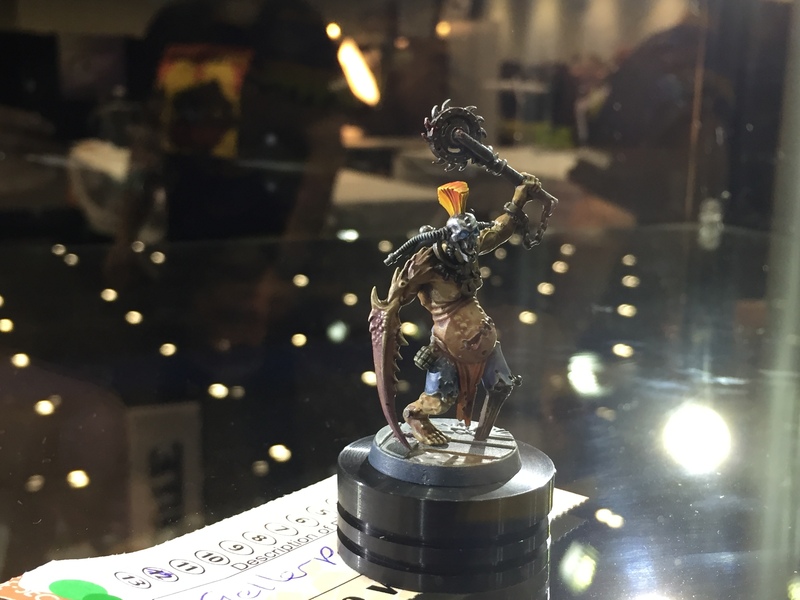 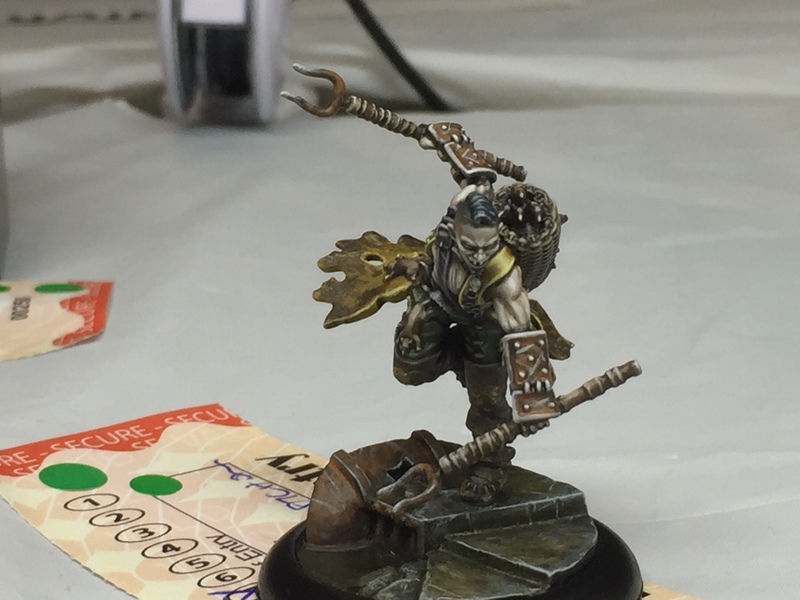 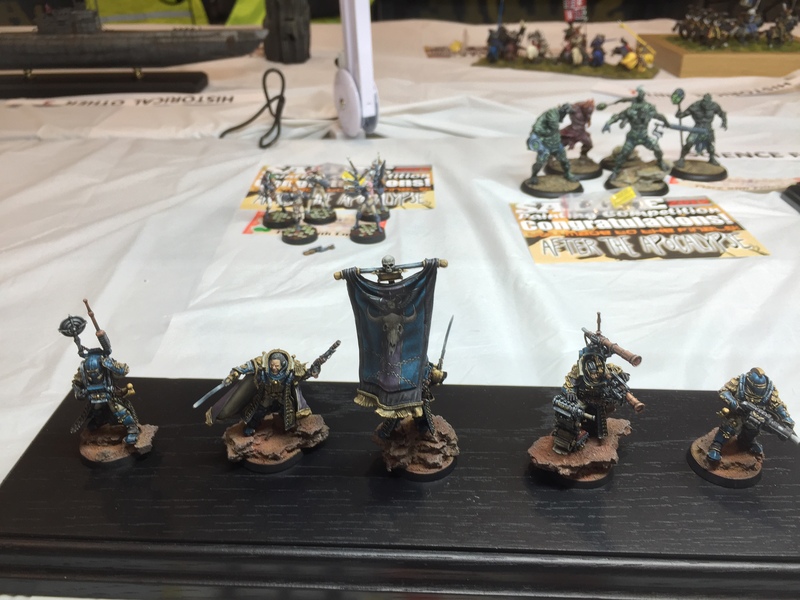 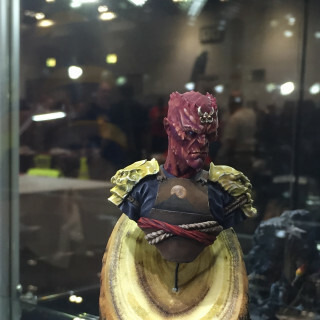 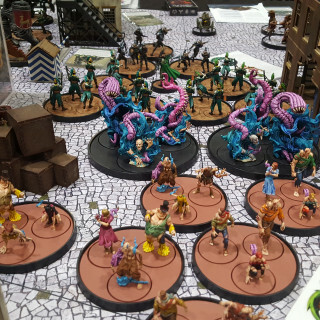 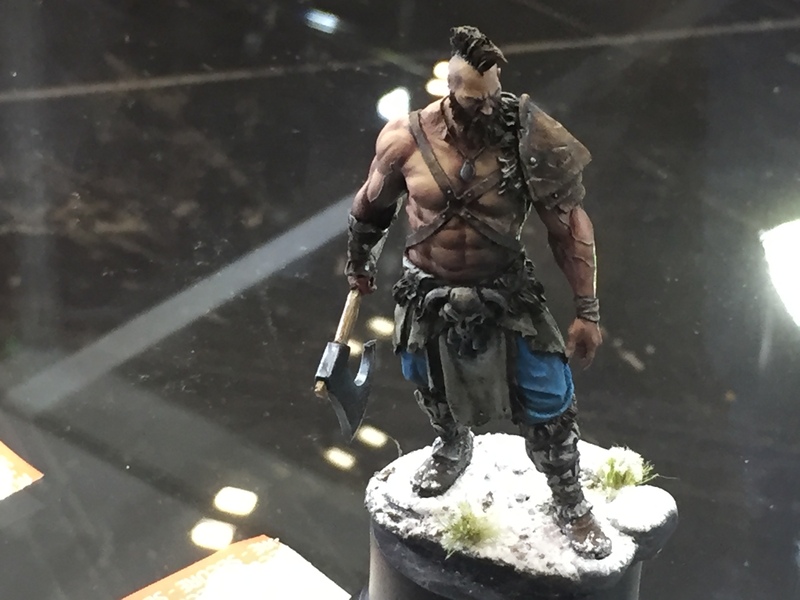 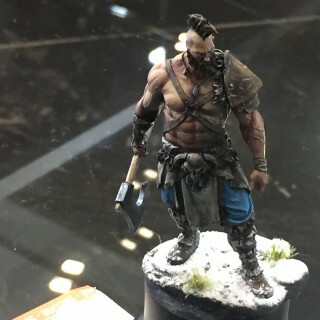 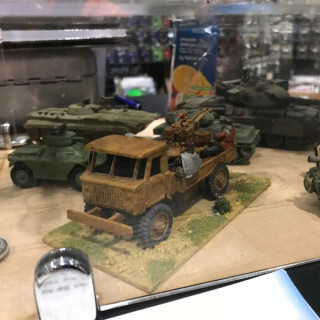 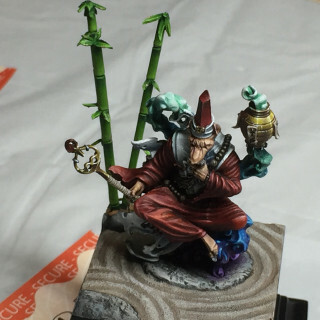 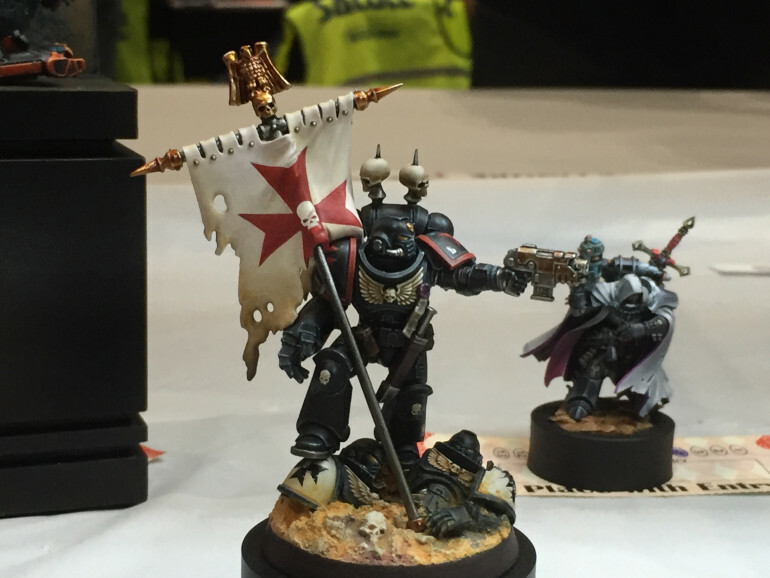 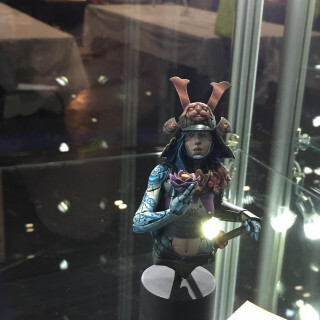 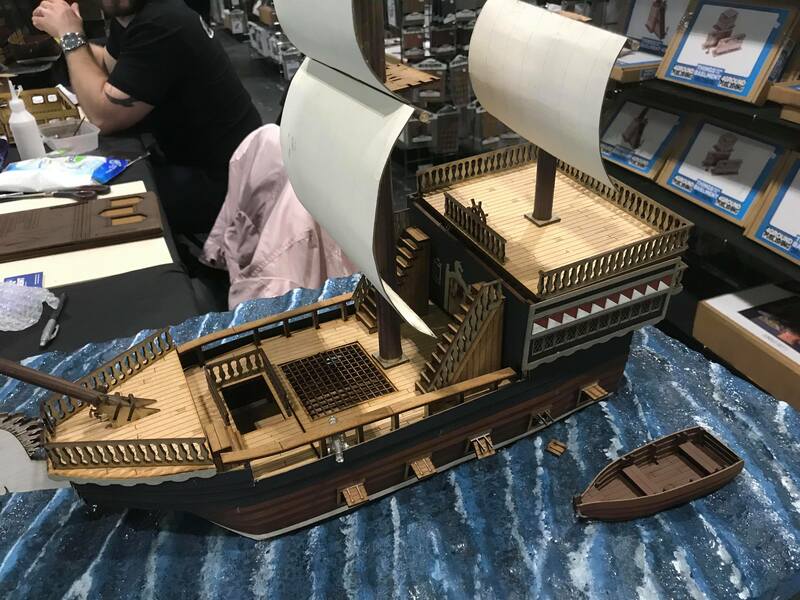 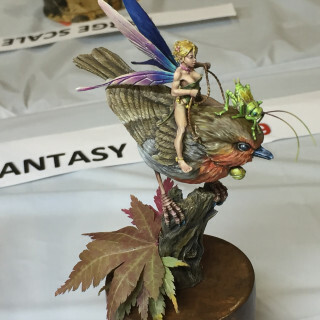 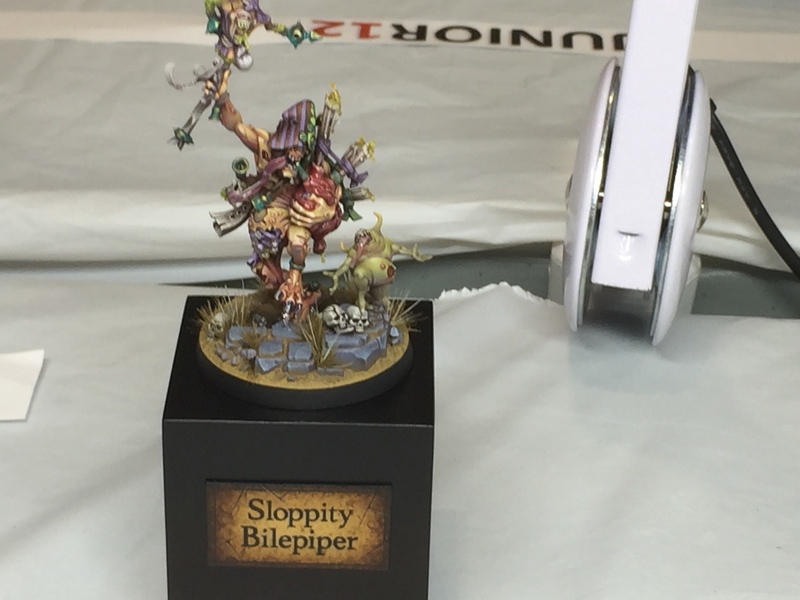 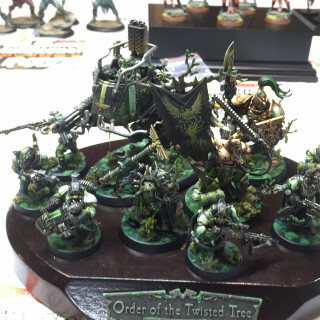 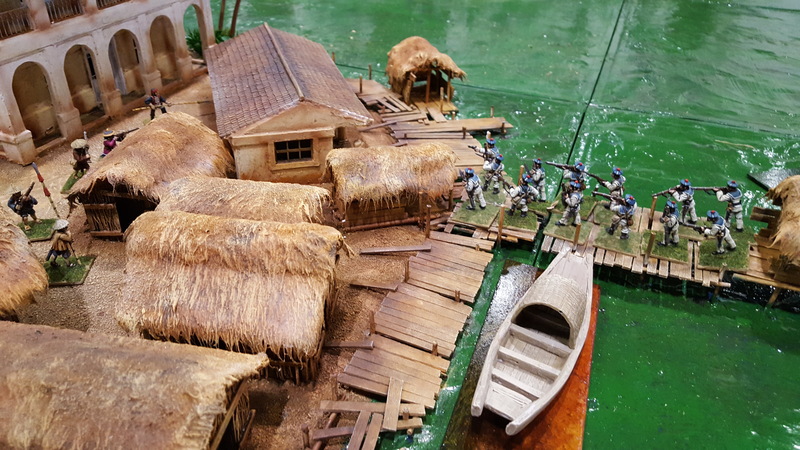 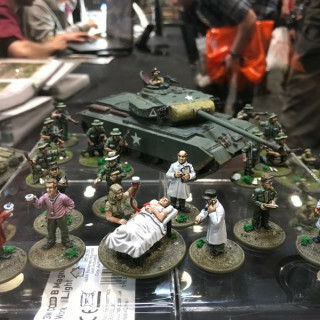 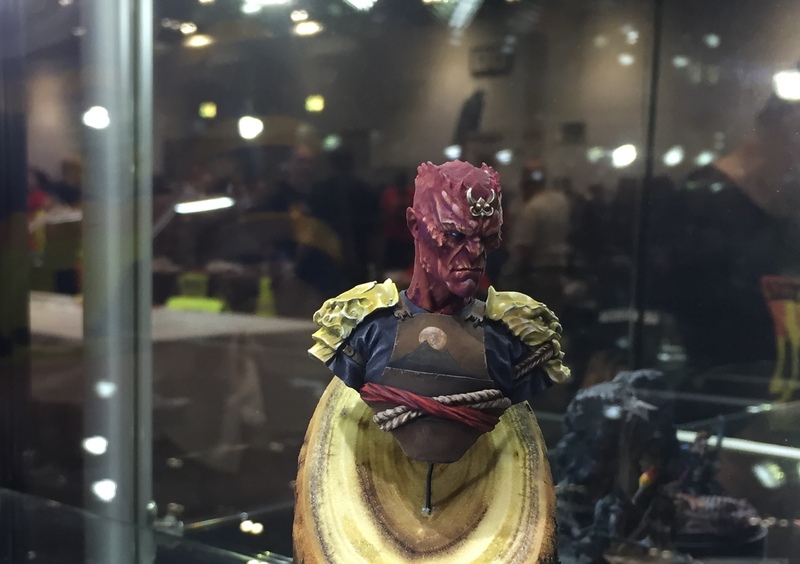 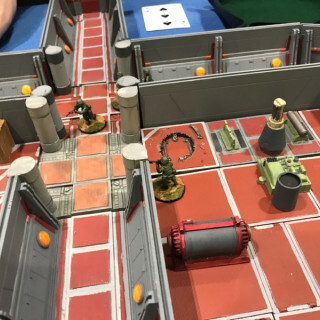 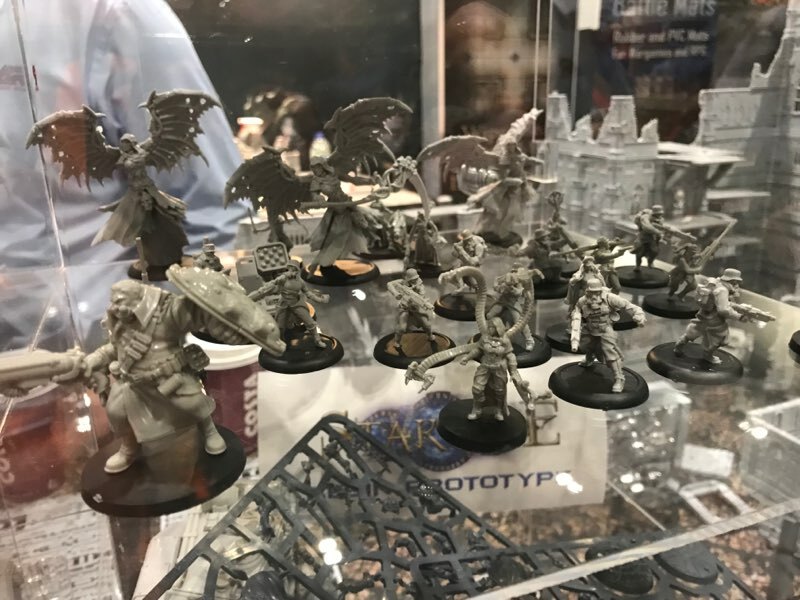 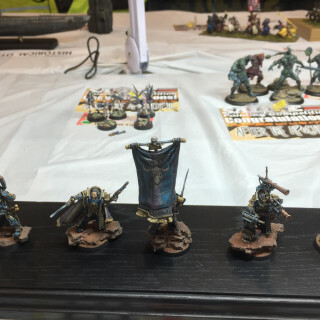 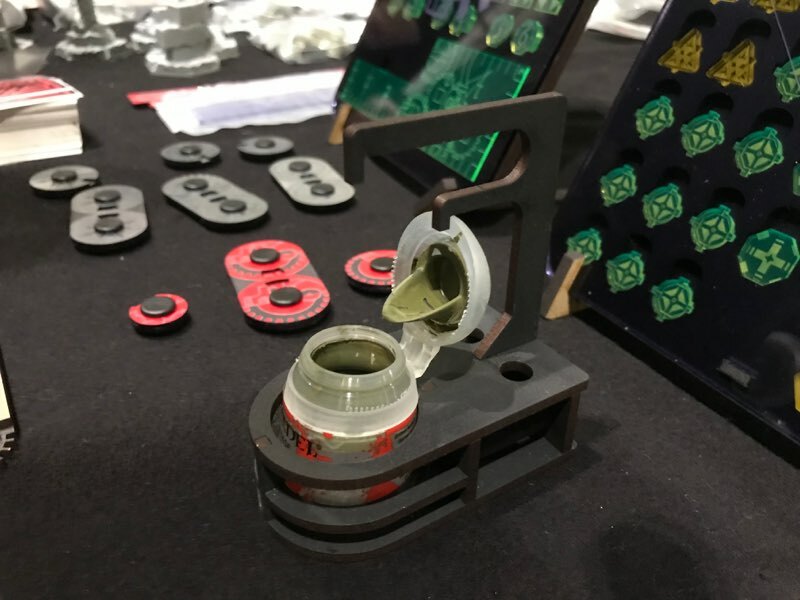 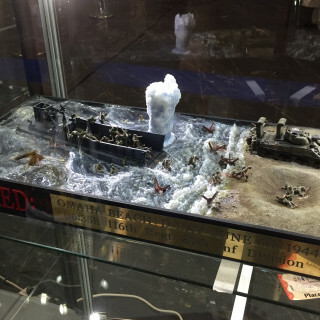 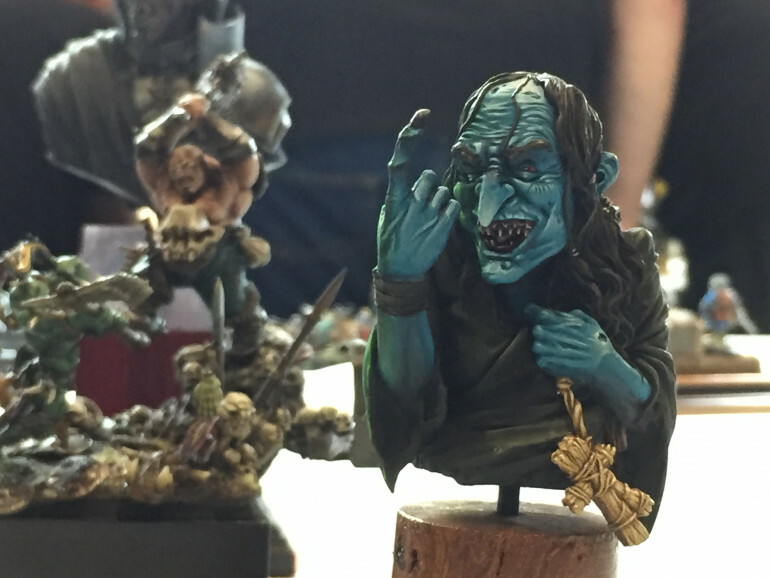 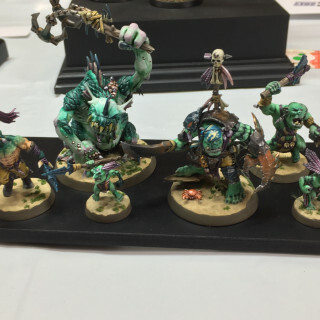 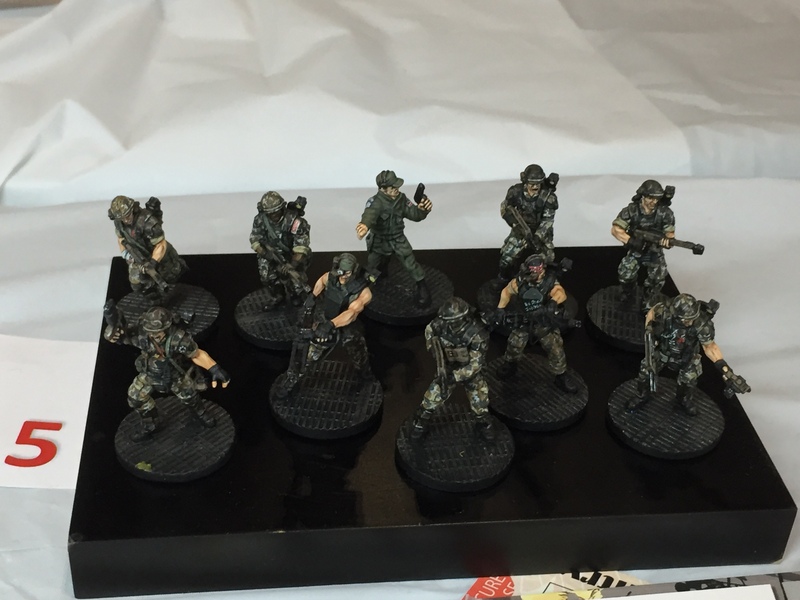 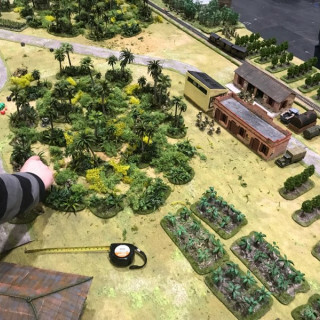 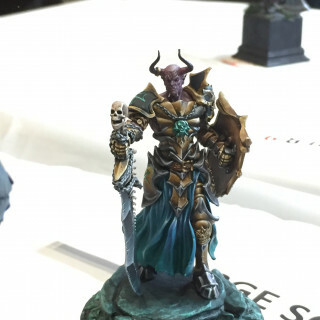 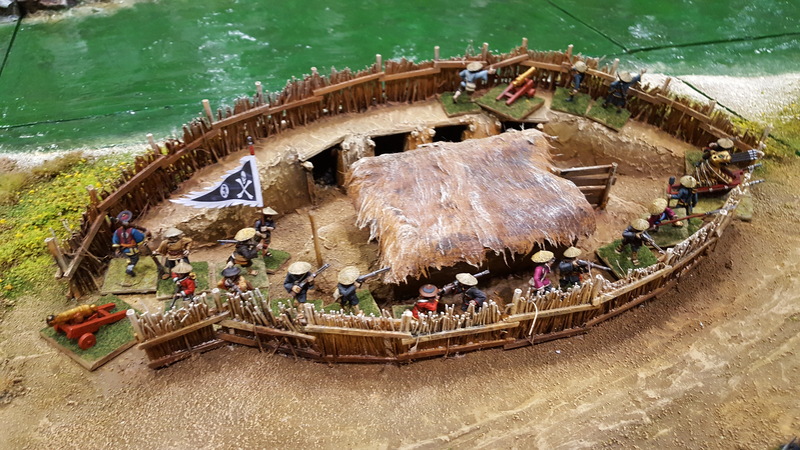 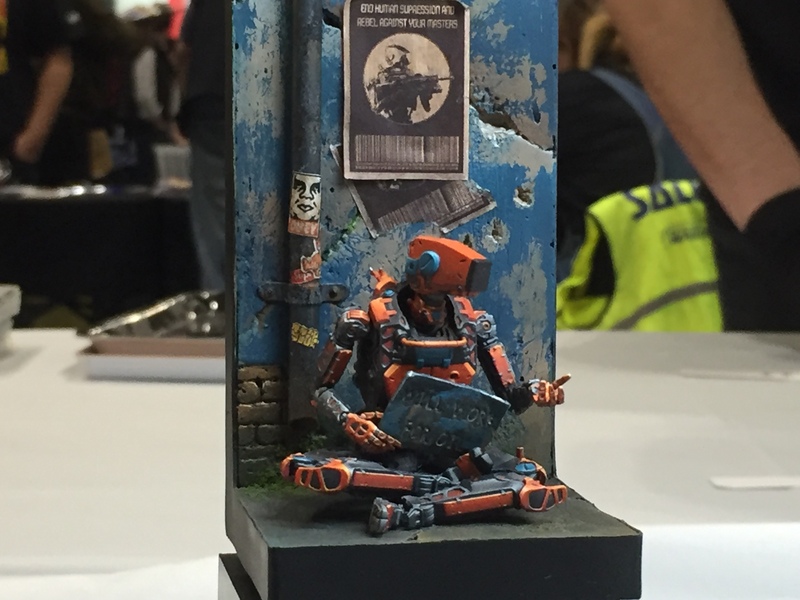 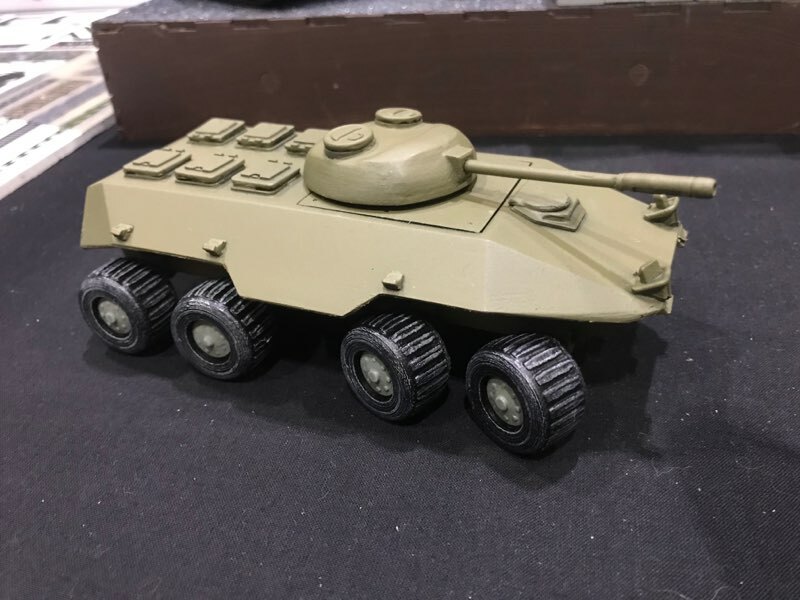 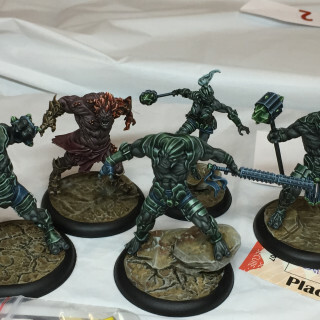 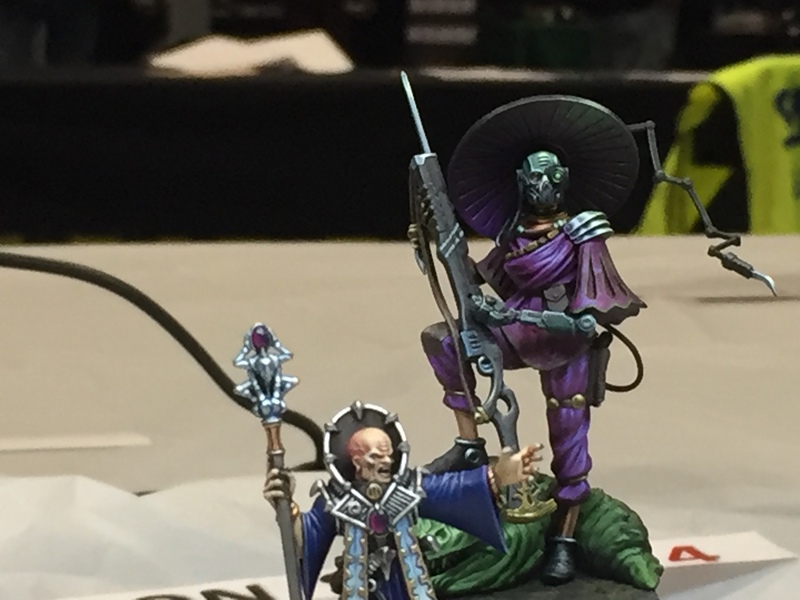 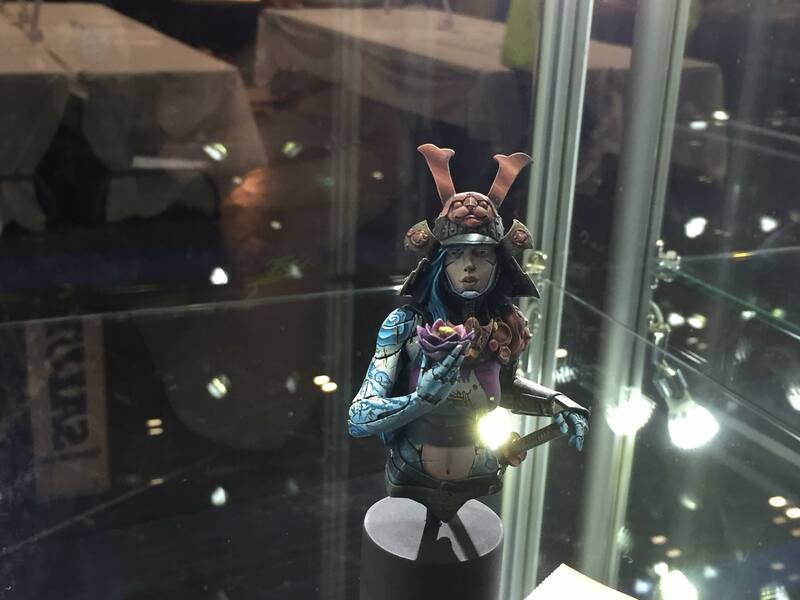 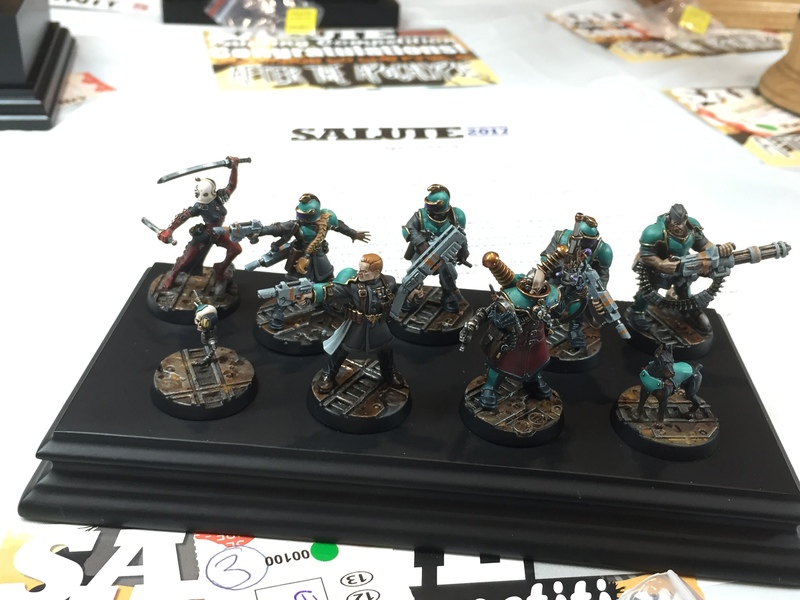 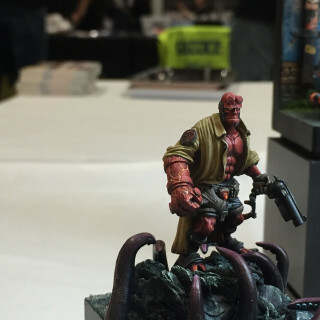 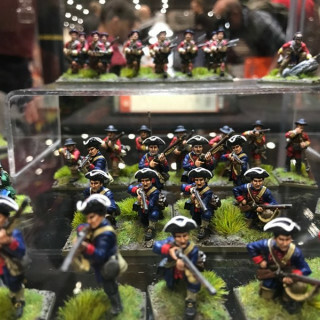 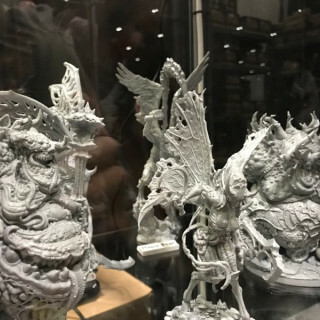 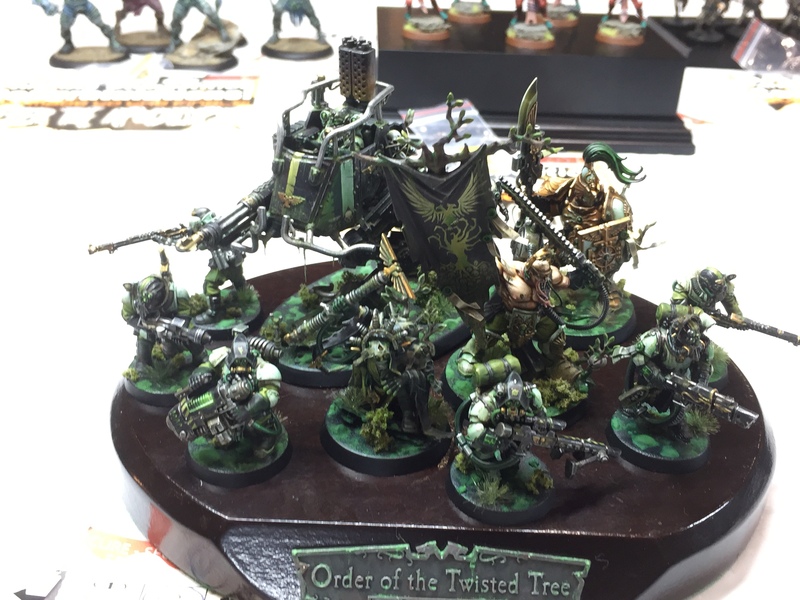 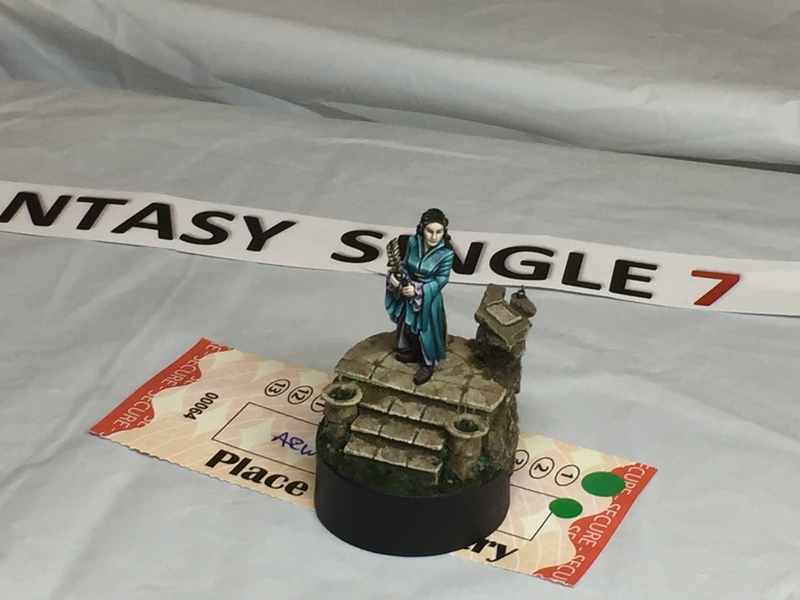 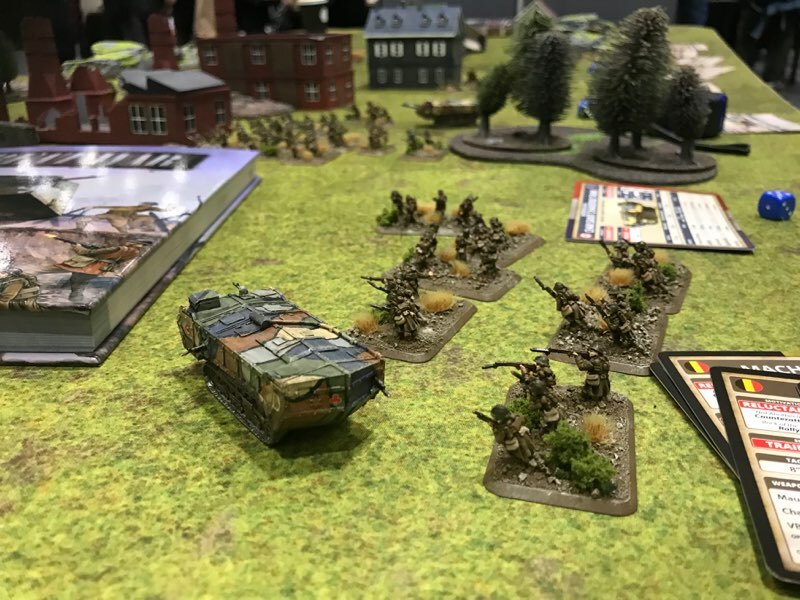 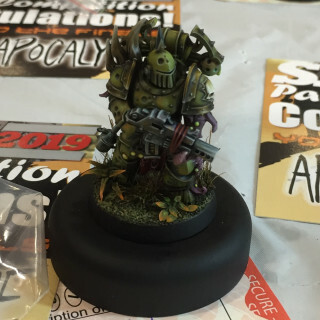 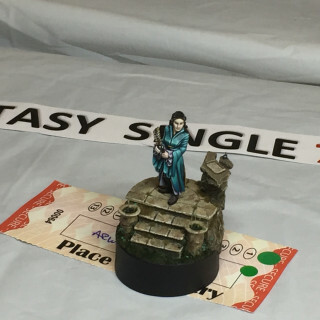 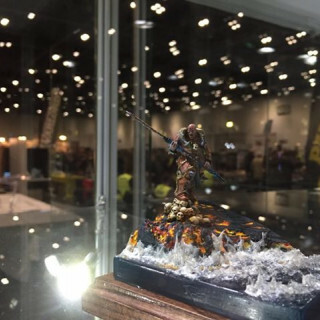 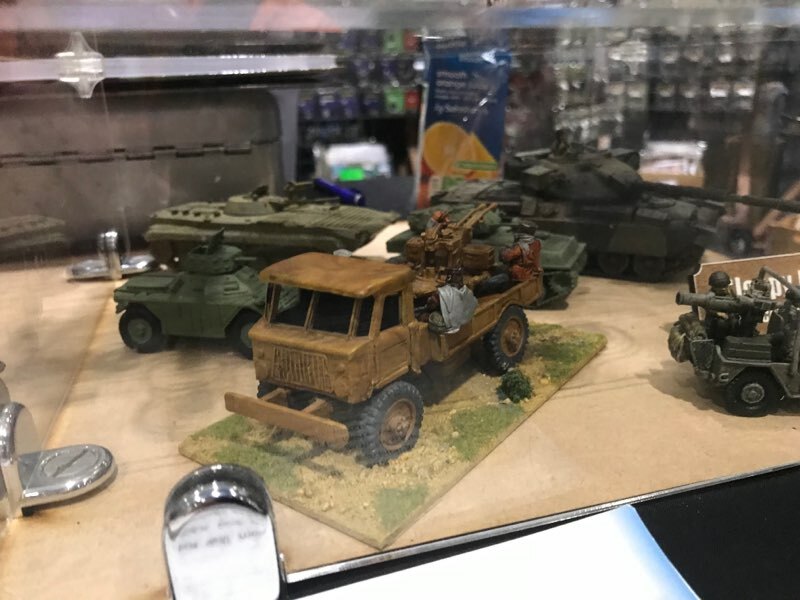 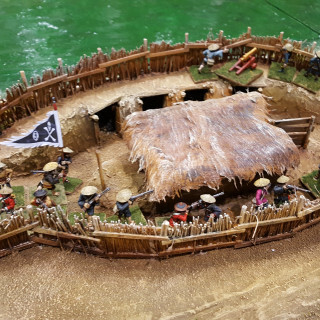 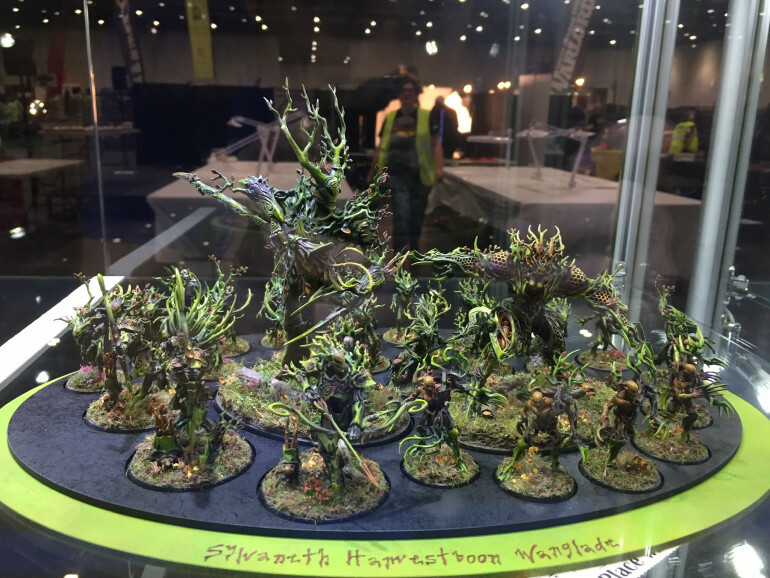 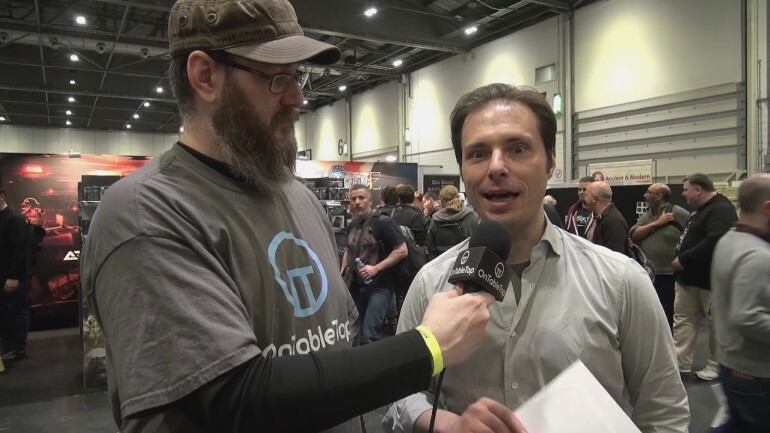 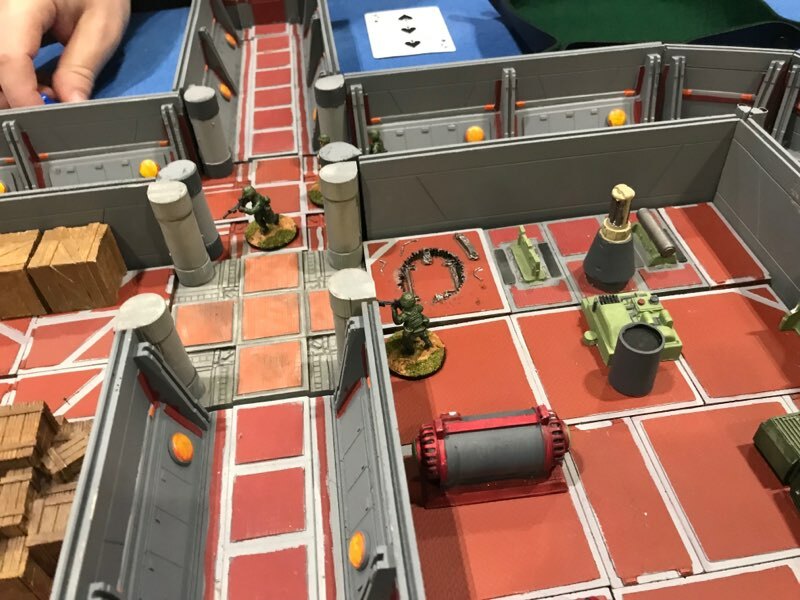 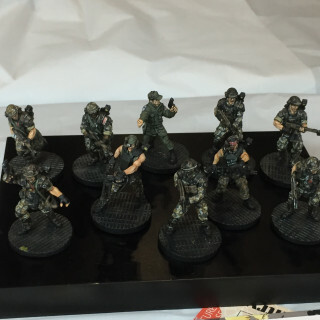 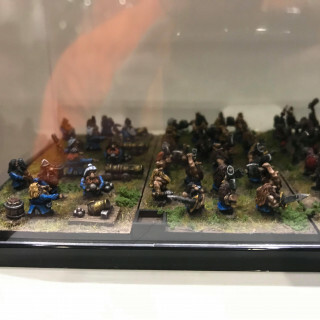 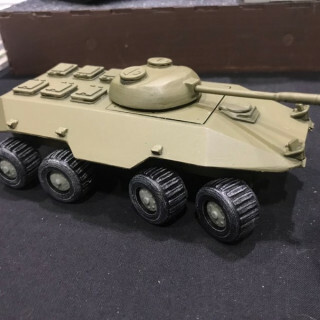 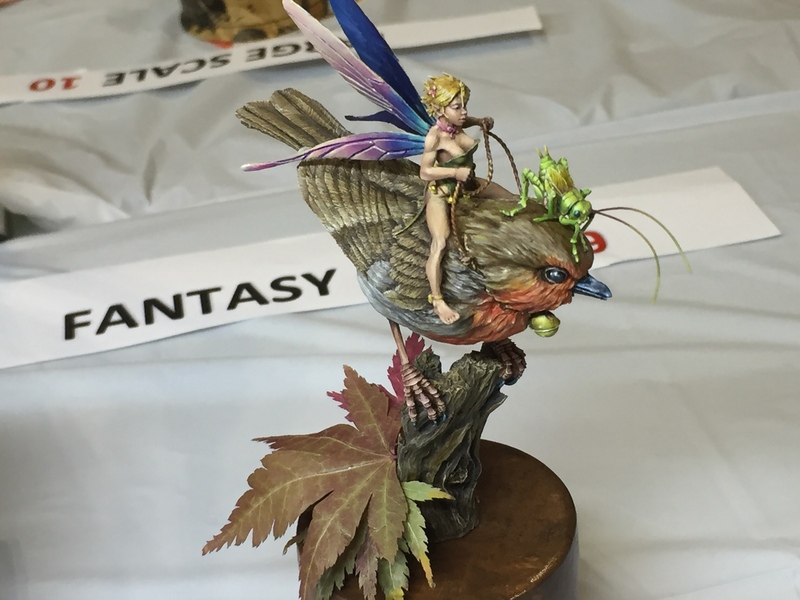 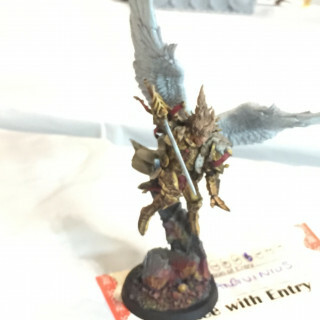 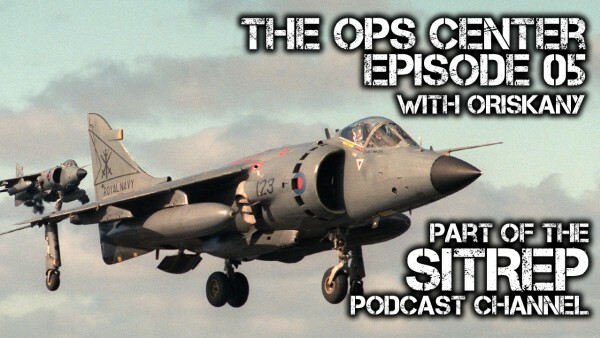 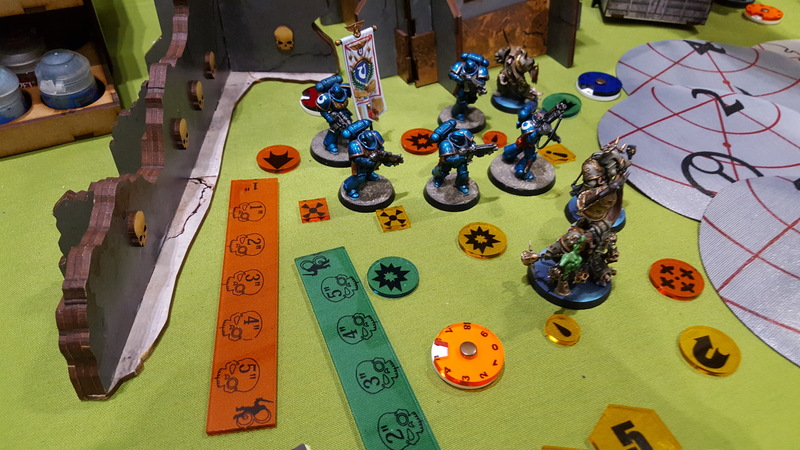 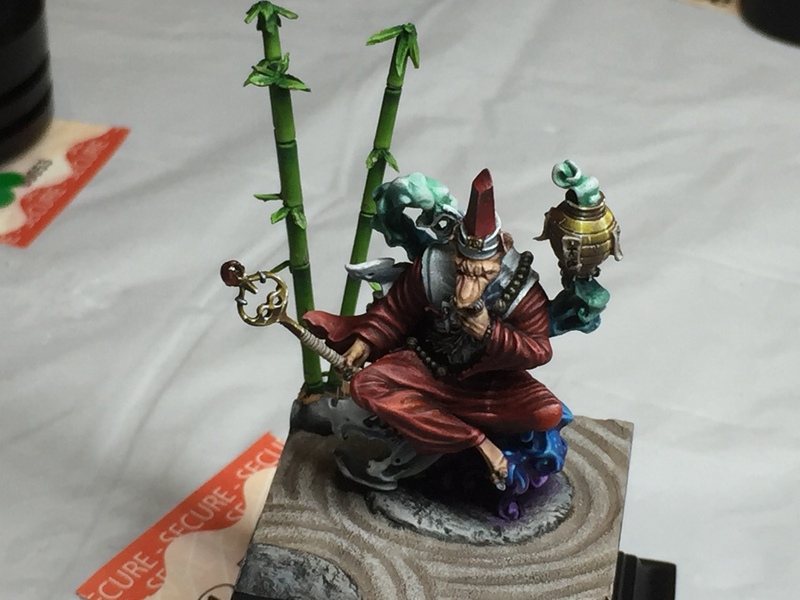 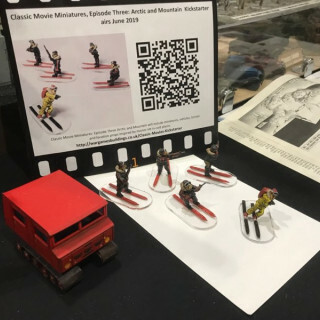 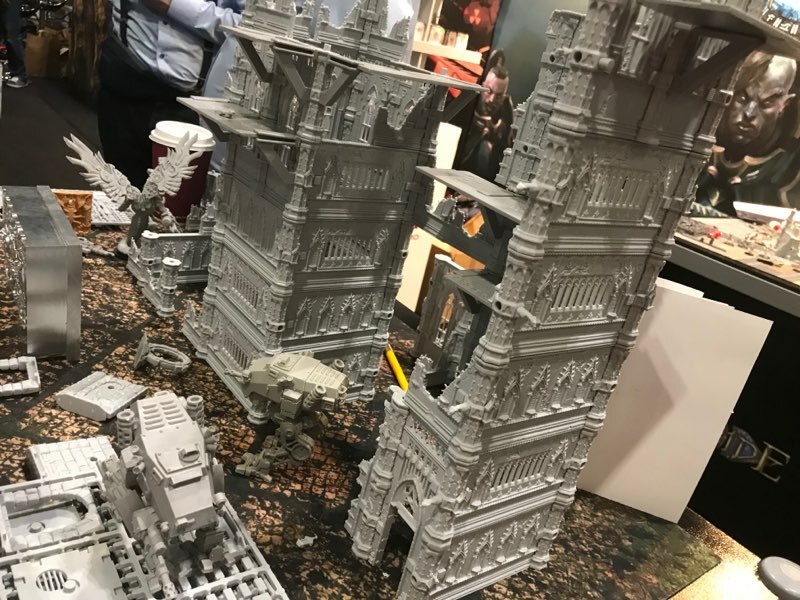 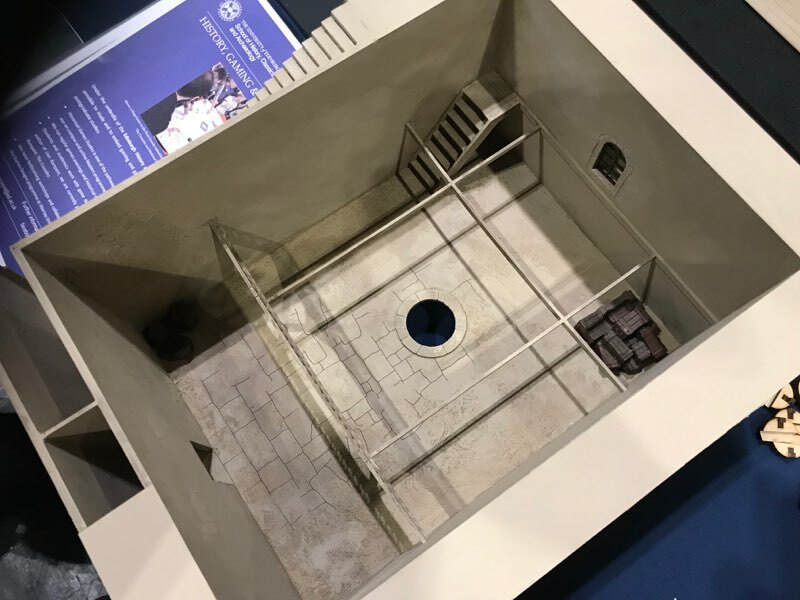 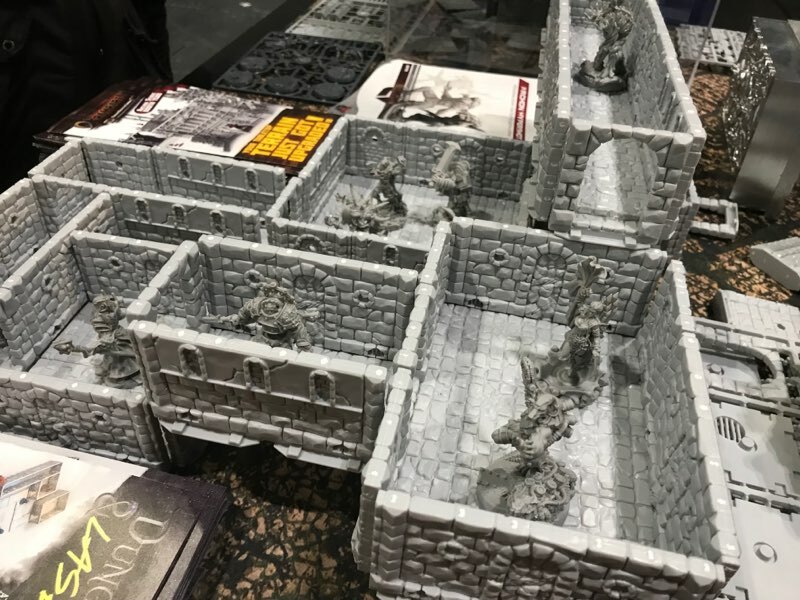 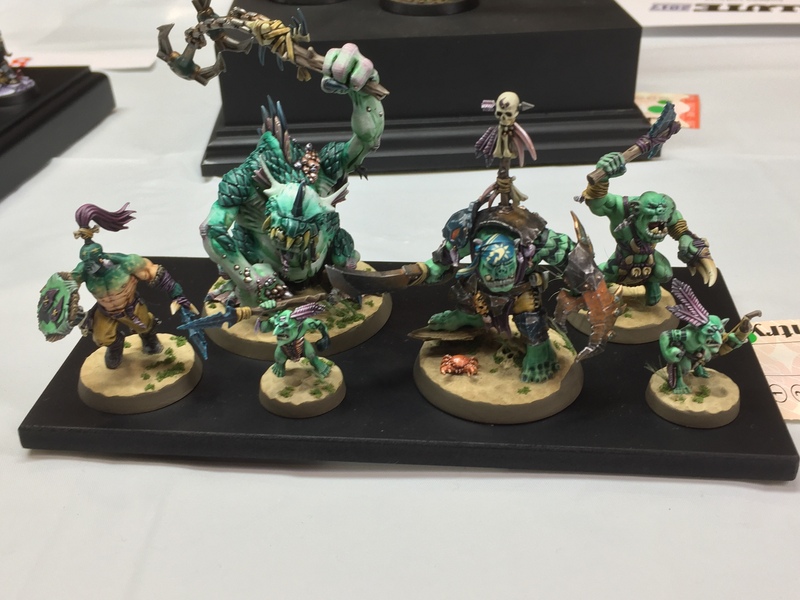 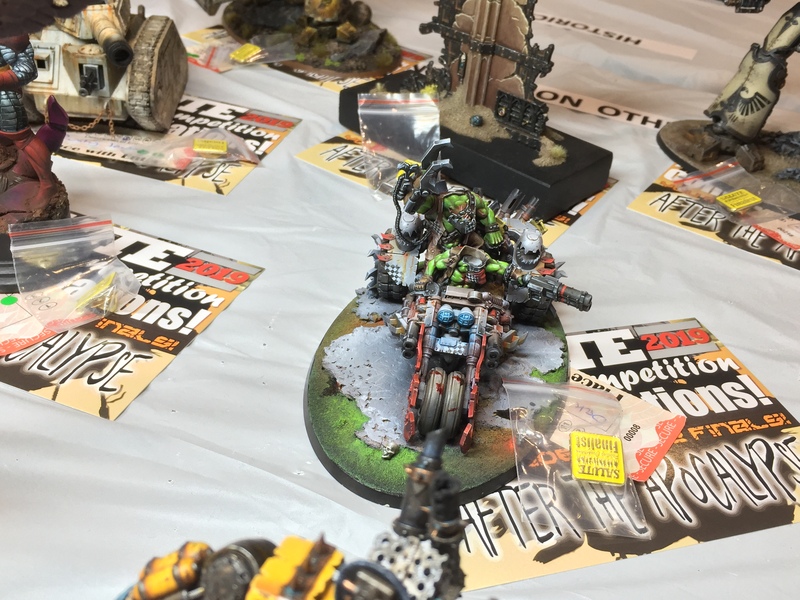 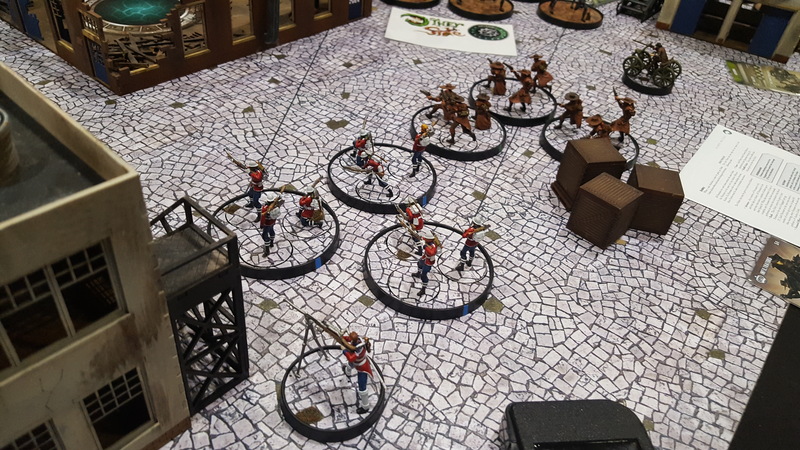 Gerry gets to check out what Archon Studio have brought to the mix this year at Salute 2019! 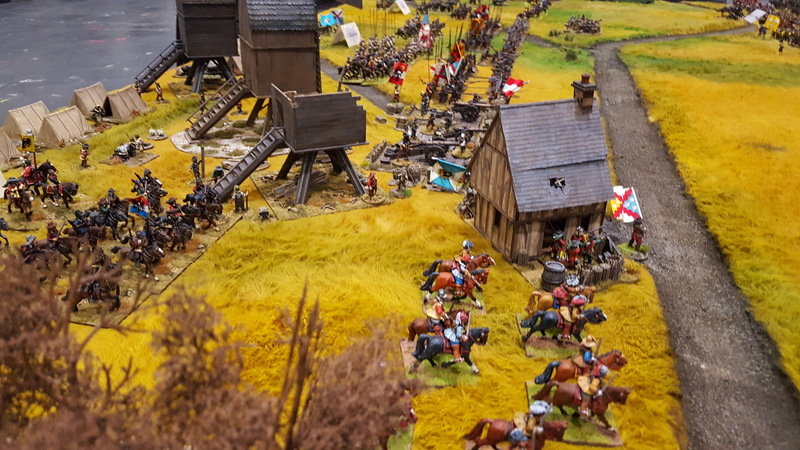 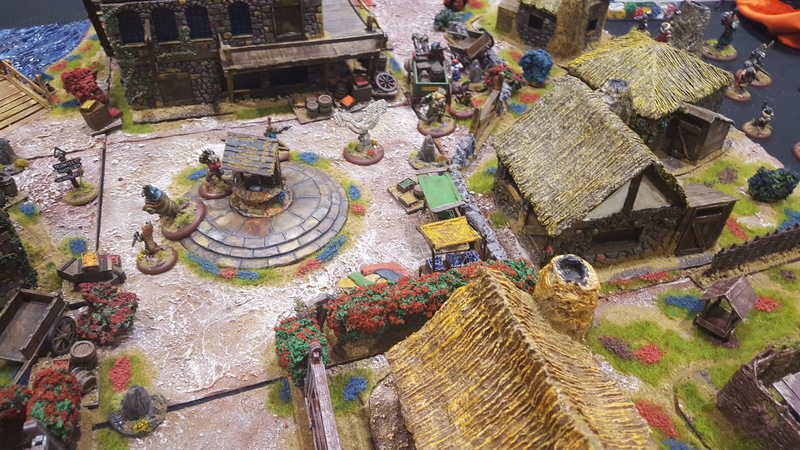 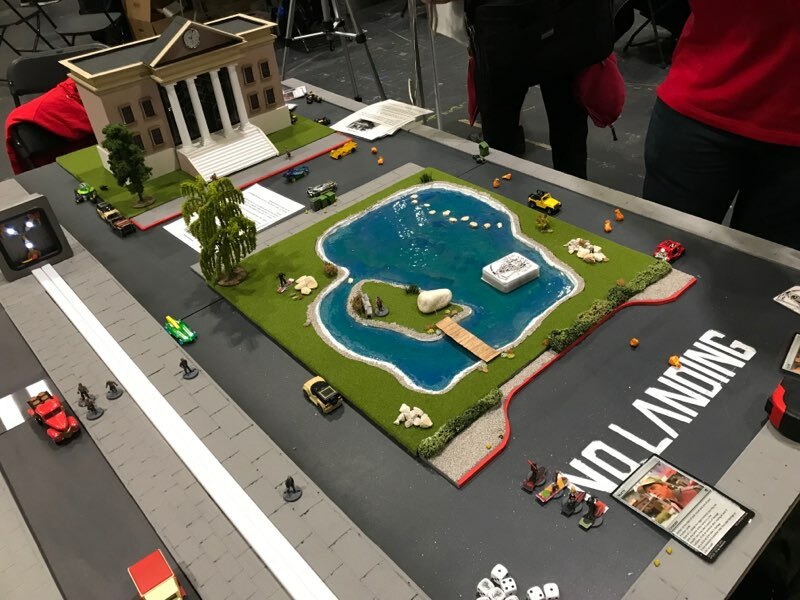 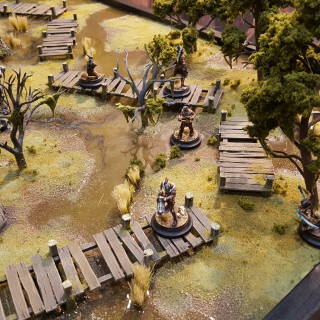 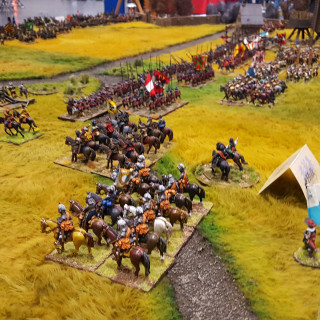 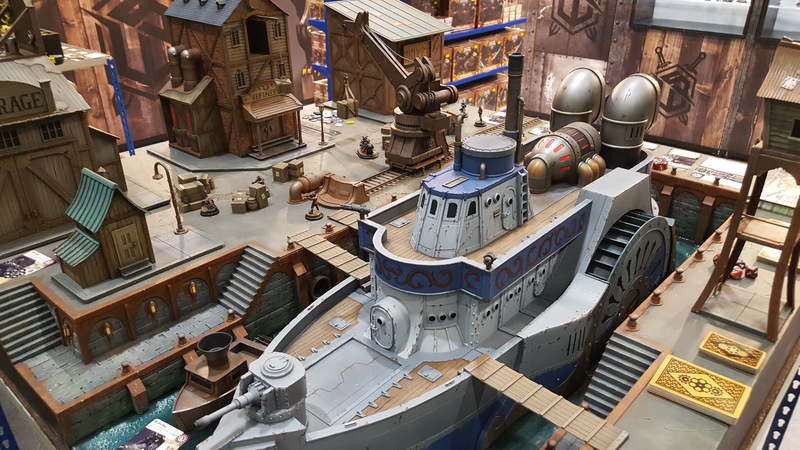 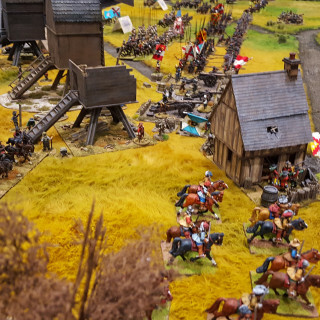 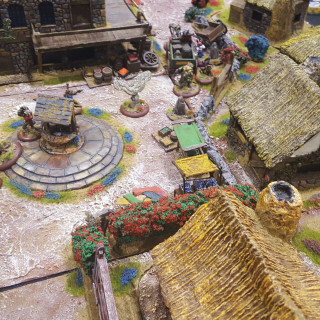 A combination of board games, miniatures and terrain adorn their beautiful space at Salute this year. 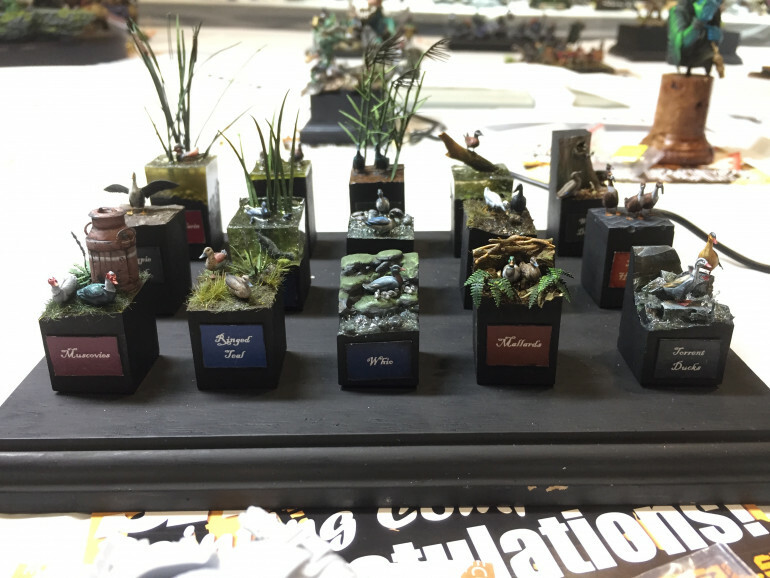 One of their stand out displays is their fantastic vertical terrain which is all push fit. 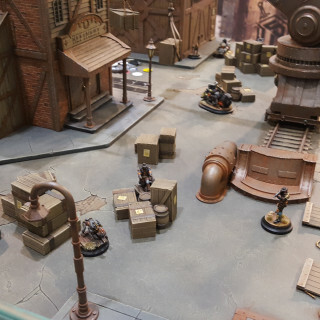 Not just content with that, Archon have been showing off their in development StarCide as well! 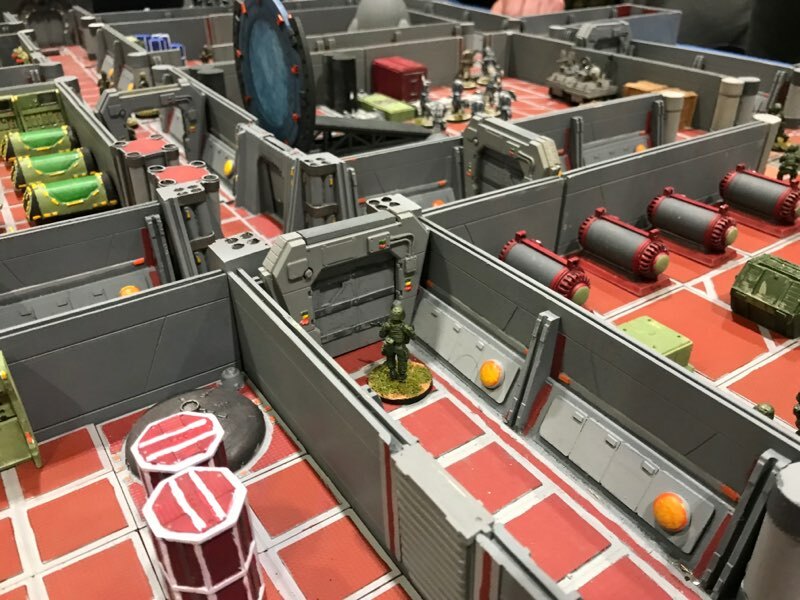 You could win – 2 StarCide preview Sprues! 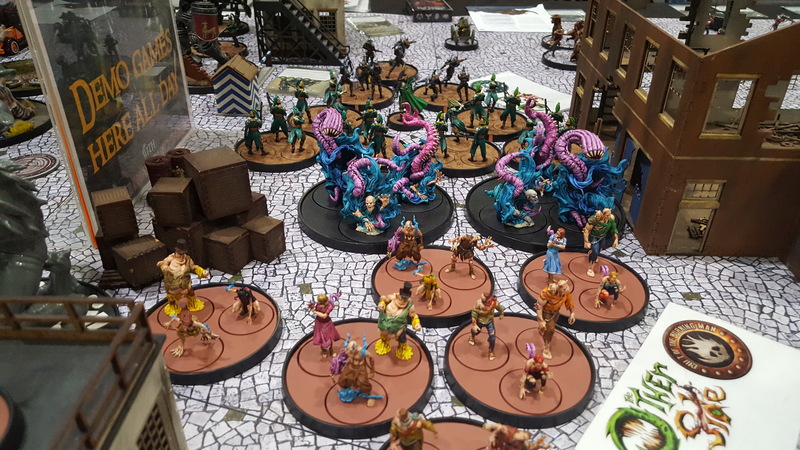 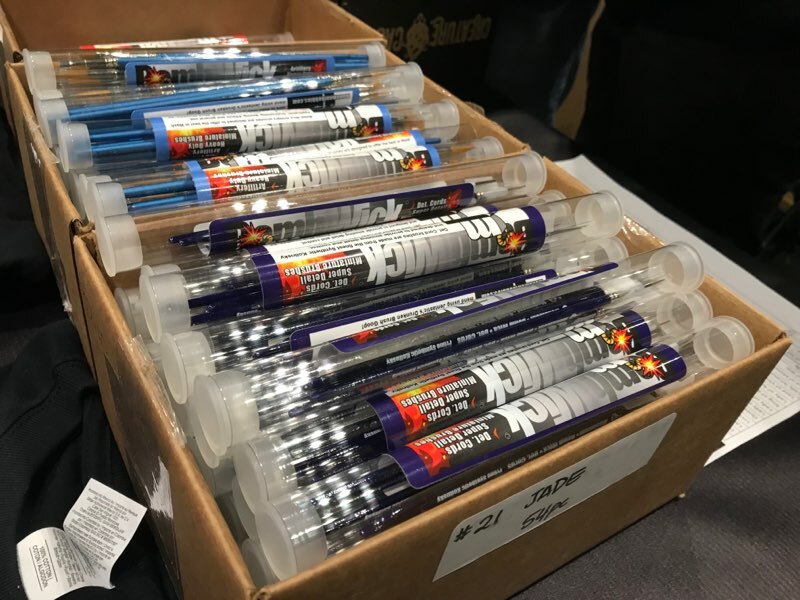 What do you think is the the most exciting thing on Archon’s booth this year? 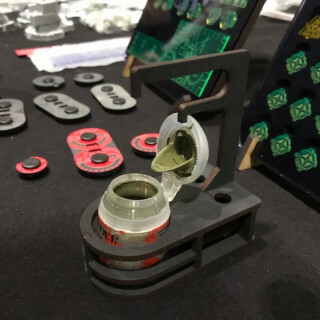 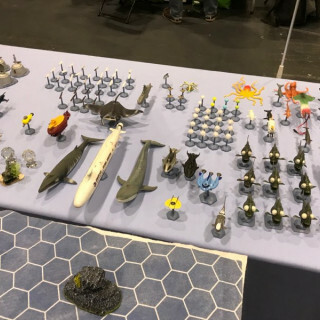 Justin broken into PSC Games’ booth at Salute to see what goodies they have! 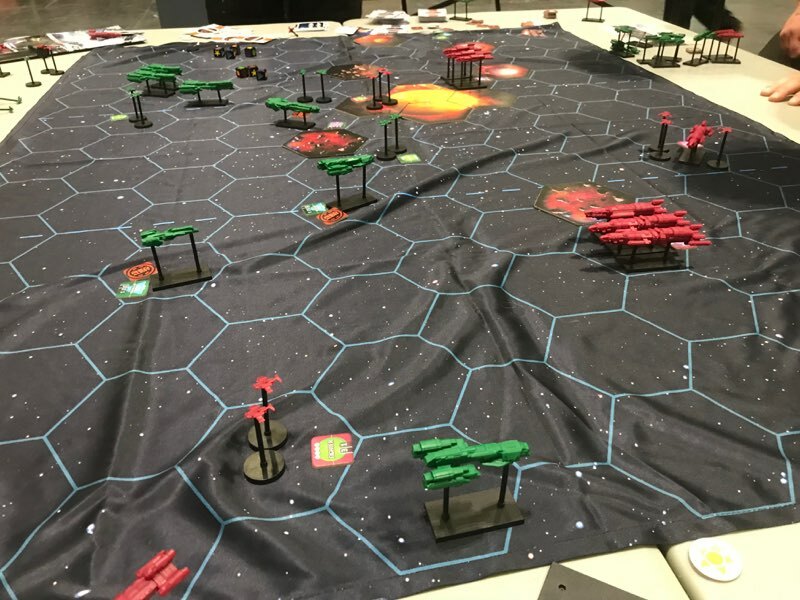 Continuing on from their stellar baord game work of recent years, PSC have brought two new board games to the show: Red Alert and Battle Ravens. 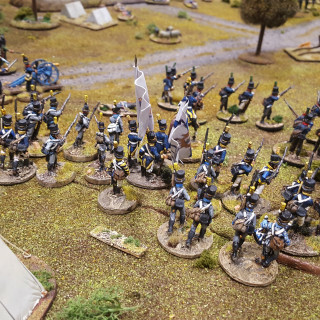 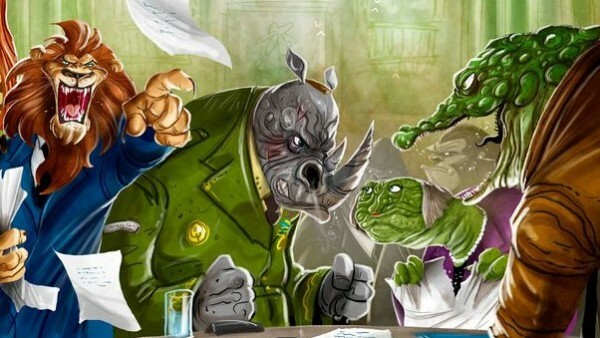 Everyone in the office has been enjoying the recent PSC games from Lincoln to Blitzkrieg. 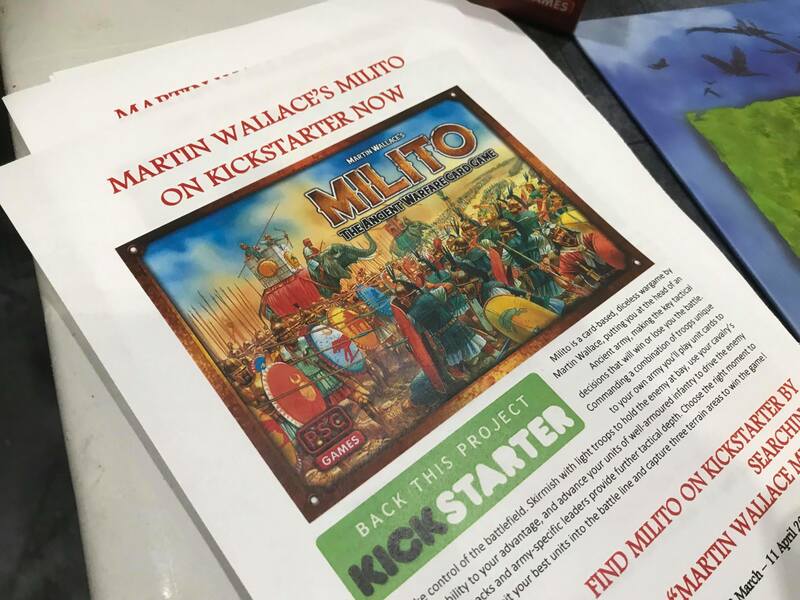 Speaking of the latter, we’re given a little insight into what lies in the future for that wonderful game from Paolo Mori. 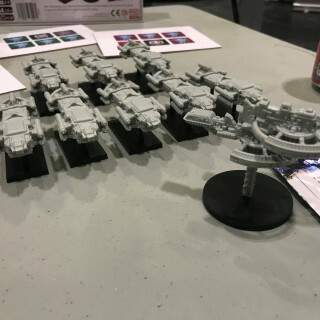 Are you excited for Battle Ravens or is the more miniature focused Red Alert more on your radar? 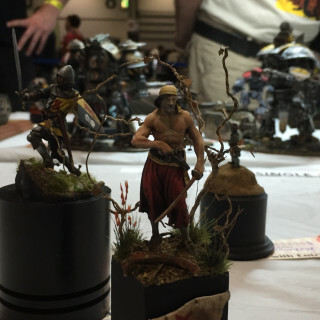 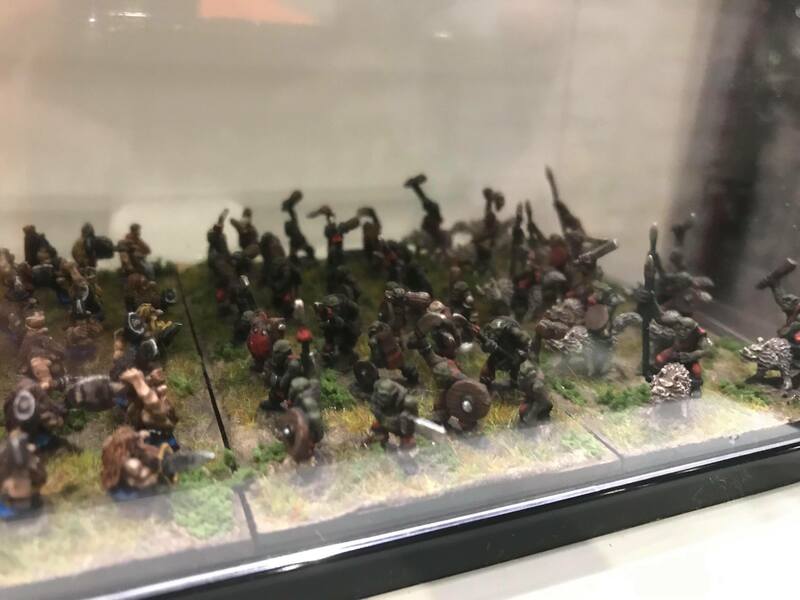 Pendraken Miniatures & Their Tiny Fighting Men + Win A Prize! 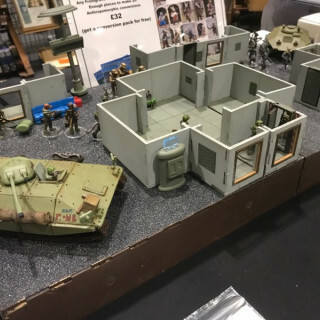 Gerry joins Leon from Pendraken at their 10mm laden booth at Salute. 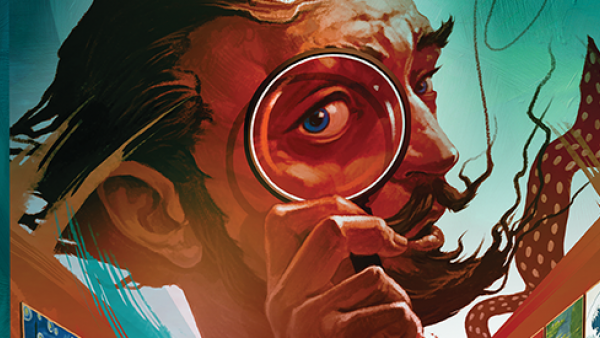 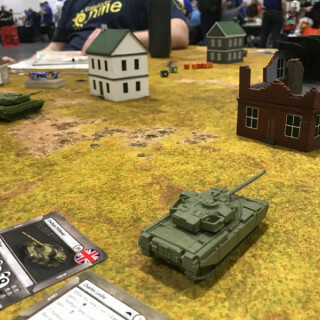 Leon drops some bombs straight out the gate with the 4th edition of Blitzkrieg Commander. 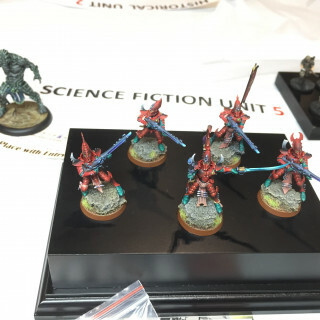 This comes along with some excellent customer service from Pendraken who have gone above and beyond. 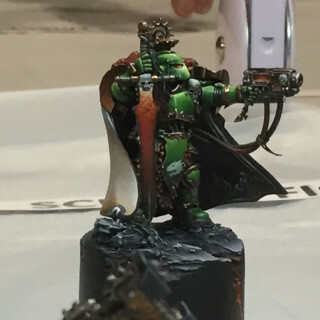 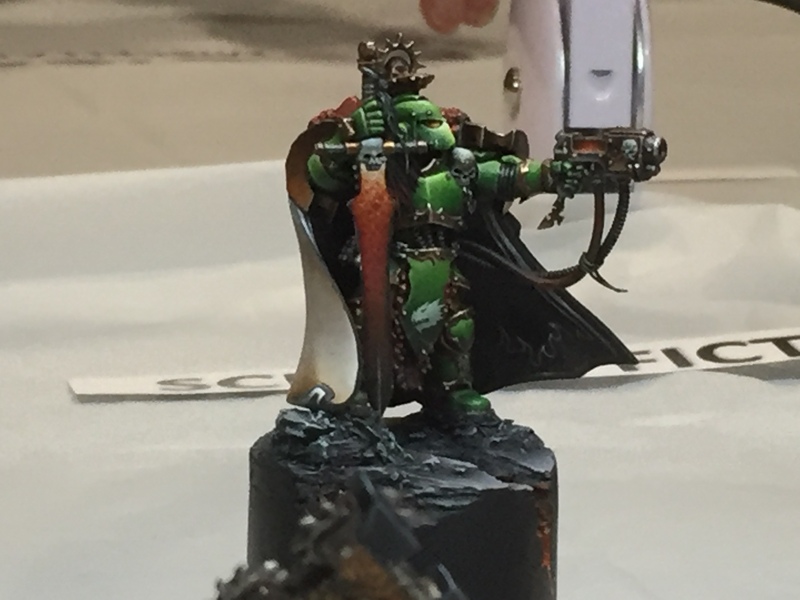 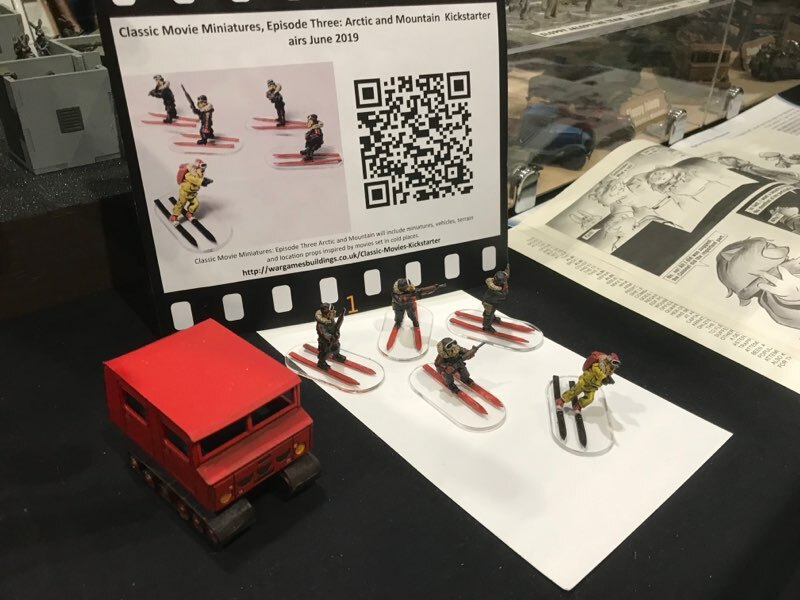 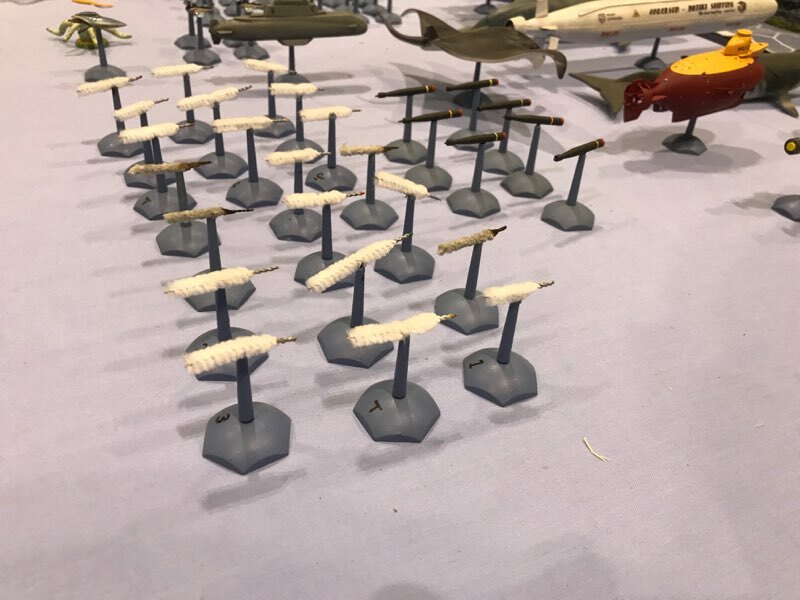 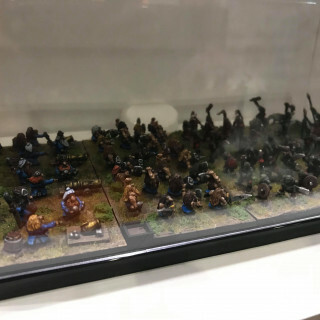 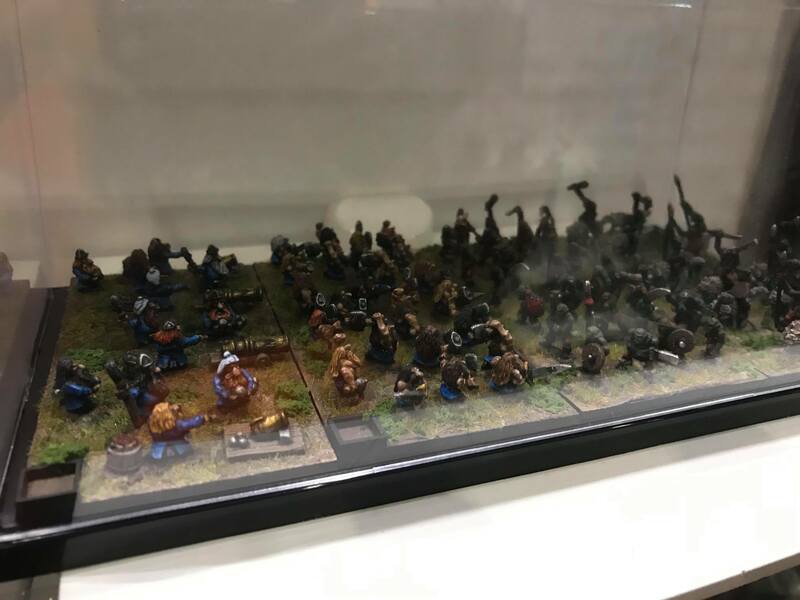 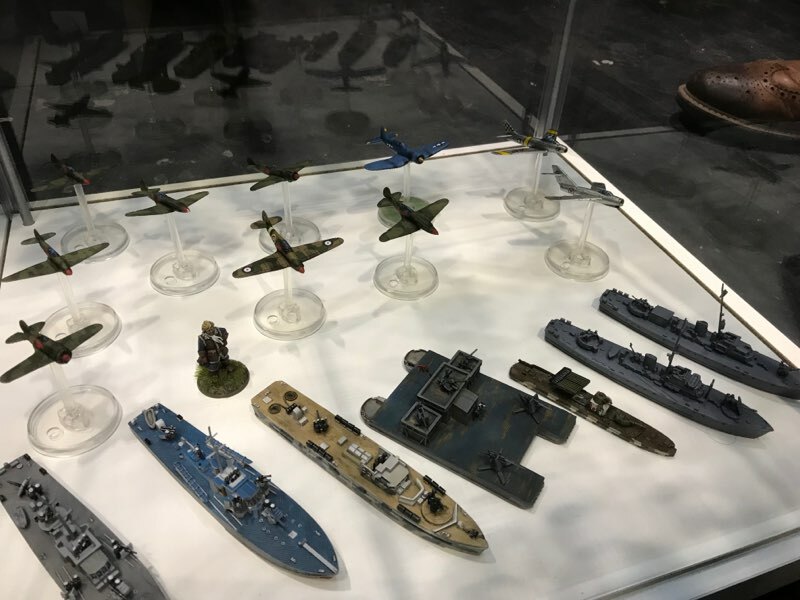 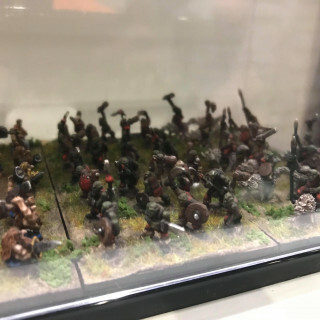 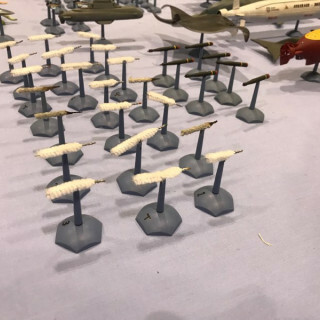 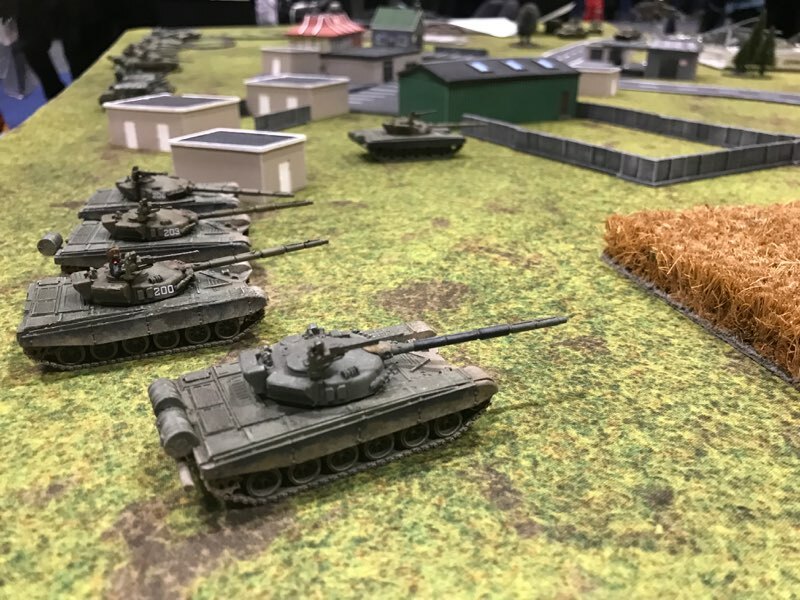 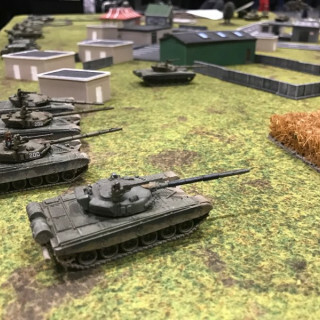 In addition to new Blitzkrieg Commander, Pendraken bring forth their impressive array of 10mm miniatures to the show floor. 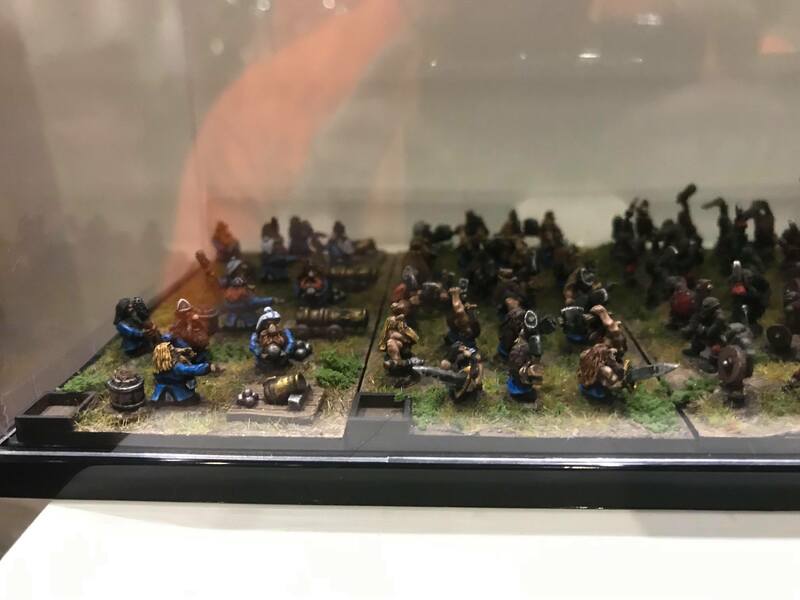 What are some of your favourite miniatures from Pendraken? 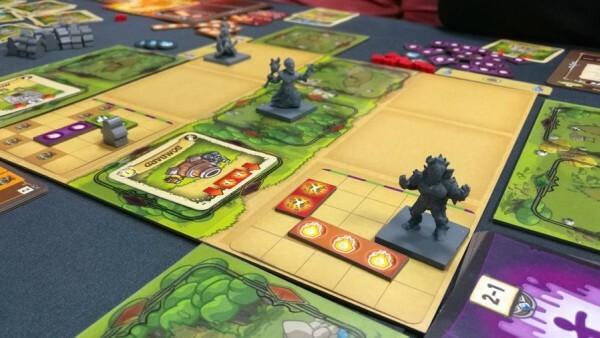 4Ground Take Us On A Terrain-filled Journey + Win A Prize! 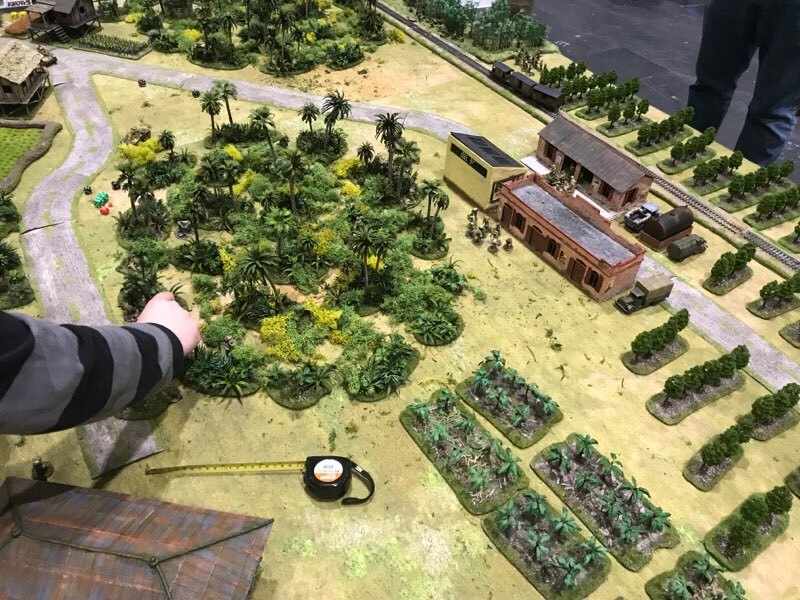 Justin gets the distinct pleasure of visiting the wonderful Cad from 4Ground to look at all the lovely terrain they have brought to Salute. 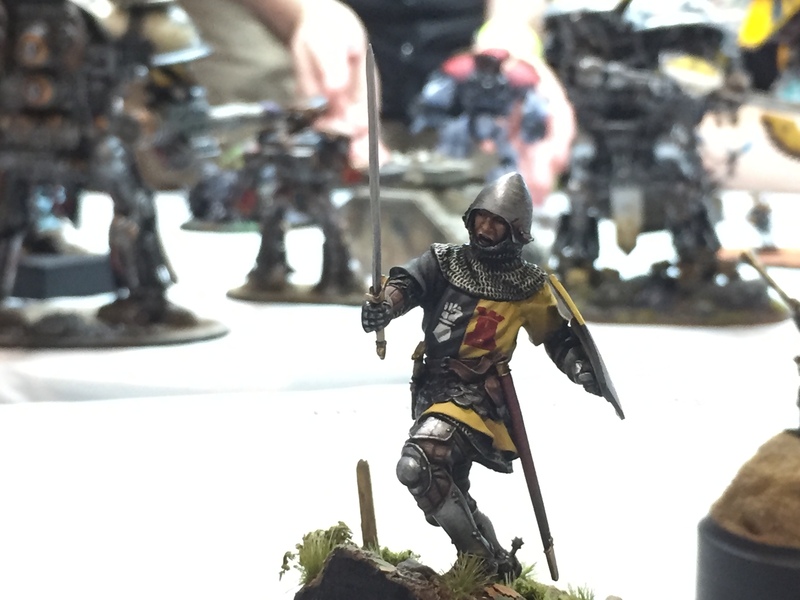 Starting off swinging a sword, Justin manages to controlling his inner child enough to check out what’s on offer with 4Ground. 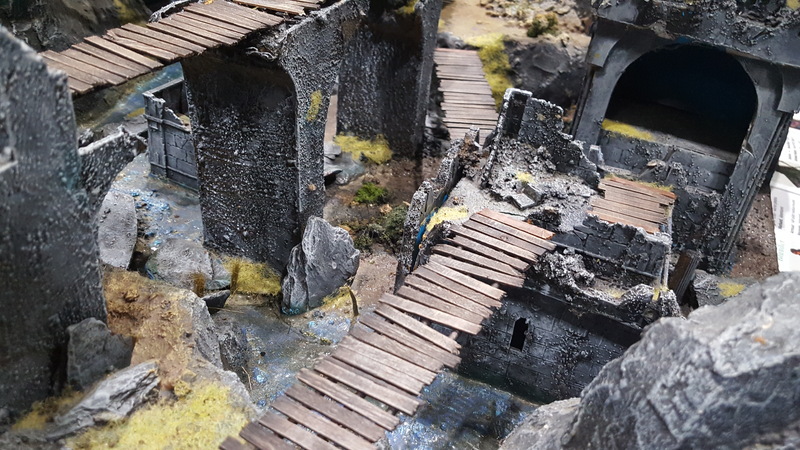 From ruined churches and stained glass windows to some perfect terrain for the walking dead 4Ground have so many angles covered! 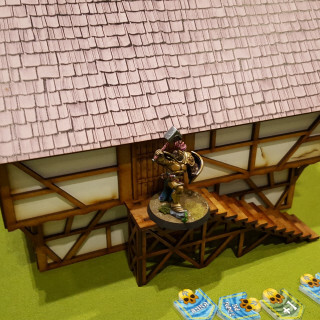 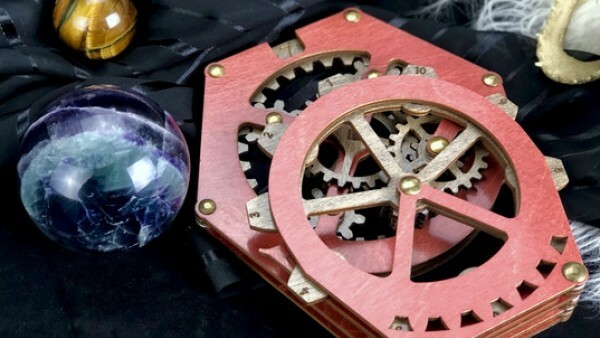 You could win – Urbes Mortis Terrain Box & Sword! 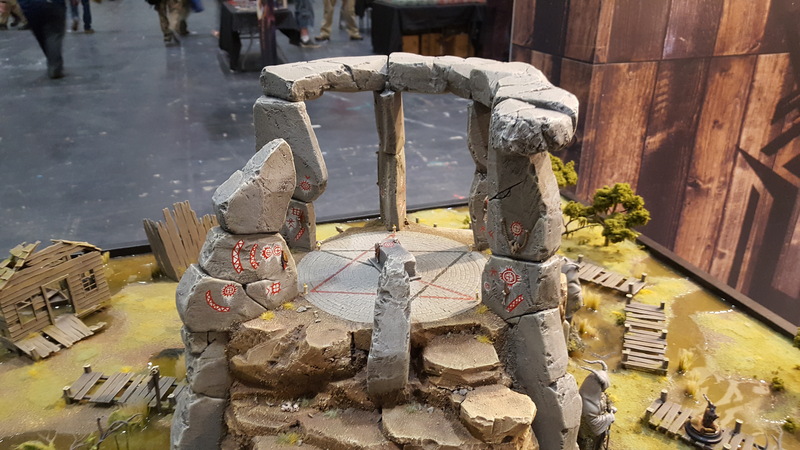 What kind of terrain features are you excited to see from 4Ground? 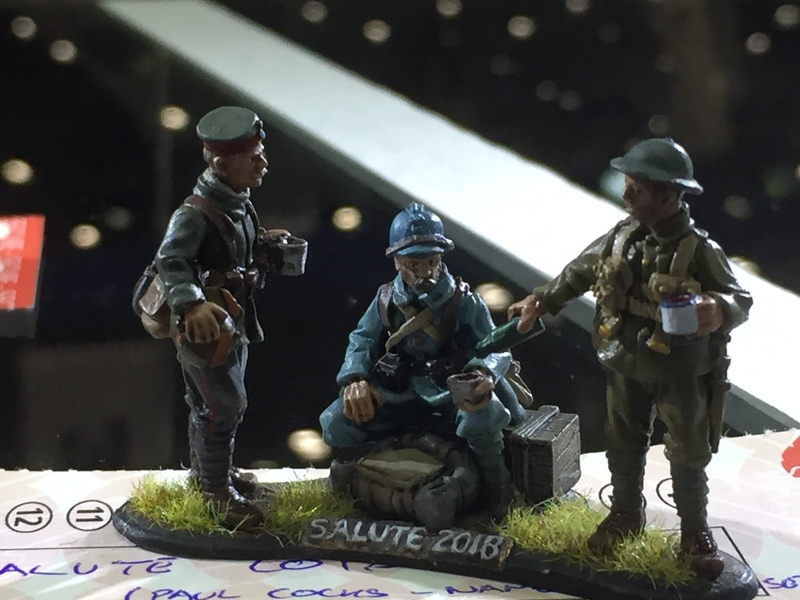 That's A Wrap On Salute 2019! 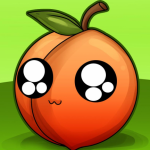 It hath been accomplished! 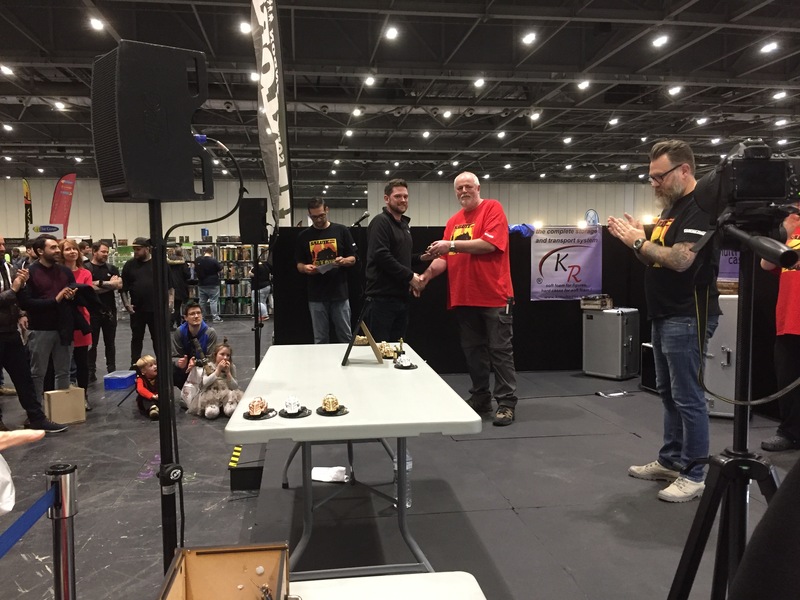 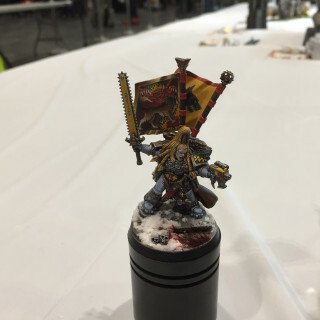 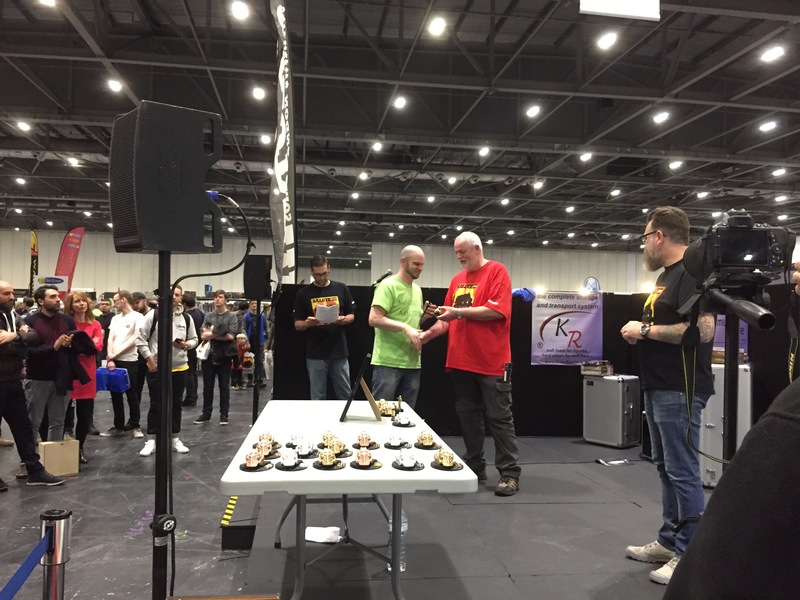 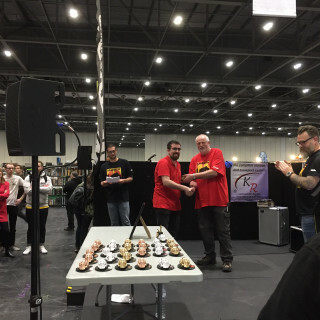 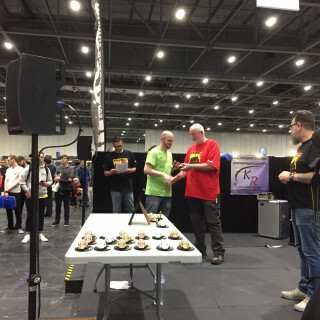 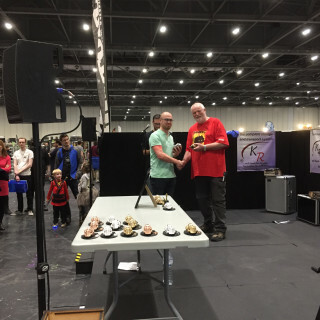 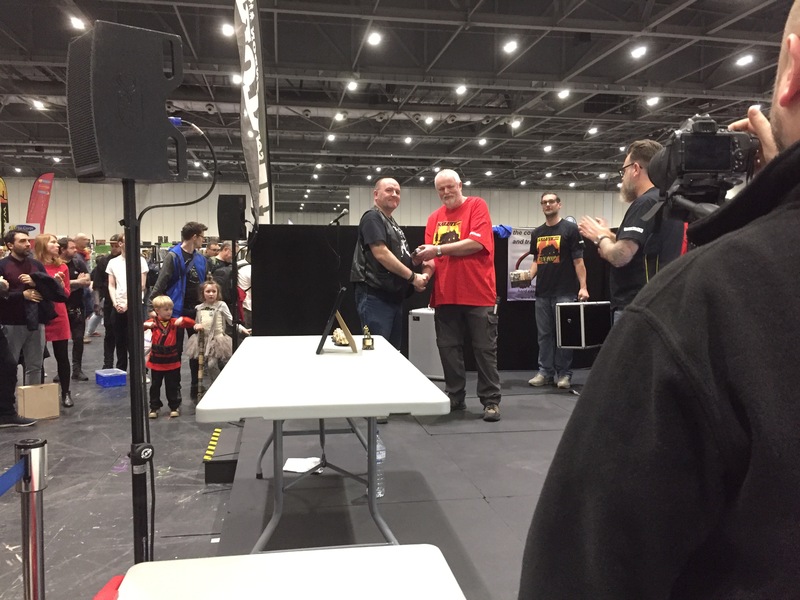 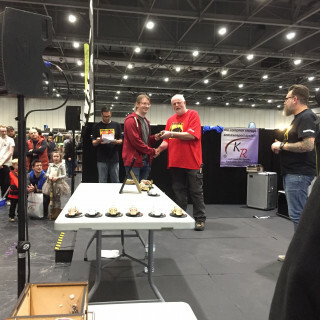 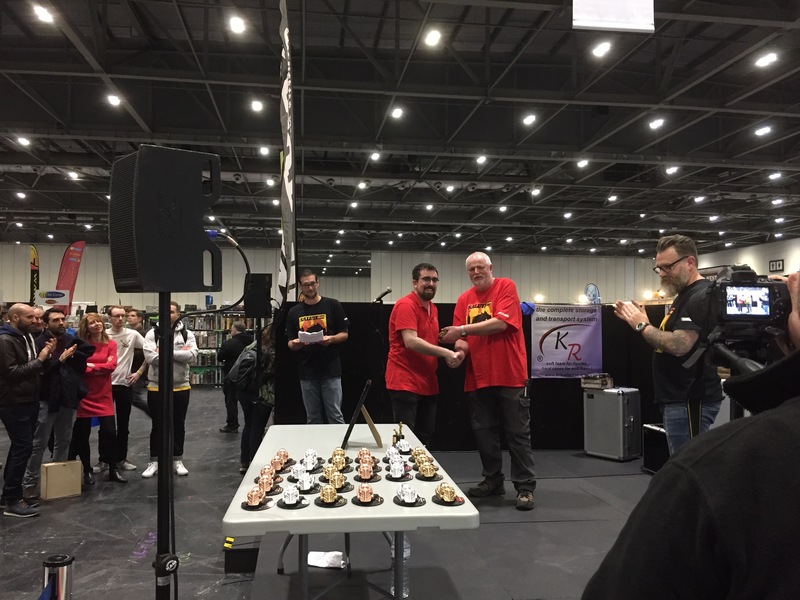 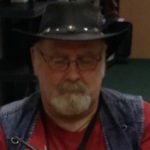 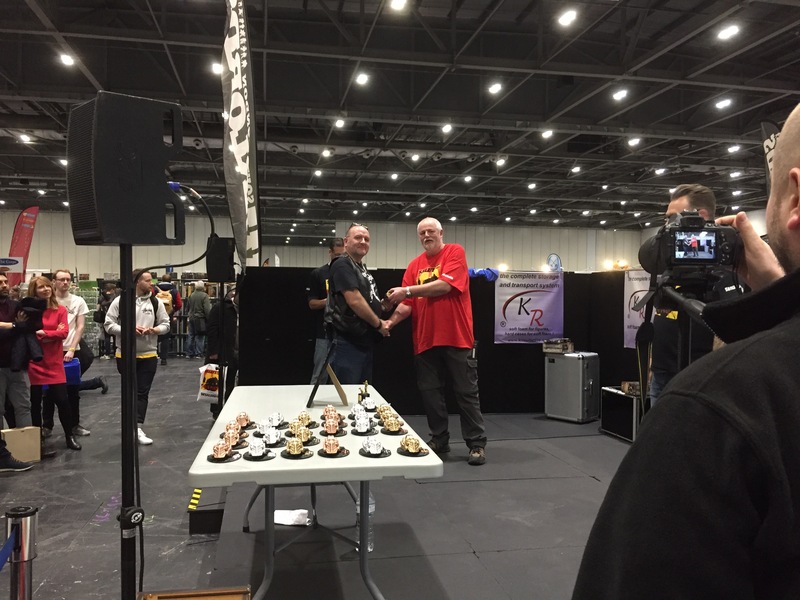 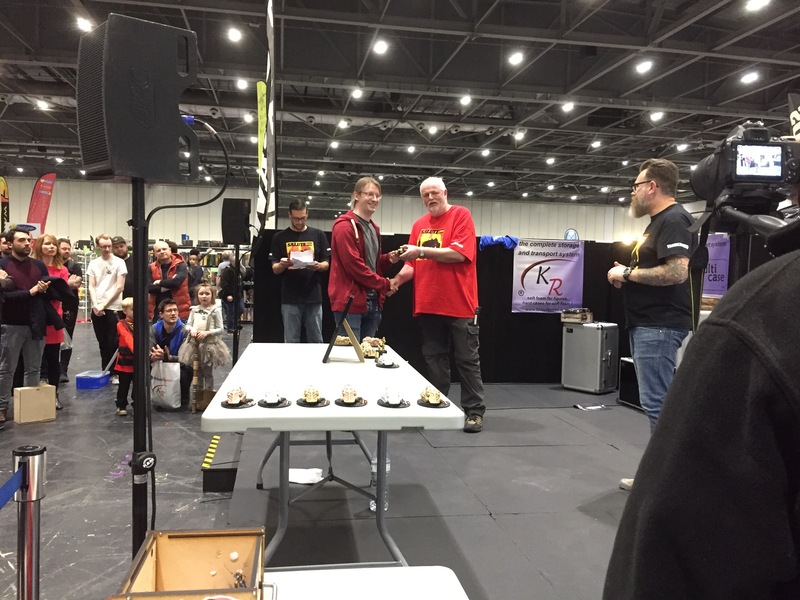 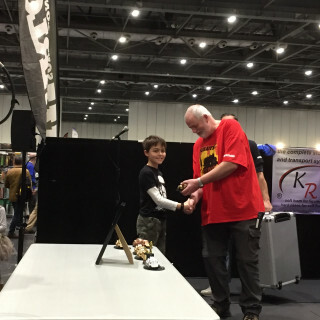 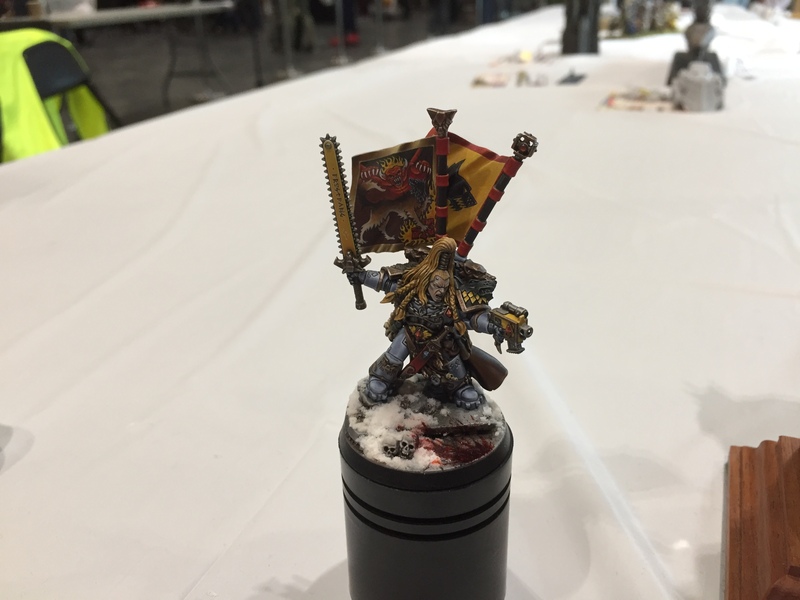 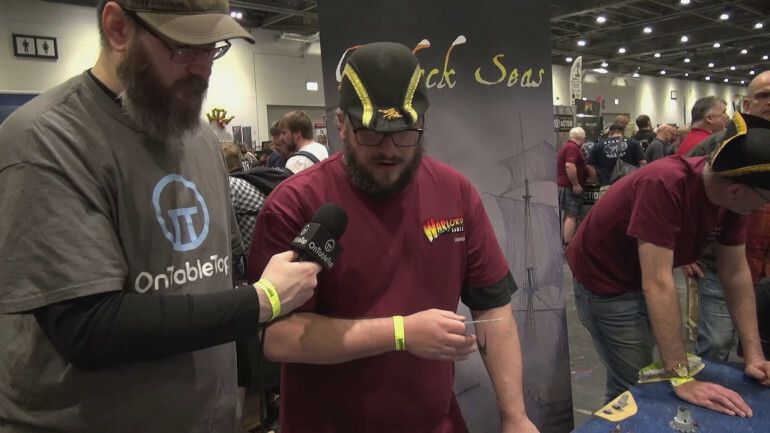 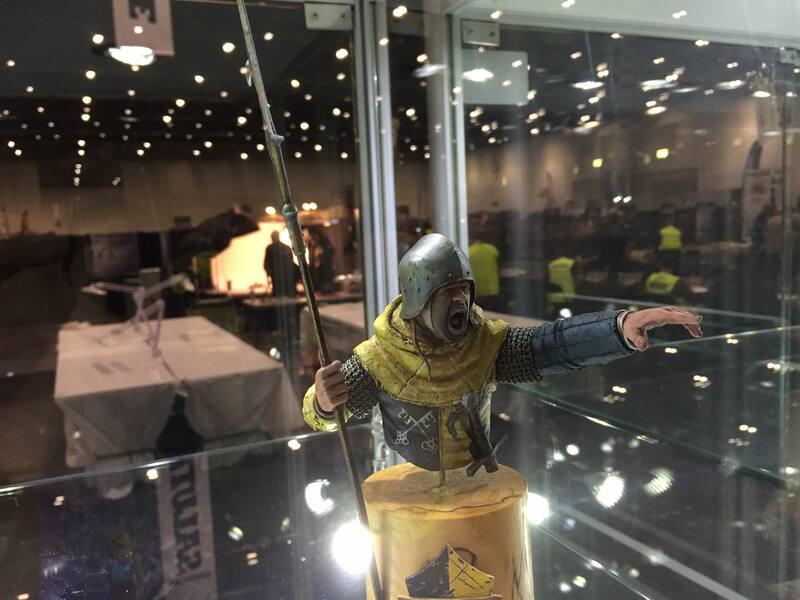 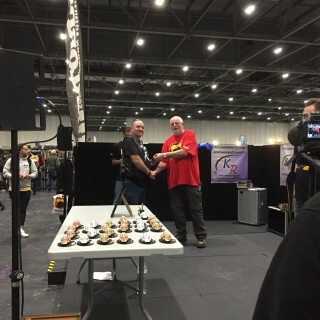 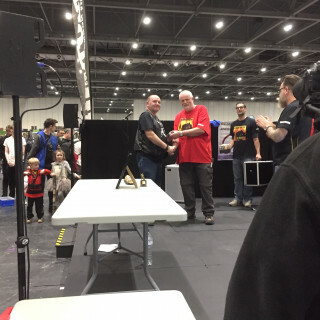 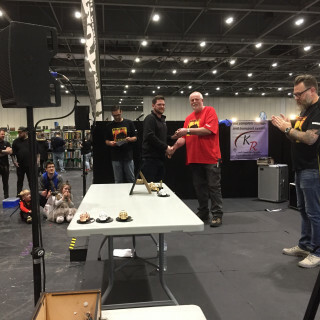 Salute 2019 is over and it has been a blast! 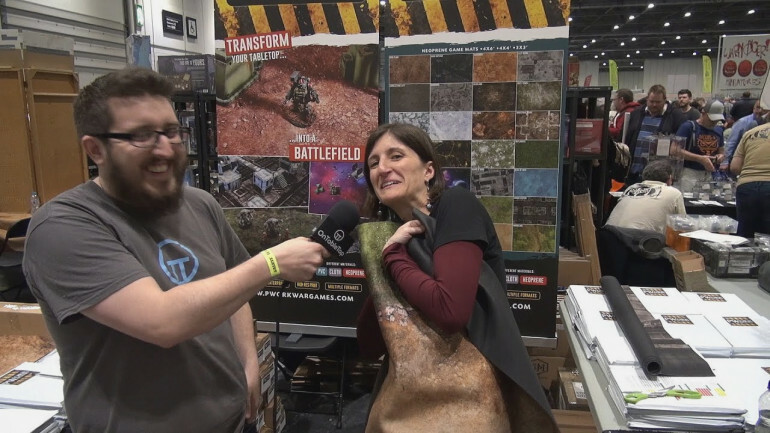 Hope you all enjoyed our coverage this year friends. 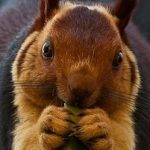 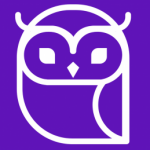 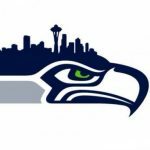 Don’t forget to comment on the posts where you can win sweet, sweet prizes. 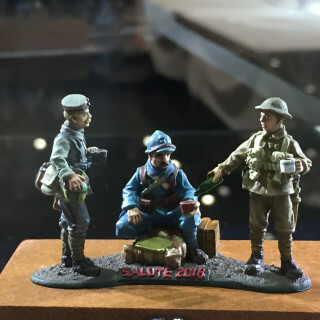 We personally can’t wait until Salute next year. 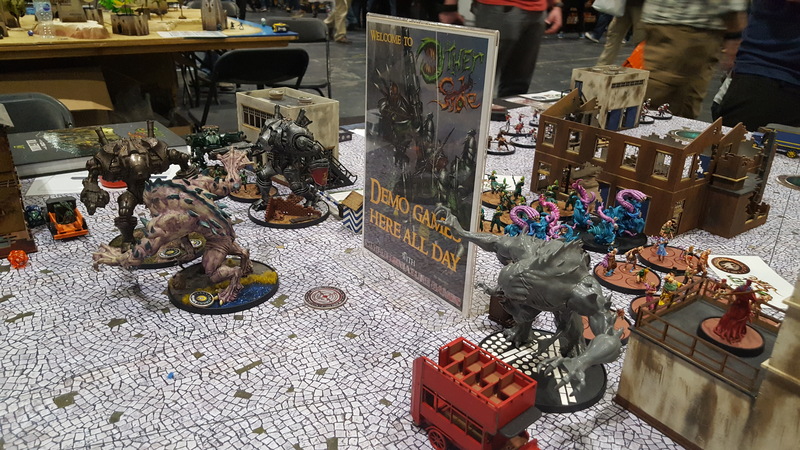 But keep an eye out for us when we storm Birmingham for UK Games Expo 2019! 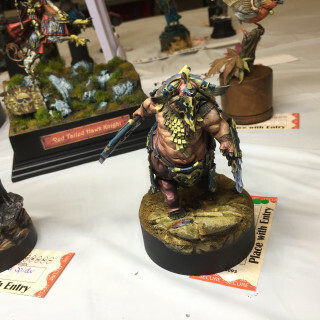 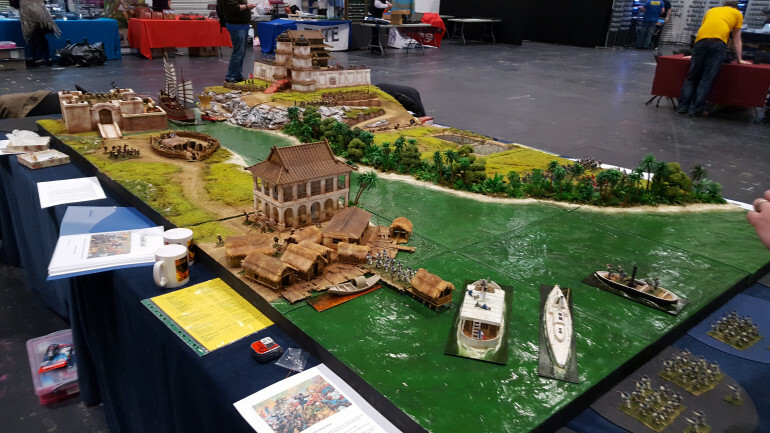 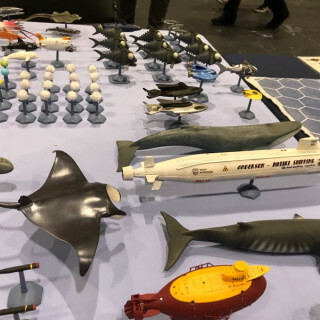 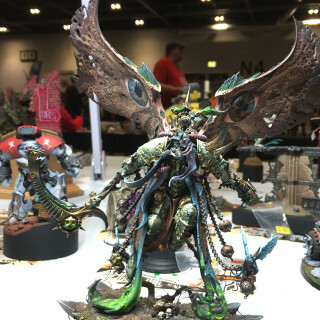 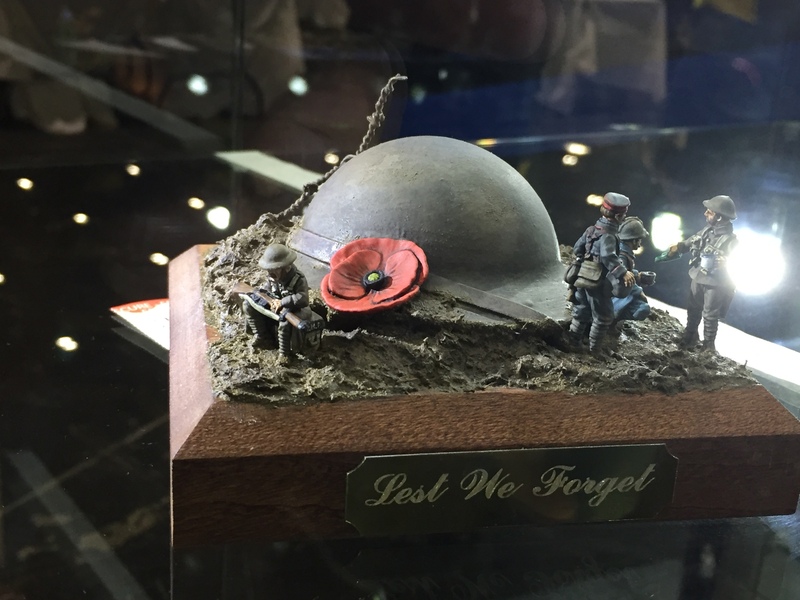 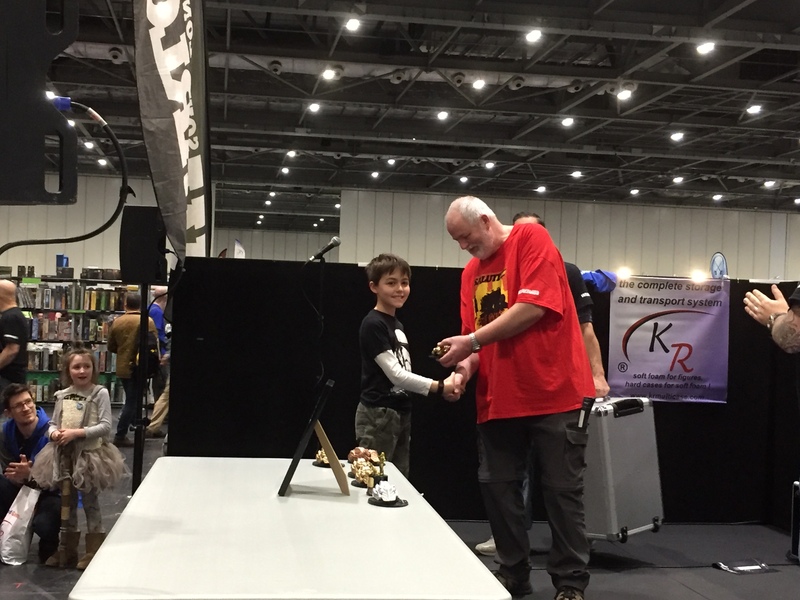 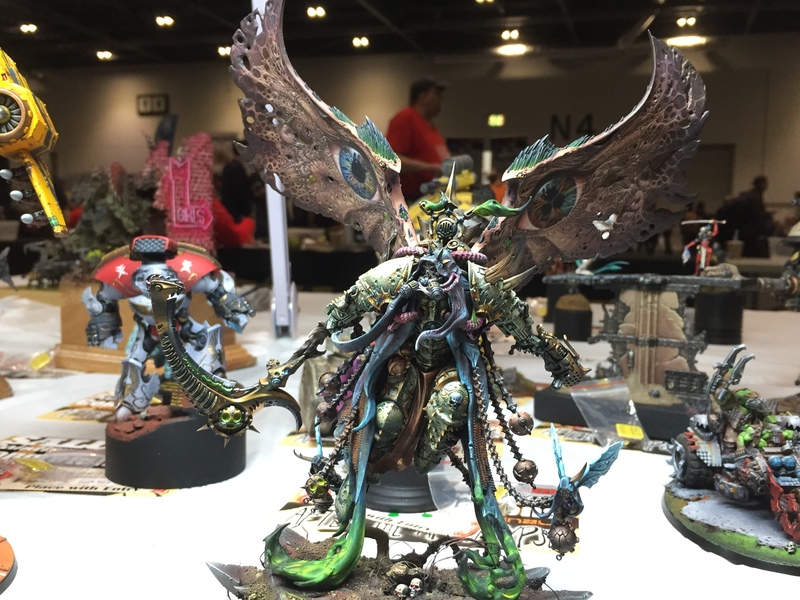 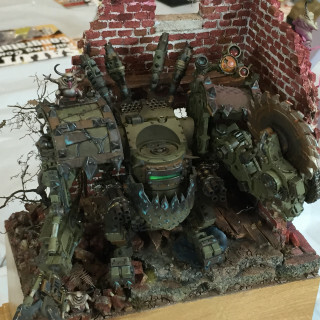 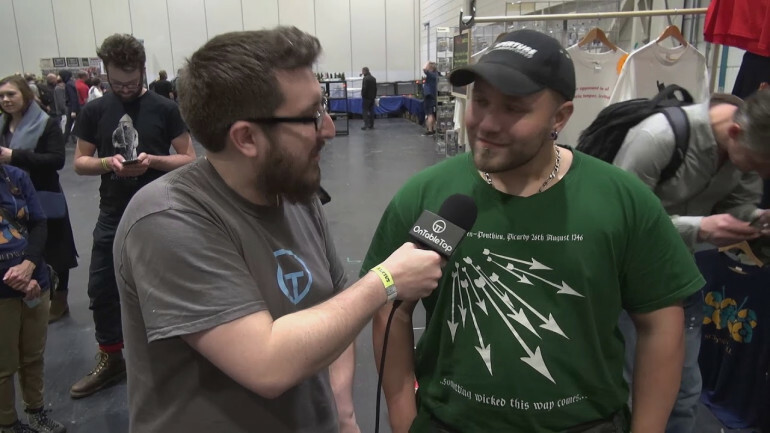 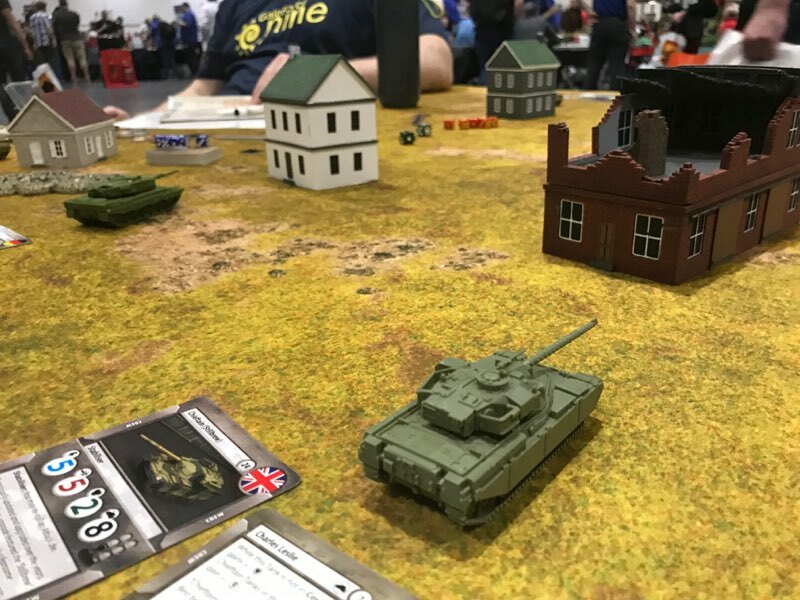 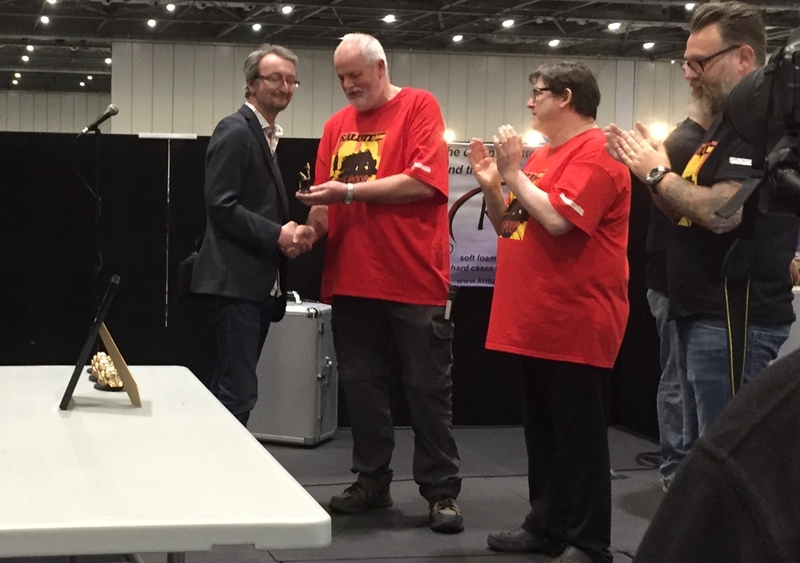 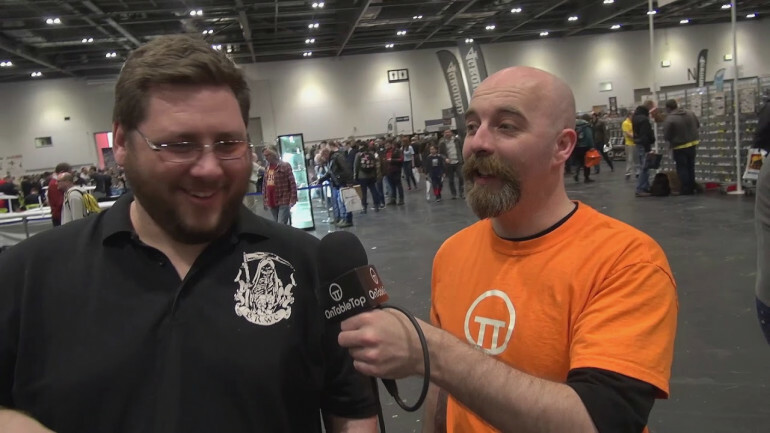 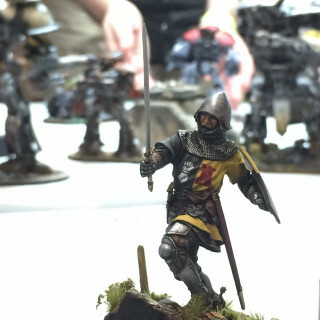 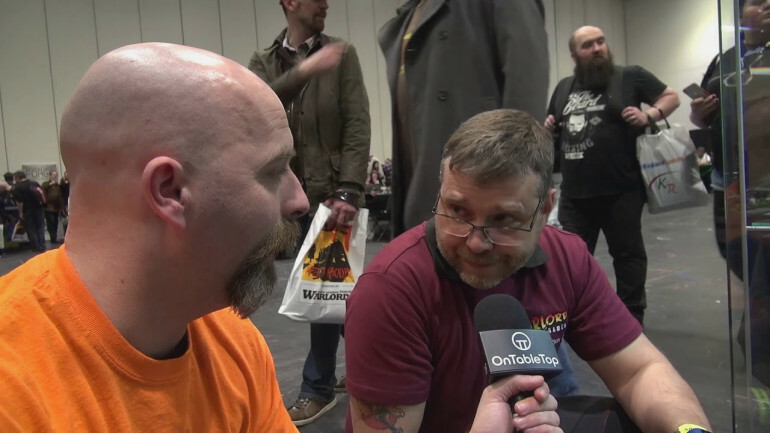 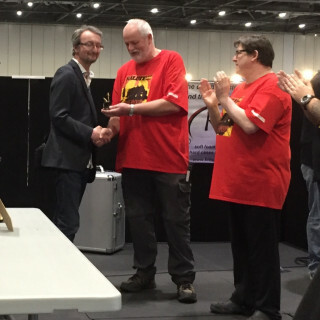 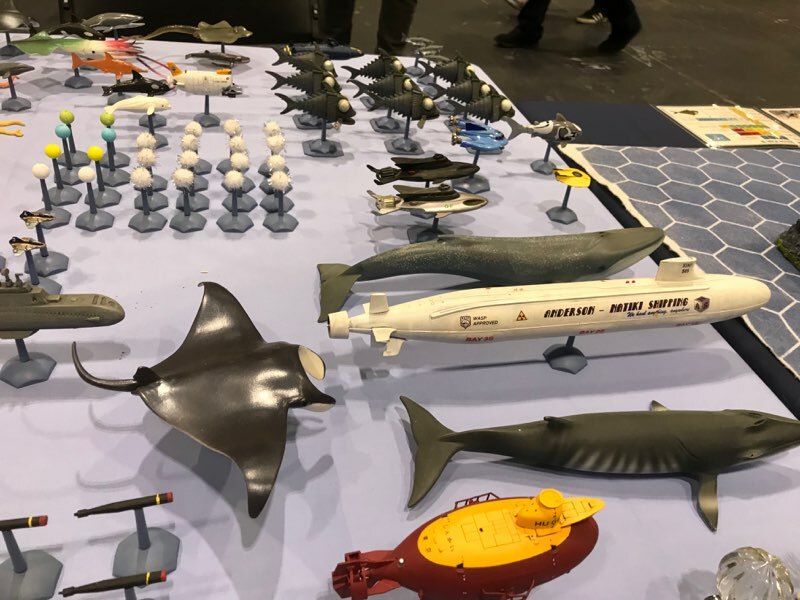 What has been your favourite bit of Salute 2019? 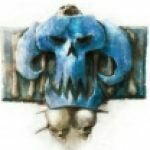 3 Warcradle, just all of Warcradle! 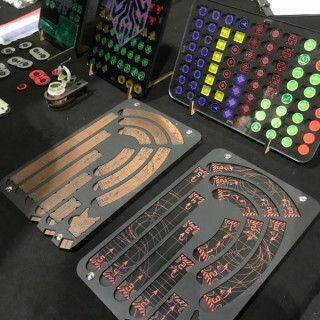 I hope you’ll swing by the Sarissa Precision booth! 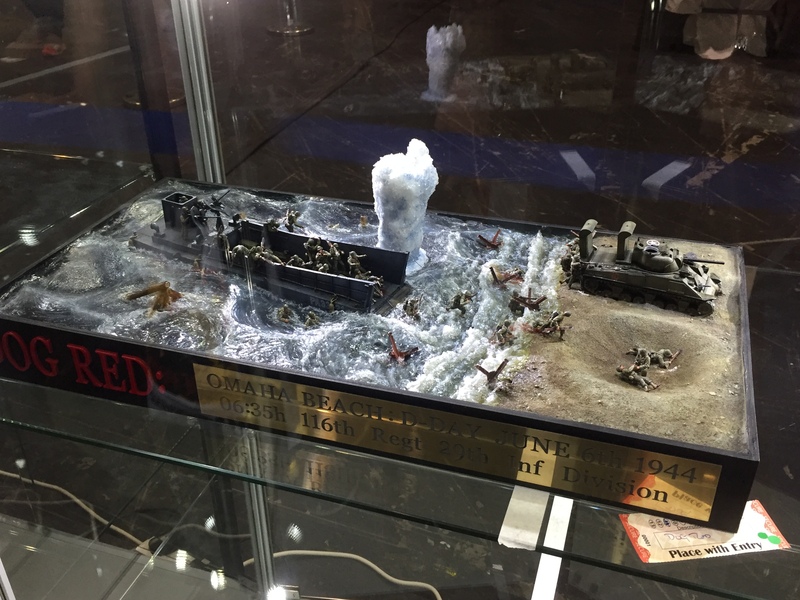 If TT Combat are there, please try to find out about DZC 2nd Edition. 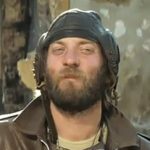 Another evnet full of content? 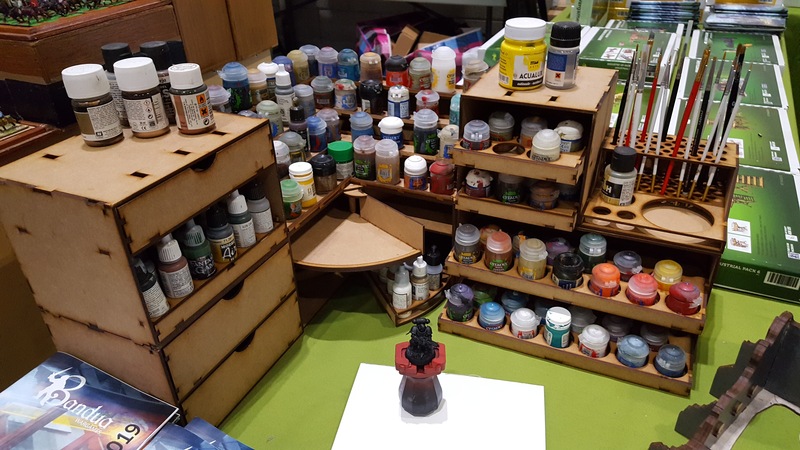 I’ve been busy for a few weekends now and don’t have a full weekend free until the bank holiday. 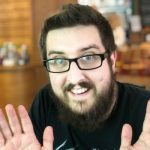 Normally I’d say you don’t make enough content but I’ve many hours of backlog and now this? 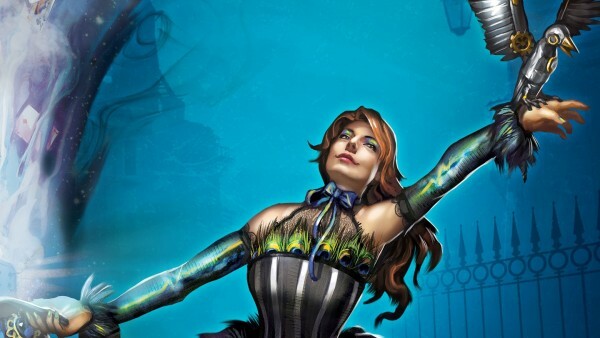 I’m looking forward to it but I suspect I’m going to need the 4 day weekend to finally catch up on everything. 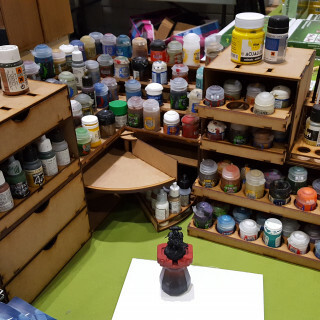 That gw paint pot holder is completely unnecessary yet completely needed at the same time. 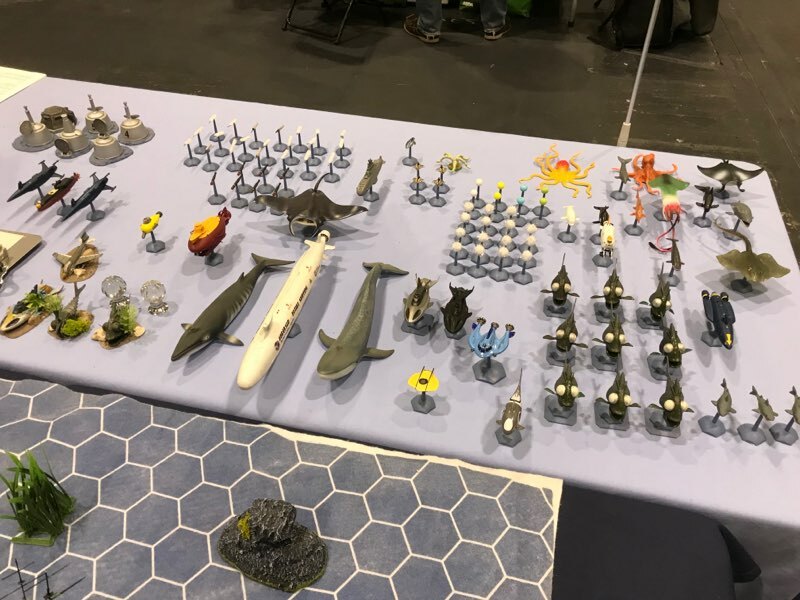 I’d love to hear some from TTCombat, I know they announced Battle Earth for dropfleet commander, but I’d like to hear more what they are doing with Dropzone Commander. 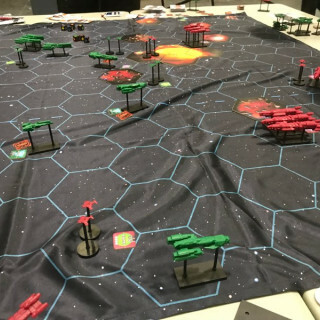 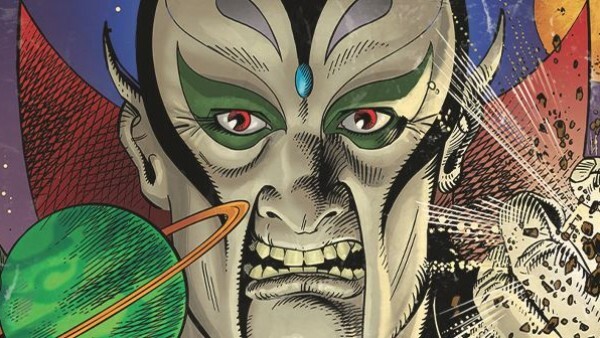 Isn’t the “battle earth” book both DZC v2 and DFC? 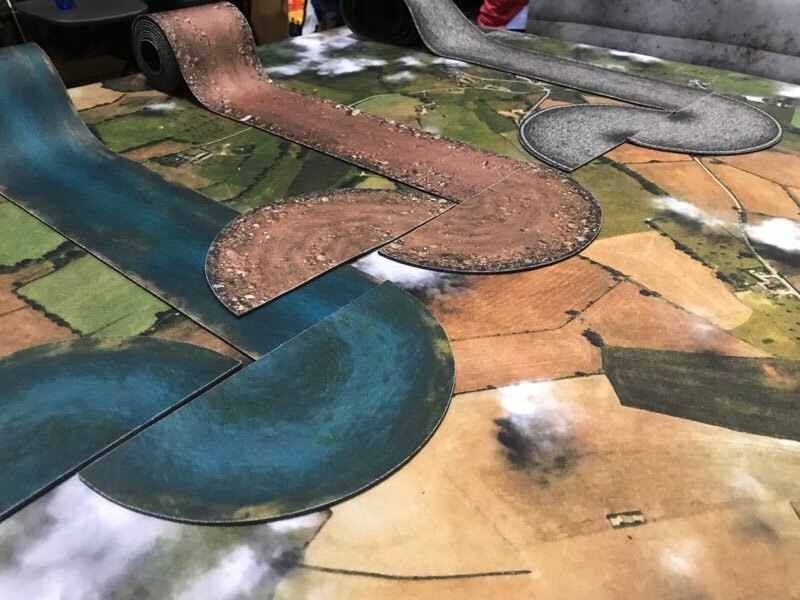 The deep cut mats look great as always! 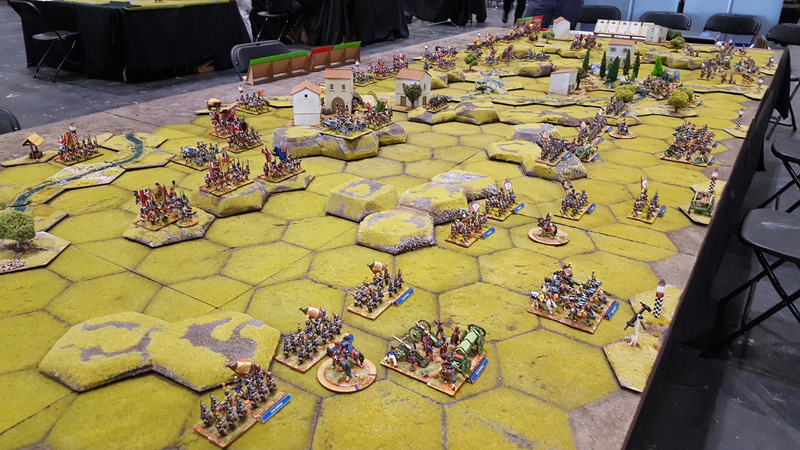 The moonstone boards were amazing and packed all day too – lots of good vibes about that game today. 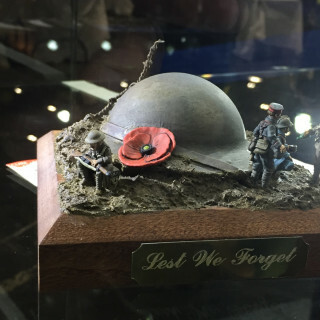 Sadly I missed it this year was working and couldn’t get out of it. 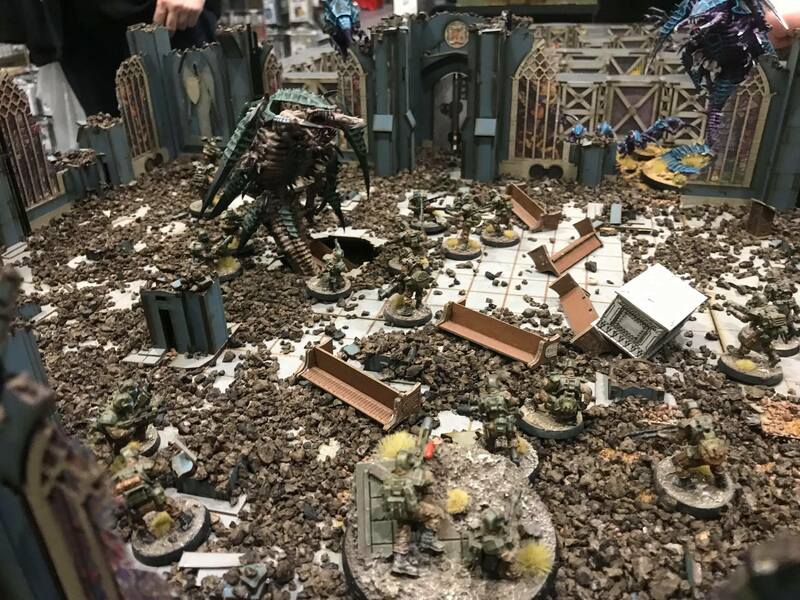 Looked great though. 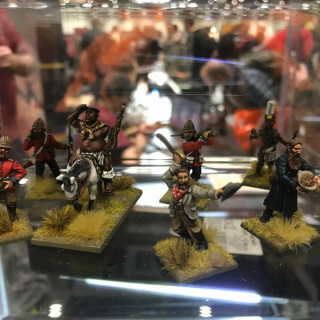 Really great looking miniatures. 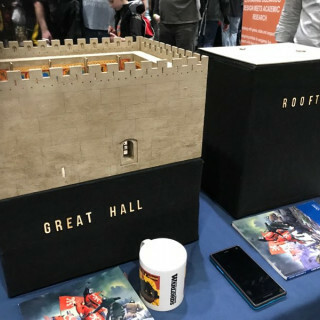 I wonder how the gameplay was. 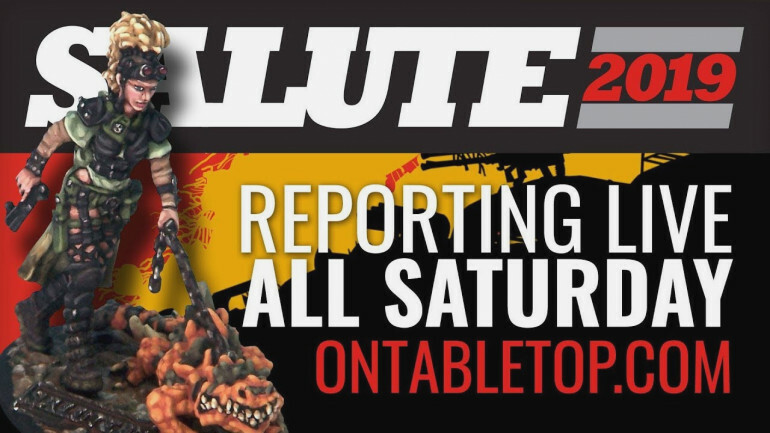 Just an idea not sure anyone will see this, but for events like this could all the video content be put into a playlist or something either here or youtube? 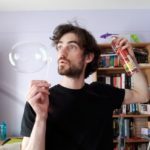 often I play the videos whilst doing something else so it is nice to just have them all play one after the other rather than having to keep change blog post. 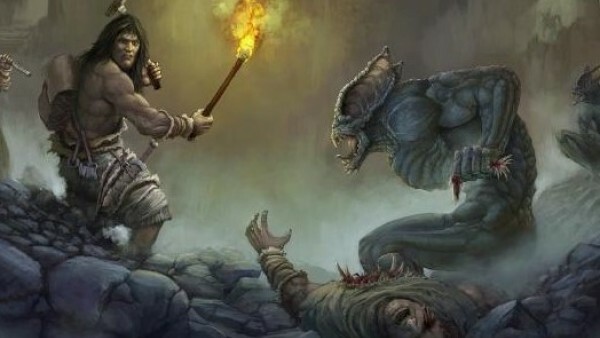 Just an idea. 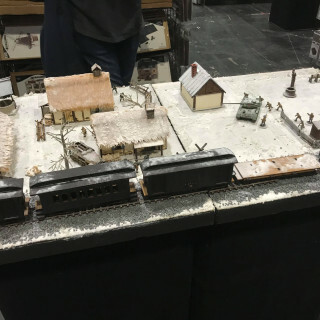 Looks like another great show this year. 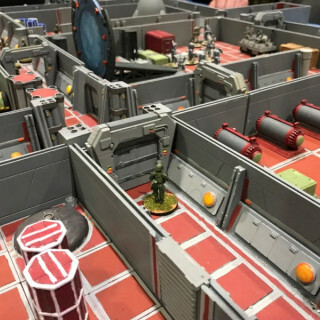 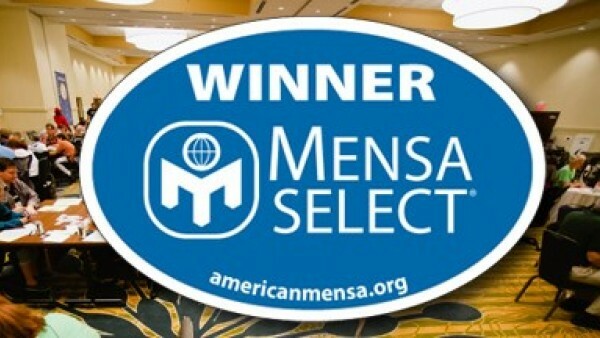 Another well-done con. 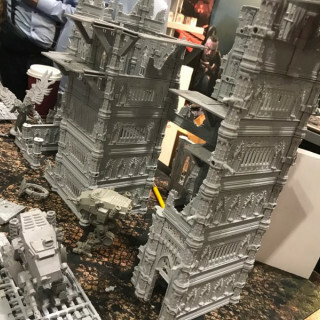 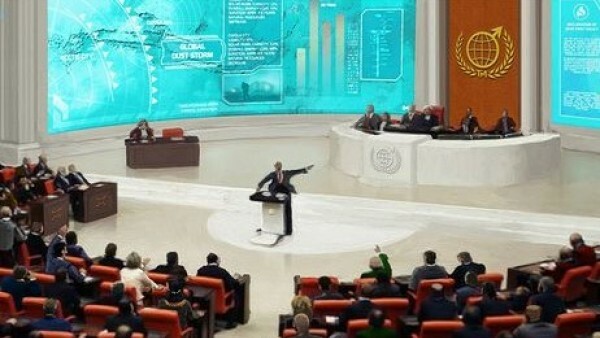 Thanks for all the news and pictures of outstanding tables and models! 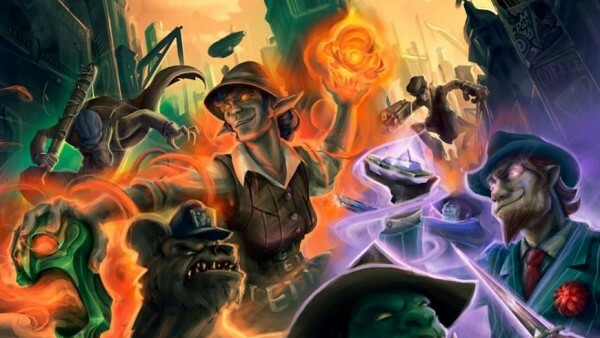 Good coverage guys, even though I was there not enough time or energy for everything , you seem to have caught a lot I missed.